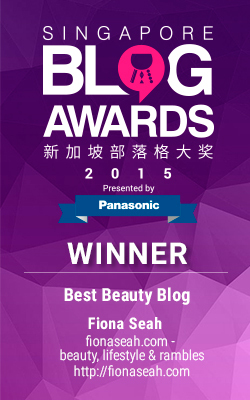 Welcome to my new blog layout! I figured the previous one was a little too pink and juvenile so I decided to change to a neater and more neutral-themed one. 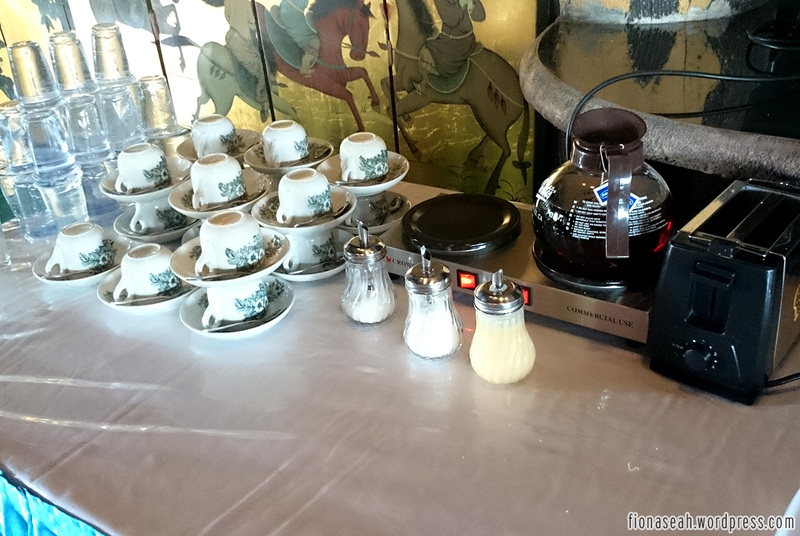 I absolutely love how my pictures appear larger in my posts and how the font is more readable now. I know my header (copied from my previous layout) now screams for a lot of attention *embarrassed* so I’m gonna change it soon. Just bear with me in the meantime and scroll down immediately to my first post once you’re on the page next time haha. Oh and you’re not required to click “Continue reading” to view the whole post already. Yay or nay? The purpose of this entry is to share with you guys a few ways to earn some quick bucks on the net or on the go. You can read this entry wholly with confidence because this is NOT an advertorial thus everything here is completely objective. I have personally visited these sites and downloaded these Apps and most of them did pay me some cash hehe. Being the generous person I am, I want to share the good stuff with everyone! However you need to possess these qualities for the plan to work: contentment, perseverance and a whole lot of patience. You’ll understand why as you read. Most payments are made through Paypal online by the way, so do ensure that you have a Paypal account before you claim your money. I know, I know. 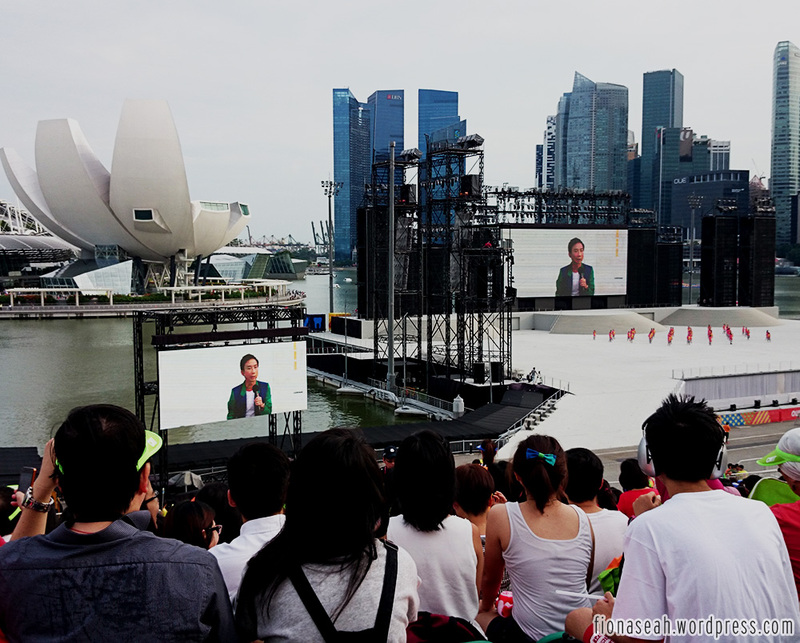 Singaporeans shun pollsters on the streets so why would anyone do surveys online? 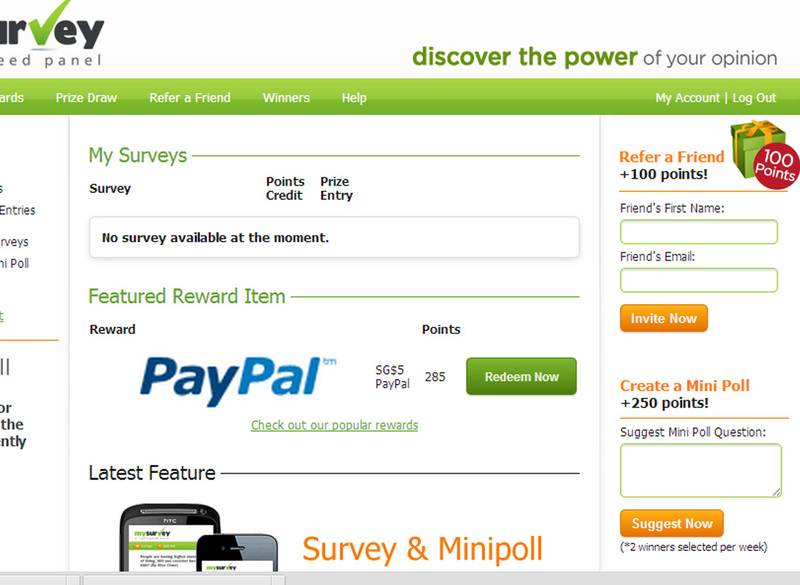 Simple, you get to earn points for every survey you complete and these points accumulate to get you the cash. There are plenty of Singapore-based survey sites and my advice is to register for as many of them as possible (first evaluate whether they are legit). This is because you may not qualify demographically for certain surveys you are invited to participate in. Registering for more sites widens your chances of getting more surveys. The more you do, the more points you earn and the faster you can cash out your money. Other than taking surveys, some of such sites may also give you points (and it’s usually a lot) when you invite friends to join the portal. They will be given a unique URL linked to your account and the points are immediately credited to you upon their registration. But please, seek consent from your friends before doing so. Don’t be a spammer. What I like about this site is that its full surveys are usually tagged with a lot of points ranging from 100 to as high as 900 depending on the their length. However those with incredibly high points hit their quotas very quickly and are usually meant for working professionals (you can work your way around that *wink*) so I hardly ever get to take them. There are also quick surveys available for you to earn some points (5 points each) when no full ones are available. The minimum amount of points to cash out is 500 for S$5 (click here for prize redemption list) and trust me, it’s achievable though it’d take you at least a month. So far I have already earned S$20 from iPanel (excluding the S$9 in my account currently) and I offset one of my online shopping bills with it 😀 You would receive at least an invitation each day but you gotta be fast before the slots are snagged up. I don’t advise clicking on the survey link in the email because every time I do, the points don’t get credited to me so perhaps going directly to the portal is a better and safer way. However, as suggested earlier, most companies look for a specific demographics in their surveys thus if you do not fit into their parameters, you will be kicked out midway through the survey (usually during the screening stage). iPanelonline would still reward you some points (1~5) for your effort. Like iPanel, Ann and Kate has many surveys for you to take each day albeit tagged with lower points at 5 on average (small-scale surveys). The ones with higher points (>100 points) are usually experiential surveys which require you to post pictures or give detailed responses about your day-to-day activities but that don’t come very often. Besides, with just 5 points tagged to most surveys, it takes a relatively longer time to be able to cash out your points because the minimum amount you must have to do so is 500 for S$5 (click here for prize redemption list). I was pretty active there for about 2 months and I only managed to earn 197 points. Then, I kinda gave up HAHA. So unless you have a lot of extra time to spare, I suggest to devote more time to iPanelonline instead. I earned my points from MySurvey through referrals (shamelessly invited my boyfriend and mother – that’s how I got my first S$10) because firstly, they don’t have much surveys to begin with (or they probably do, just that I’m not informed through email -_- ) and secondly, they actually reward more through their referral programme. On top of that, if you’re really desperate for money you can suggest a mini poll question. If your suggestion is selected, you get 250 points! But that depends on your luck. I like Toluna’s interface – it’s neat and user-friendly! Most importantly, it rewards newly-registered users 500 points immediately. You will also be prompted to take 5 surveys about yourself and very easily, an additional 255 points is yours! Have more time to spare? Take profile surveys and earn 100 points for every one you complete! There are A LOT of them so hitting 2000 points on your first day of registration is possible 🙂 However to cash out the minimum sum of S$10, you need at least 20000 points. No points will be given if you refer a friend so I guess points are purely earned through surveys. I’m still pretty new to this site so I’m not sure about the frequency of the surveys but I haven’t gotten any invitations so far since my registration 3 days ago. That could also be due to my incomplete profile which possibly failed to warrant me any survey. This is another site which I was recently introduced to and I’ve already received quite a number of invites! Unfortunately I’ve been really busy lately to do a lot so I’m still stuck with 2 “EPoints” earned from completing my first 2 surveys. As far as I know, AIP rewards only ONE point for each survey and you can only redeem these points for vouchers (NTUC and more – great for housewives). Yes, it’s really meagre, but you only need 150 points to redeem. That’s 150 surveys; it’s not that difficult to achieve as compared to some sites mentioned above if you ask me! In general, you’d need to spend a much longer time on surveys before you could see cash in your bank. BUT if you’re determined enough, it WILL happen! So don’t give up, yeah? I’m sure many people would associate “tryvertising” platforms with samplestore.com but I personally don’t like it because it’s not entirely free. I have an account with SampleStore but I haven’t really utilised it so far because meh, you still have to pay a handling charge (unless it’s sponsored). Like surveys, I strongly believe that one shouldn’t be paying to voice her opinion (and indirectly promoting the brand on her blog) so if I have to pay for something that is supposedly free, I’m out! But I have better platforms for you girls and guys alike if you love trying new products! SYRES is a French research company founded in 1995 that carries out consumer tests on behalf of leading skincare and cosmetic corporations across the globe. 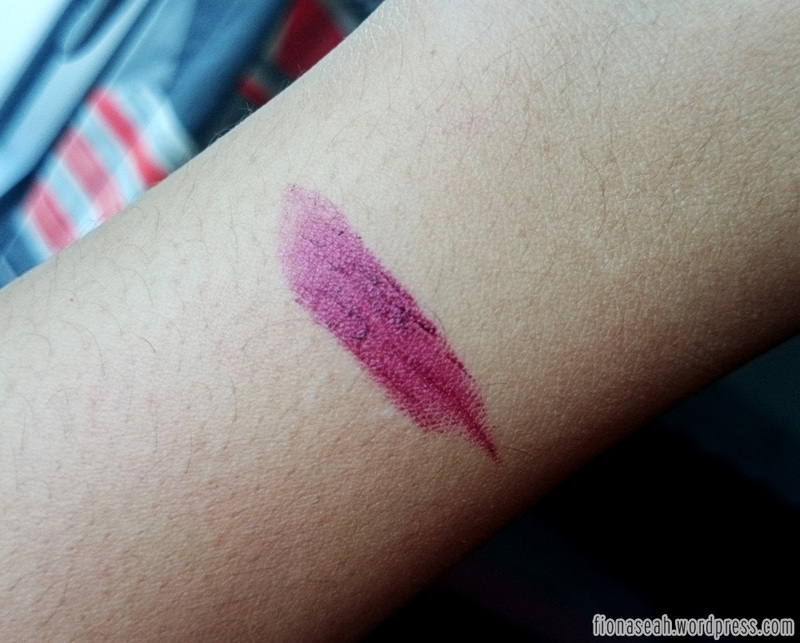 They had conducted several beauty tests for products such as mascara, loose powder, eyeliner and lip gloss. To join, you’d need to fill out an enrolment form that asks about your skin type so you can trust that the products given to you are suitable for your skin. My skin is rather sensitive but so far, no breakouts at all. I can be considered one of the lucky few to have been selected thrice for mascara and a lip product altogether since my enrolment in February and honestly, these samples (full-sized by the way) are REALLY GOOD. 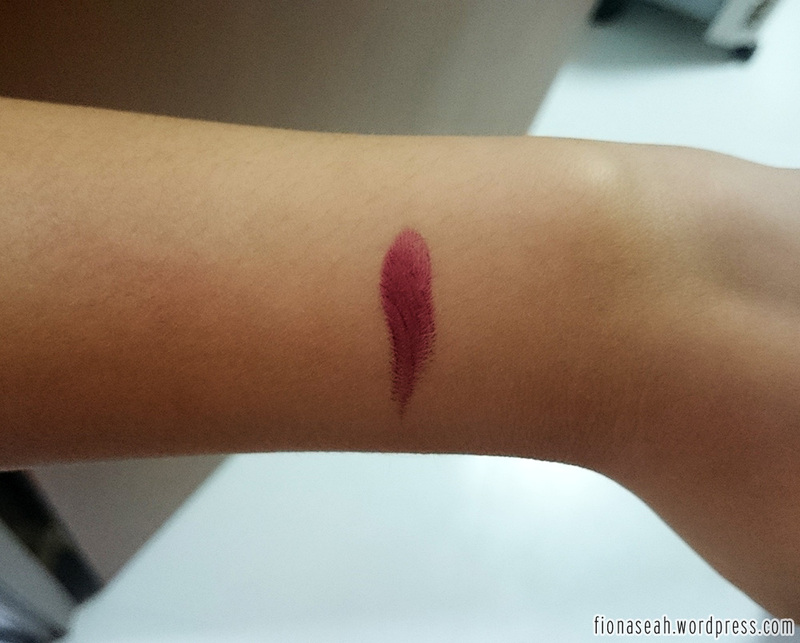 Even after the test had concluded, I still continued using the mascara because it has such thin wand for precise application and it really volumises my lashes. 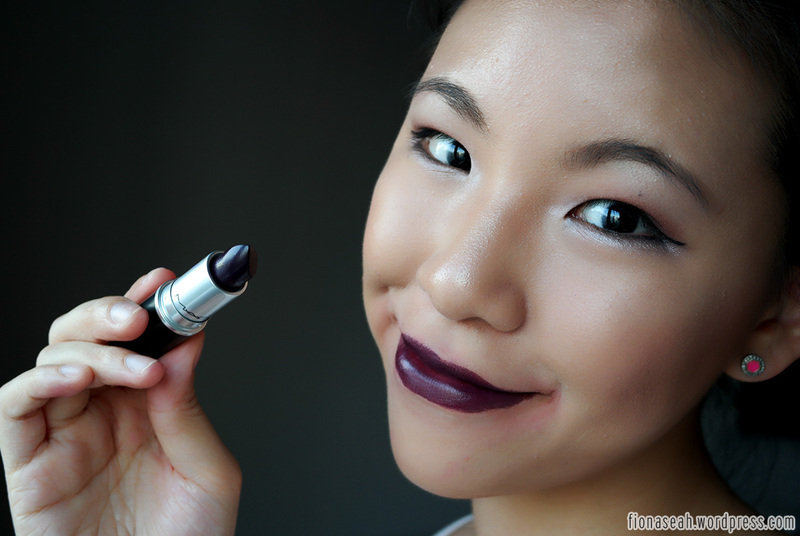 Even though the brands are not known to you, you can be sure that they’re from reputable brands. 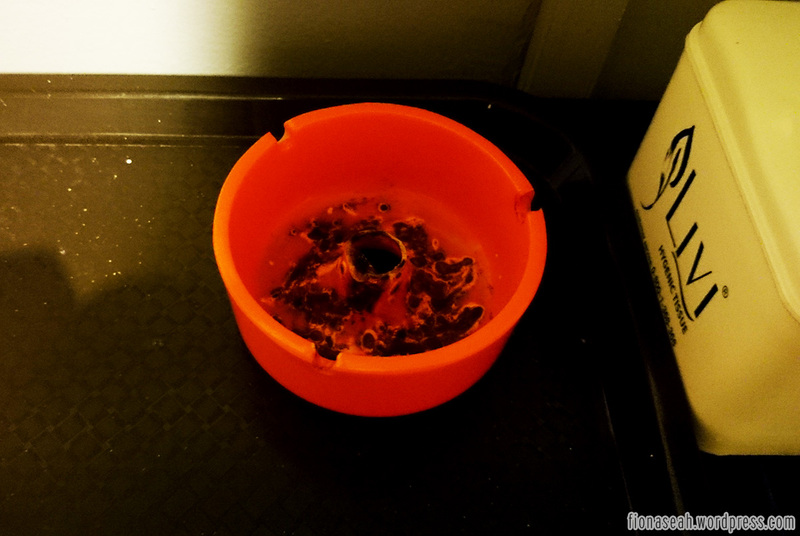 If you really like the product, you can ask for the brand name a few months after the test. If you’re chosen for the test, they’d give you a call. Collection of product is done at SYRES’ Ngee Ann City office, usually either on Monday or Tuesday between 12pm to 8pm. 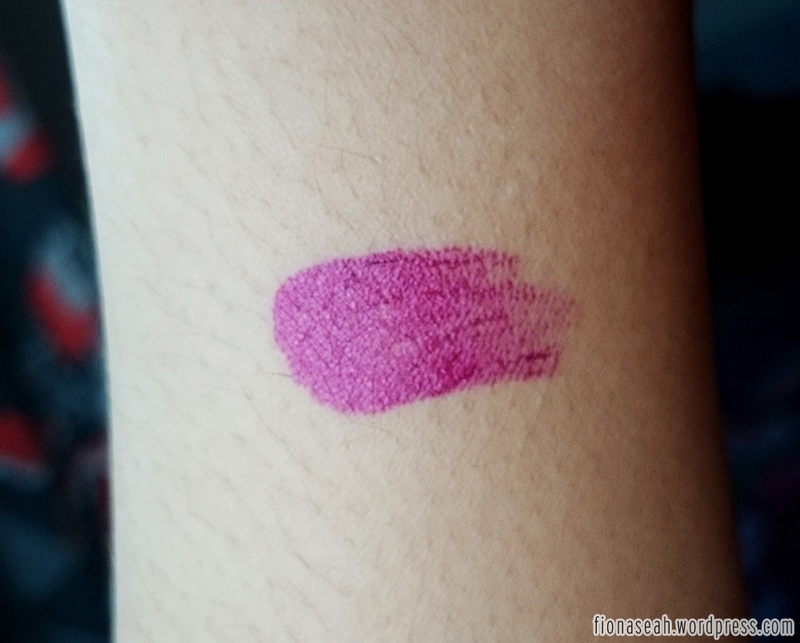 The test usually lasts for a month (I was given a one-week test period for my liquid lipstick though) and you have to complete at least 1 set of questionnaire during use. The best part? You get paid for your participation. 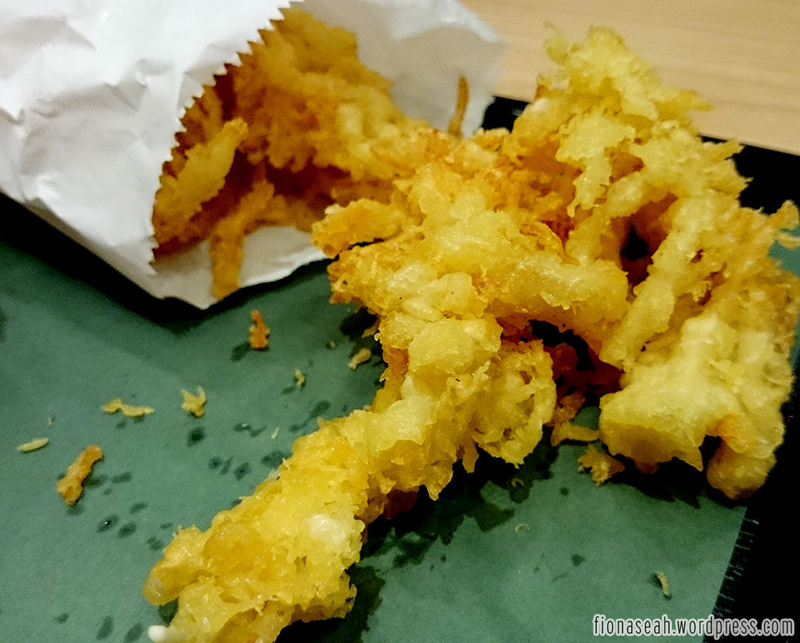 Not in cash, but with two $10 Takashimaya vouchers, also from their office about 1-2 weeks after the test. I have already received 6 pieces so far! I’m sure you can buy something with $60 from Takashimaya. 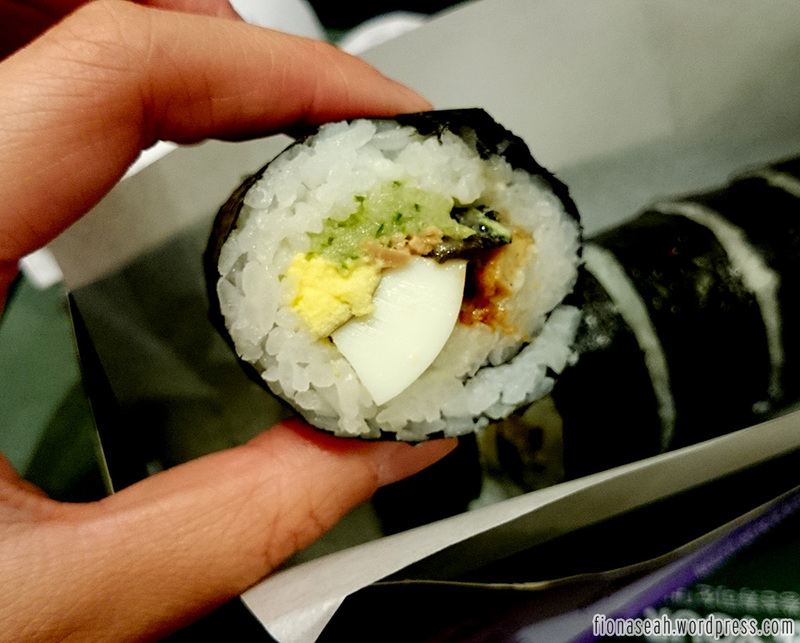 Otherwise, you can always sell them away since Takashimaya vouchers never expire. InFocus pays respondents to share their opinions and thoughts about products, services and a wide coverage of topics through focus groups and they usually work with market research firms. 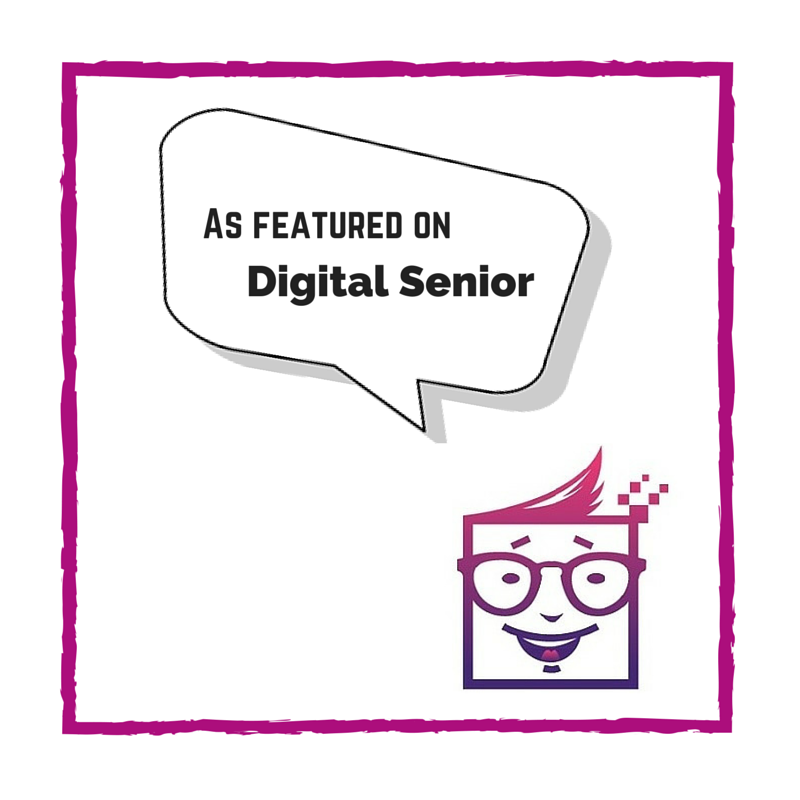 I haven’t personally worked with InFocus because their session timings always clash with my schedule and most of the time I don’t fit their criteria (as their projects are usually for older people) so I am not entirely sure how trustworthy they are. They release new projects once every few months and they seem legit though. I guess as long as you don’t have to pay a single cent, you should be fine. Their Facebook page has over 1800 likes to date. Incentives for participation are a lot higher than taking surveys. You can get paid between S$40 to S$100 per hour just by sharing your opinion! Boyfriend joined a focus group once for KFC (not through InFocus though) and all he needed to do was to eat 3 pieces of fried chicken, and then share his feedback. For that, he was paid S$80! How cool is that?! Apps that pay you for using them aren’t new in the market. The first paid App I know is probably PhewTick, one that lets users earn money by scanning generated QR codes, but it has closed in 2013 along with the points I earned -_- Ever since then, this tactic has become pretty common nowadays, especially in the U.S., to entice people to join them. Some Apps got their money from advertisers while others are probably funded through investments. Regardless of the source, I think it’s a brilliant way to keep the App going and encourage users to actively contribute to it. Flitto is a Korean startup that uses crowdsourcing to get fast and accurate translation in 17 different languages. For every correct translation you make, you earn a certain number of points. Once you have accumulated at least 50,000P/points, you can cash out US$25 via Paypal. Of course, unless you’re extremely multilingual, you gotta wait a long time before you can even see three zeros LOL. There’s a report on an Indonesian girl who earned US$300 a month just by translating from Bahasa Indonesia to English and vice versa. I’m like her, only fluent in English and Mandarin (traditional and simplified) but I get requests like, once in a blue moon 😦 Perhaps because most Chinese are fluent in English as well. I currently have 370P in my account since my join date on 23 July 2014. Also, you have to be VERY quick in your translation because once the best gets pick, no more translation will be submitted to the system. The points (usually 50P) will be awarded to the one who did the chosen translation. If no translation is picked, I think some points will still be awarded to you within 48 hours (I’m not entirely sure about that). You can also use your points to request for a translation. 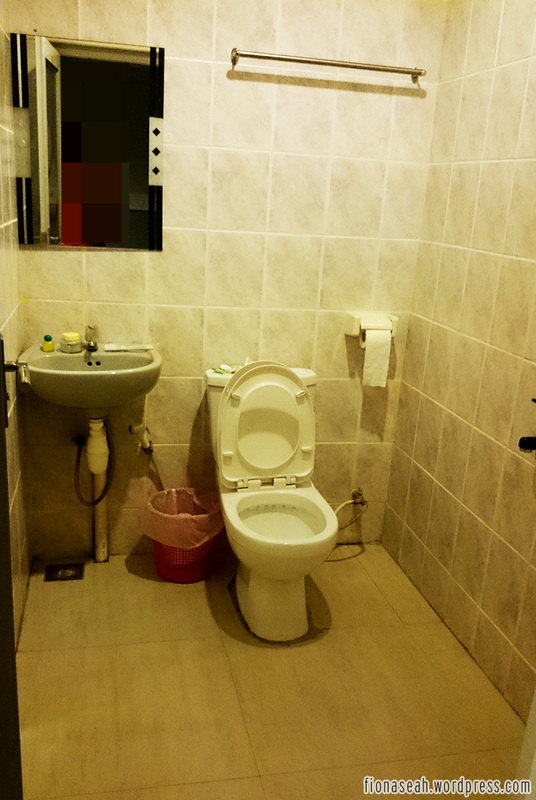 This can be done by typing, recording an audio or snapping a picture (of a sign in a foreign country, for example). A very helpful tool if you’re travelling to a foreign land and you don’t understand their language. Google Translate isn’t as accurate as human-generated translations too. As an active user and reviewer of Carousell, I believe this feature comes as no surprise to many of you. Nevertheless, it deserves a spot in this post because you can still technically earn money by selling your unwanted stuff (which may be gifted to you thus you make no loss in the end). It eases the inconvenience of having to set up a booth at a flea to sell your items but of course, transactions are closed slower when not dealt face-to-face. With just a push of a button, and perhaps a short description and a filter for your picture, your item is put up on sale. 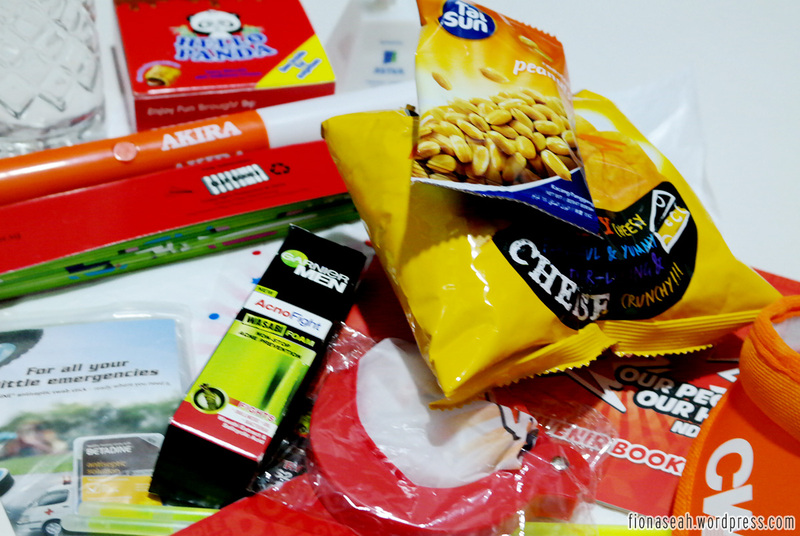 For a more detailed review of Carousell, do check out my post here. 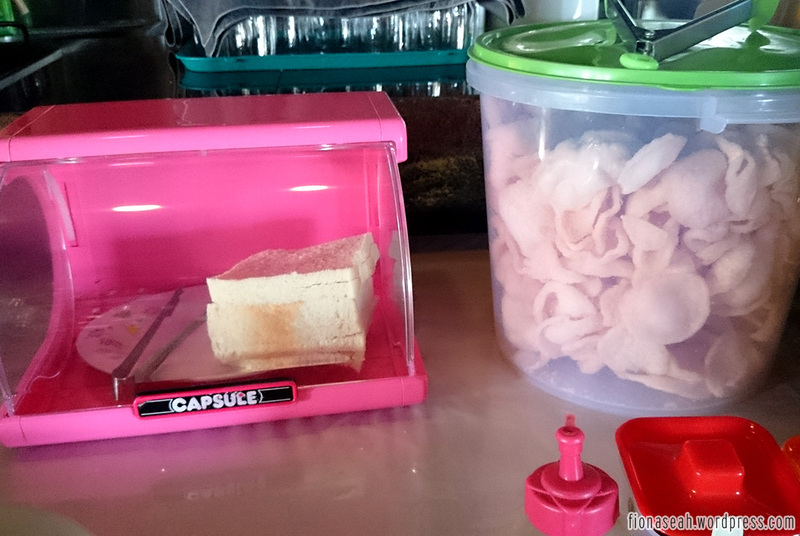 Carousell is where you can see many budding entrepreneurs. Many people actually ship over products not found in Singapore and sell them at a price higher than what they originally paid. Children as young as 12 years old are also using the platform to sell trendy stuff and earn a side income. FreeMyApps is a platform for you to earn gift cards effortlessly. All you need to do is download the Apps (most of them are games) recommended on FreeMyApps, open them and keep them running for 30 seconds. Even if the App requires your registration, just leave it. You really don’t have to do anything else to earn the credits. Once you’re done with the App, you can just uninstall it and install the next (if you’ve space constraints). You only need to accumulate at least 3000 points (not difficult at all as each App typically carries over 100 points, some with 350 points or more) to redeem a $10 iTunes or Google Play gift card. Of course, there are more rewards than just a $10 gift card. Check out their website for more information. And that’s all I have for this section! I feel that it’s due to the small market here that we don’t have as many Apps like that as compared to the U.S. They even have Apps like Gigwalk that pays for completing specific tasks (like walking into a store and recording down something), AppTrailers which rewards for watching movie previews of Apps and GymPact which pays users for working out (but penalises every time you miss a session)! OMG, not fair! Why don’t we have such stuff here?! 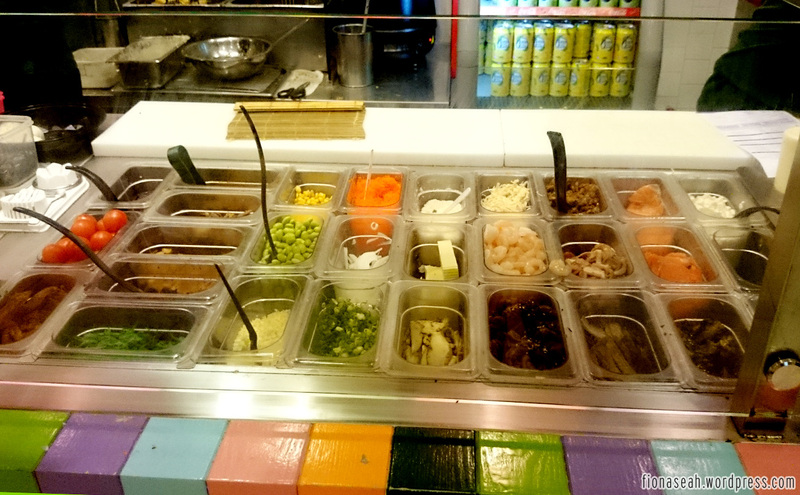 Singapore App developers, why you no create Apps that pay users to run and eat healthy!? I swear I will be fit and slim in no time as I will run diligently every single day, rain or shine. So will many people in this country. Haha. 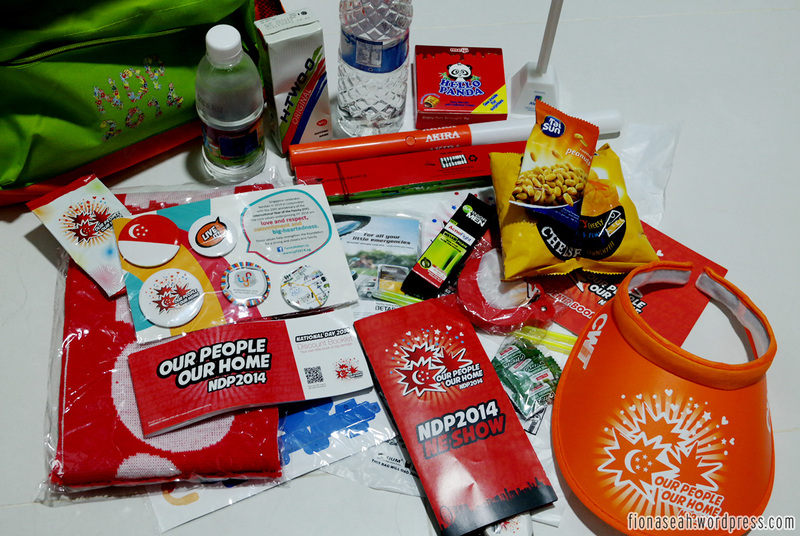 Maybe can get HPB to endorse/sponsor also hor. Not a bad idea right? 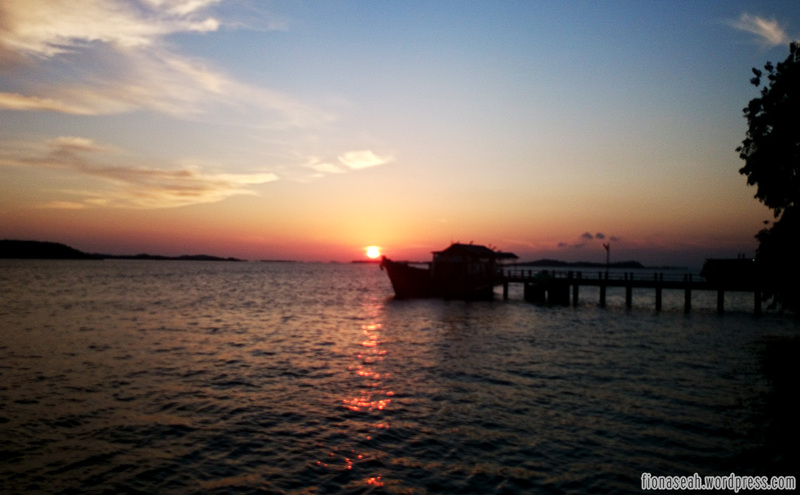 Anyway, those with eidetic memory will recall how much I hated travelling to Batam in my first Batam post. The aversion never left me but my Mom was dying to escape to another nearby country (except Malaysia) thus she dismissed my refusal to go -_- Dad used to work in Batam for a few years and he said he could bring us around. Feeling super excited, my Mom started searching for cheap Batam package deals and eventually bought this from deal.com.sg. Each coupon cost $40 with a one-hour massage and $30 without (not inclusive of S$20 fuel surchage and Batam terminal fee of Rp65,000 per person). Both came with a tour package. Boyfriend tagged along this time (finally got his passport renewed) so we utilised five coupons in total. I’m totally against buying travel packages through deal sites but I didn’t want to go through the hassle of booking the hotel and looking for cheap massage parlour myself. Furthermore we only decided on our trip TWO days before our departure so I didn’t have the time to plan the itinerary (indecisiveness is in our blood apparently). I succumbed to my laziness in the end and got the merchant (Royal Prince Travel) to do everything for us. 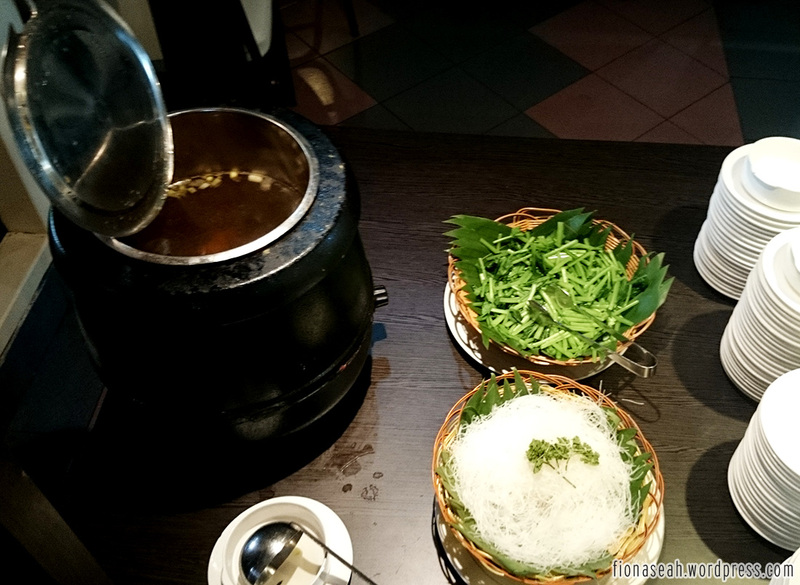 Apart from the small hiccup with the hotel booking (agency got our names wrong – but that was settled in a jiffy), the redemption process went really smooth. 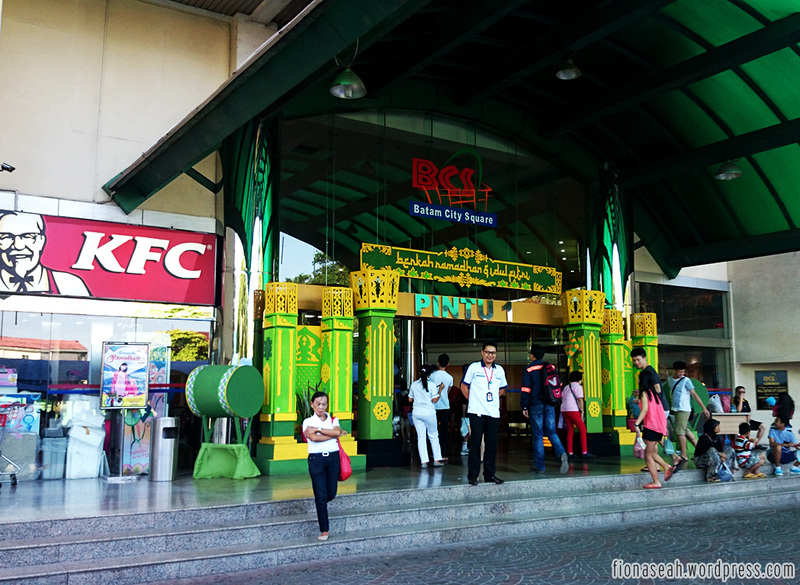 So kudos to Royal Prince Travel for their flexibility and efficiency! 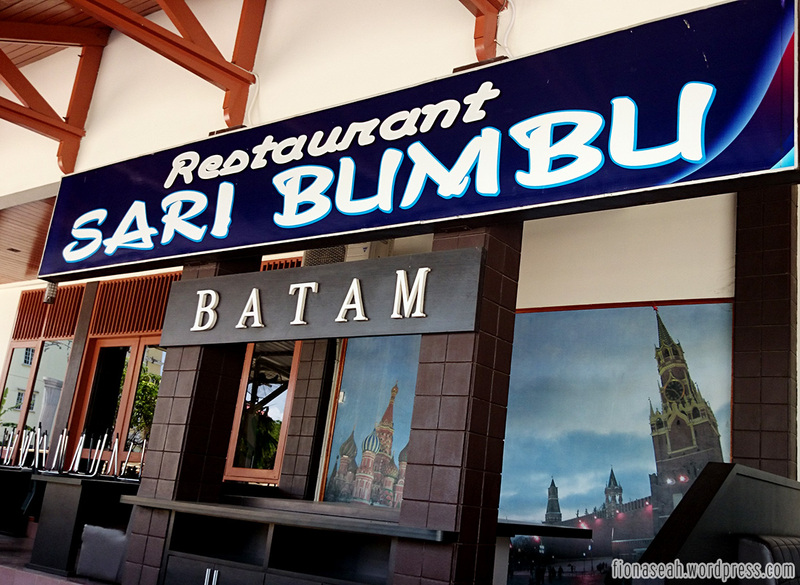 Both our arrival and departure venues in Batam was at Sekupang Ferry Terminal. Our ferries (Pacific Ferry) were very clean and equipped with a reasonably large plasma TV with zero screen disruption. Everything looked sparkling new so I guess it must be a new company haha. We were picked up by someone at the arrival hall but were told to stay put because he was still waiting for the next 2 ferries to arrive -_- So we spent our time idling in the cafe at the ferry terminal until a 7-seater van came for us. 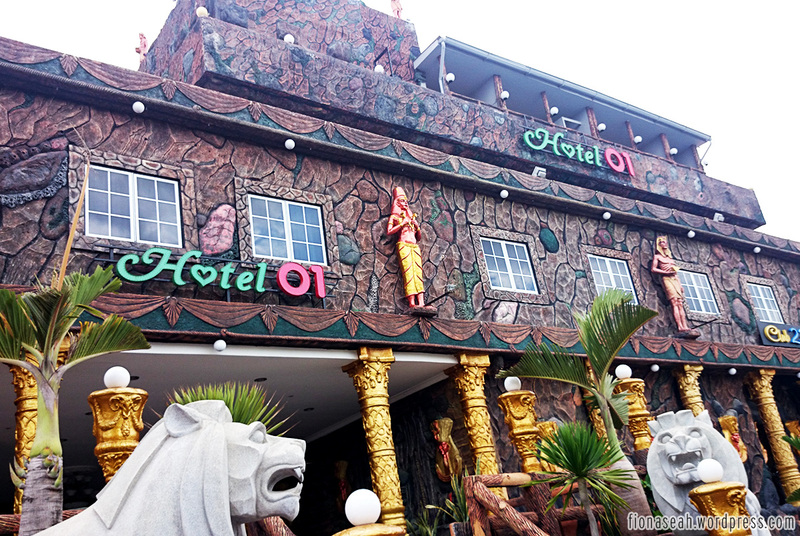 Our accommodation was at the newly built Hotel 01 which claims to be the only themed hotel in Batam. Building exterior. Quite impressive to be honest. 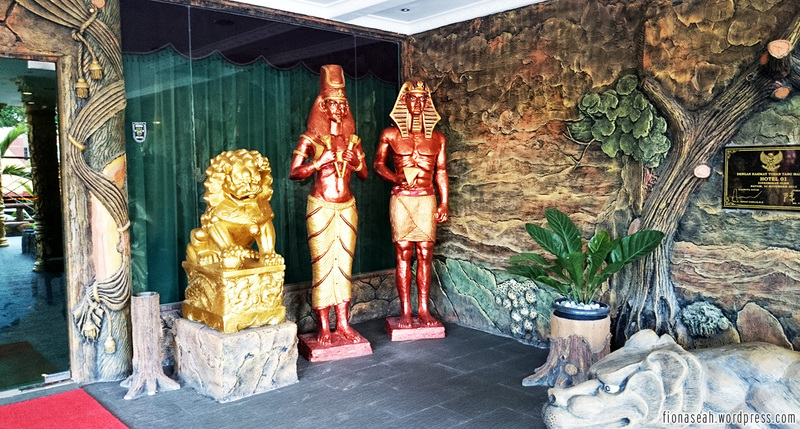 However looks can be really deceiving – Hotel 01 did give that Egyptian vibes on the outside but it was nowhere near the theme when we stepped into our room. Opposite the bed. A very small TV mounted on the wall. Smoking allowed in the room.. 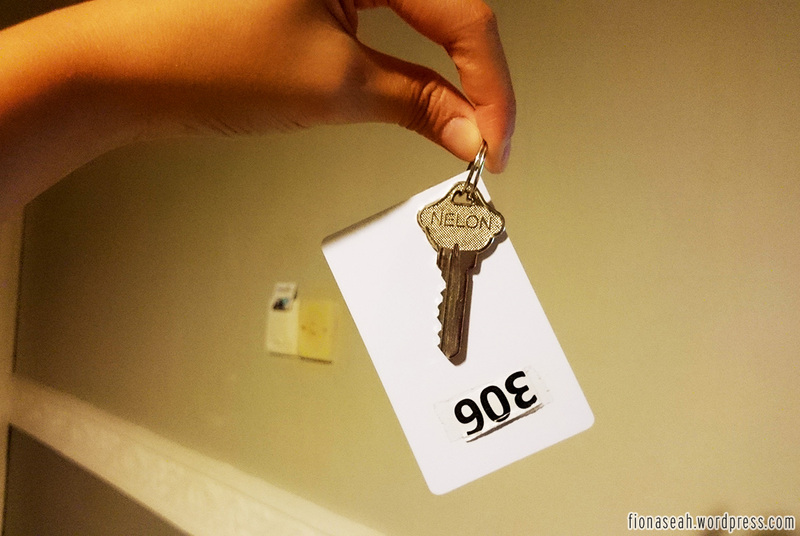 The room doors are not locked with a keycard..
Boyfriend and I requested for a room change twice. The first was because we were given a queen-sized bed (*cough*parents’ paranoia*cough*) and the second was due to an unbearable sewage stench from the room’s toilet. 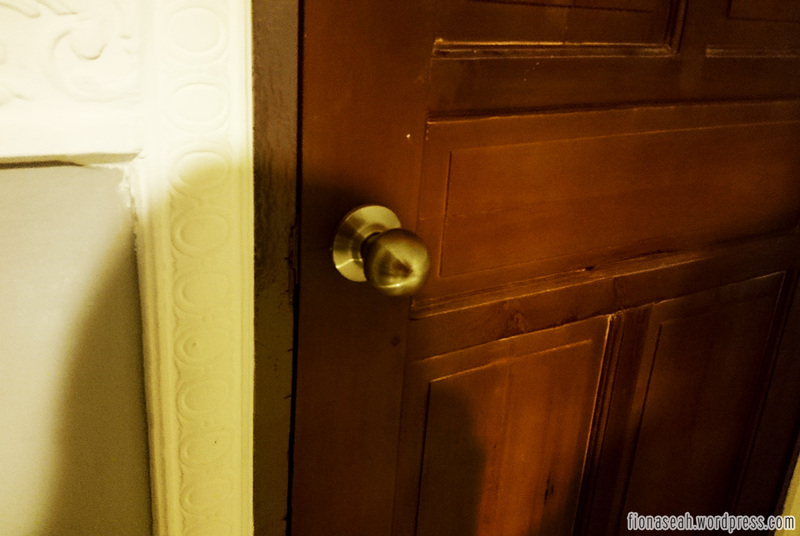 We eventually took back our original room because there were no other rooms available. 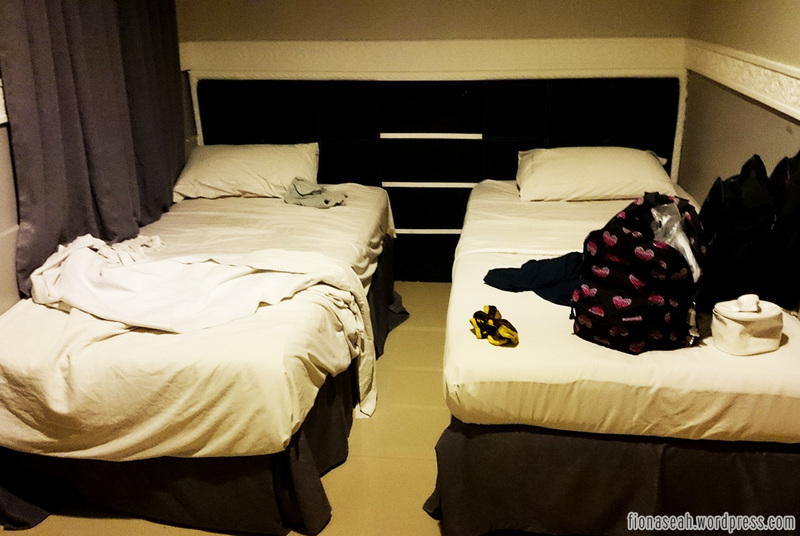 We then did a swap with my parents who were occupying a twin room with an extra bed for my sister. It was also a huge mistake, as there was zilch Wi-Fi reception in that room (in fact all rooms with number 30X along that row have no WiFi reception. Only rooms 313, 314 and those near them have the strongest Wi-Fi connection) and we even encountered a cockroach on our first and only night there! Holy crap, that’s a first for me. One of the bath towels and comforters were also stained with shoe prints. Oh gosh, please let me pull through this one agonising night, please. But I must say, the lady at the hotel reception was really nice and obliging. I was half-expecting her to be annoyed at our demands but she never did. I also had to call the concierge to loan a hairdryer because it was not provided in the room. 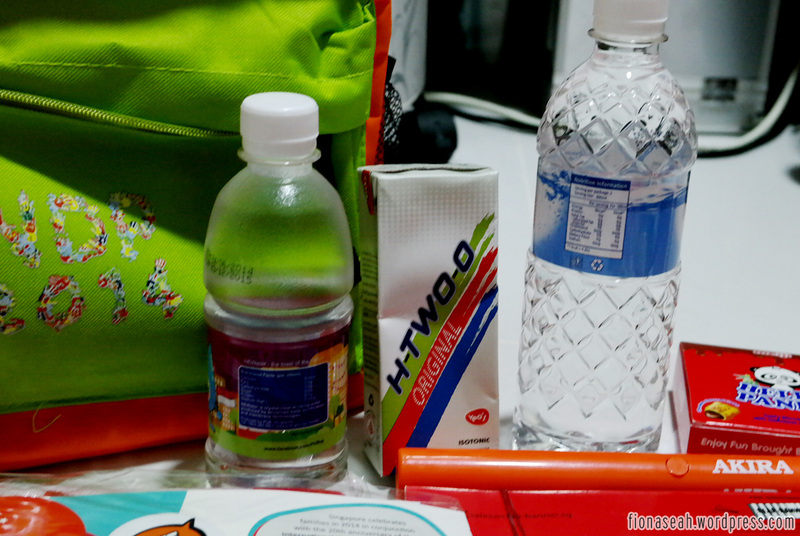 Other toilet essentials like toothbrush, toothpaste (no shaver and comb) and soap were provided though. TV reception was sucky.. No channel (not sure about their own broadcast stations coz we only watched movie channels) gave a clear image. 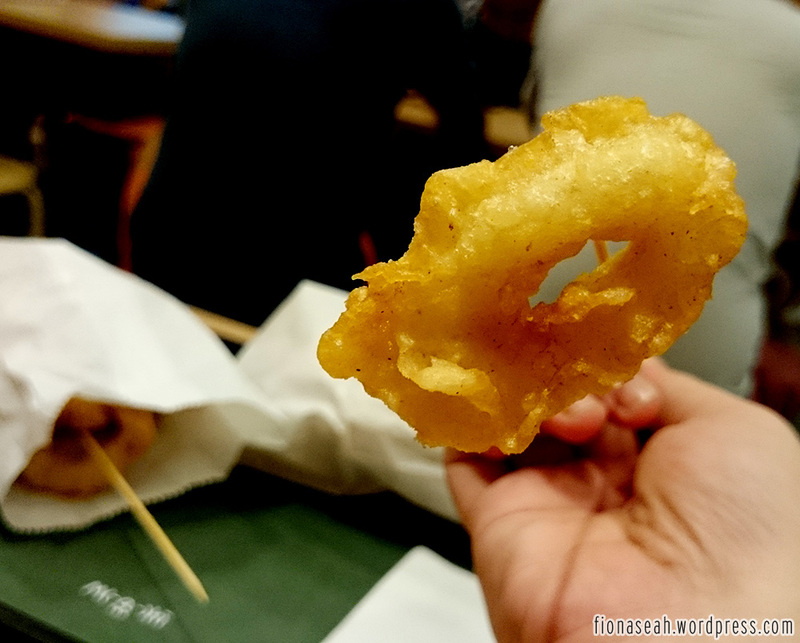 The first day was free-and-easy for us so we did a little shopping at Nagoya Hills Shopping Mall. Got our A&W craving satisfied and bought 6 big packets of sanitary pads HAHAHA Seriously, the sanitary pads (suitable for extremely heavy flow – 35cm in length – lol I’m so specific) were SO CHEEEEEAAAP like what, S$1.30 for a packet of 16?! If I could clear the shelf, I totally would! 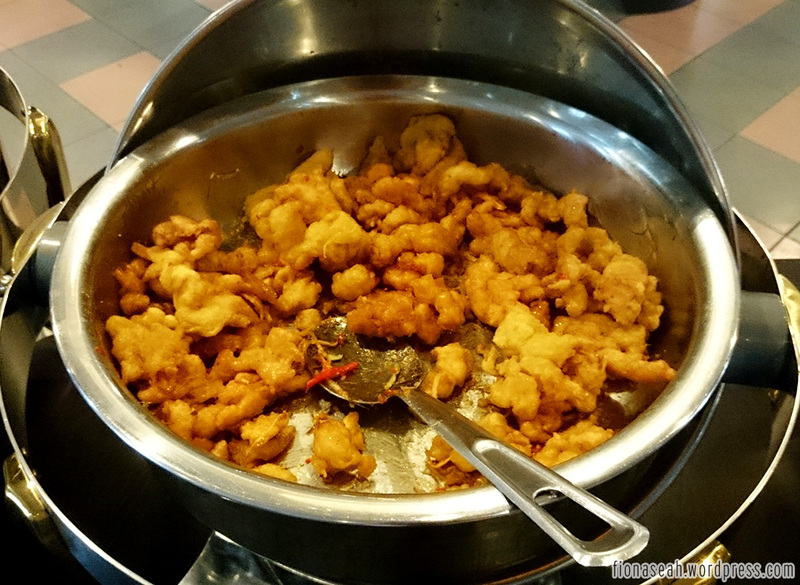 We had dinner at Golden Prawn 933. 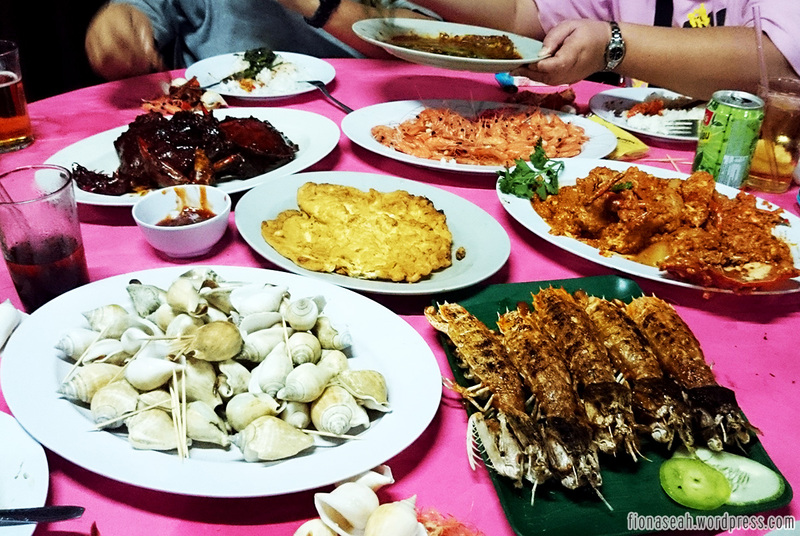 Dad was probably in a severe state of seafood deprivation that he ordered mini prawns, Mantis Prawns and FOUR crabs (cooked in both black pepper and chilli). I only wanted my Gong Gongs. 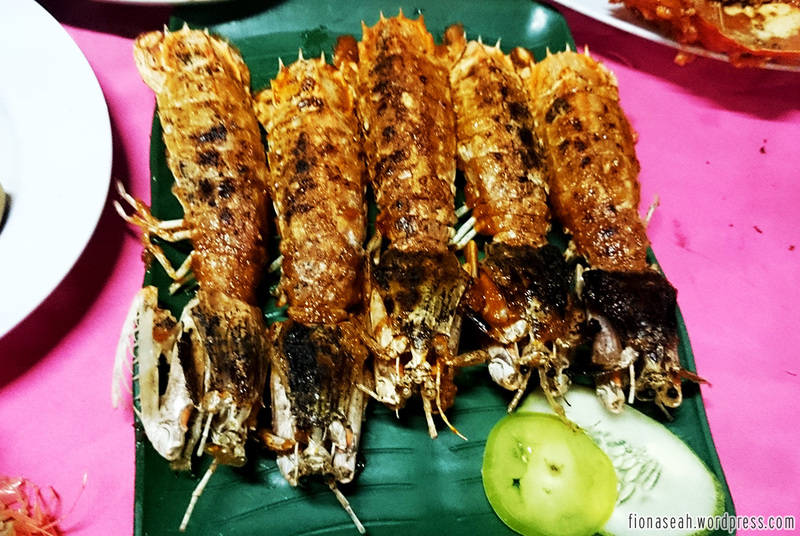 5 scary-looking Mantis Prawns. 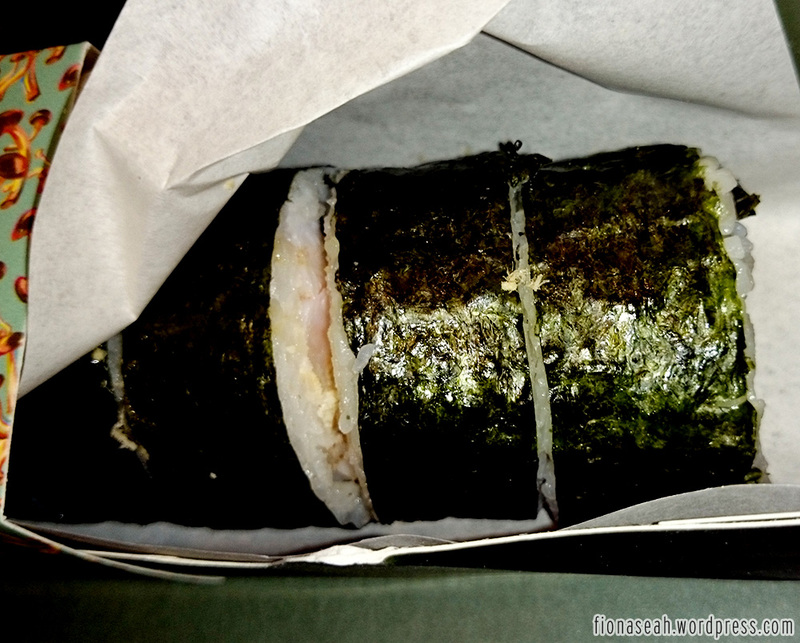 The meat is VERY different from the usual prawns. This is definitely more chewy and thick. 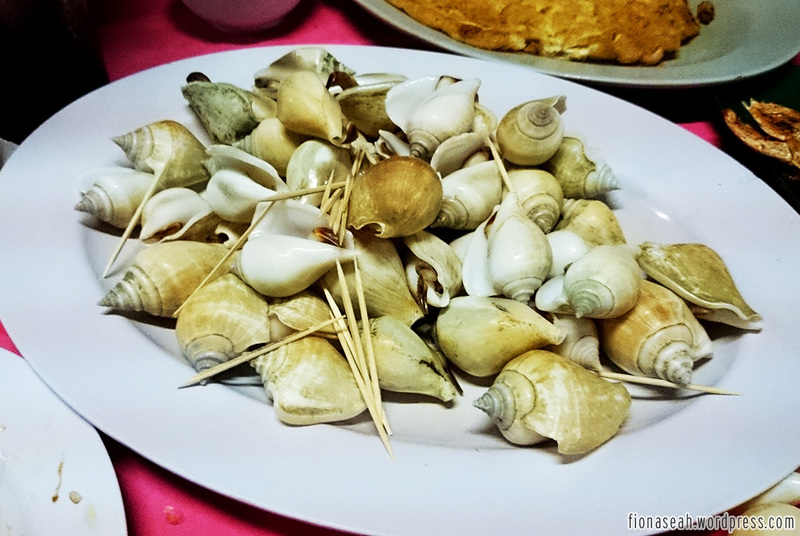 To eat, remove the top shell. 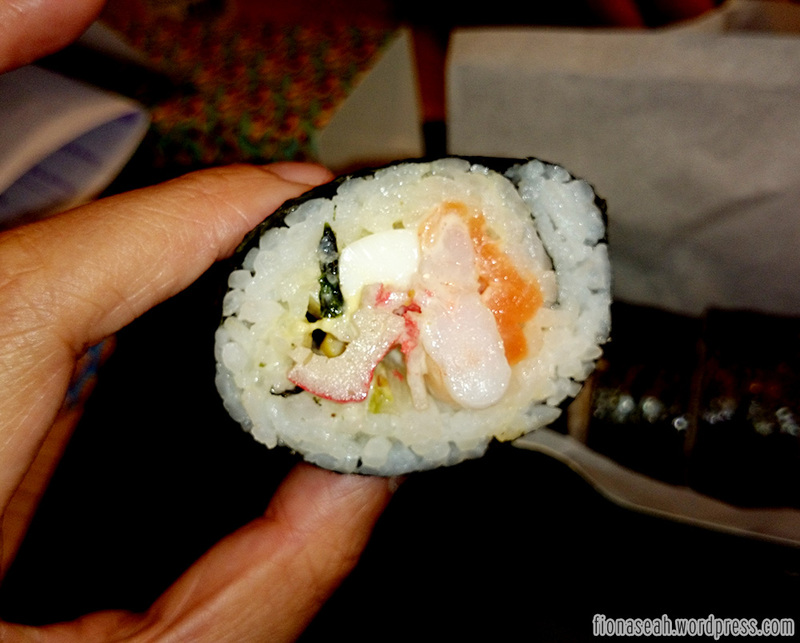 If it’s fresh, you should be able to peel it off quite smoothly. Breakfast, although with very limited selection, was pretty pleasant. 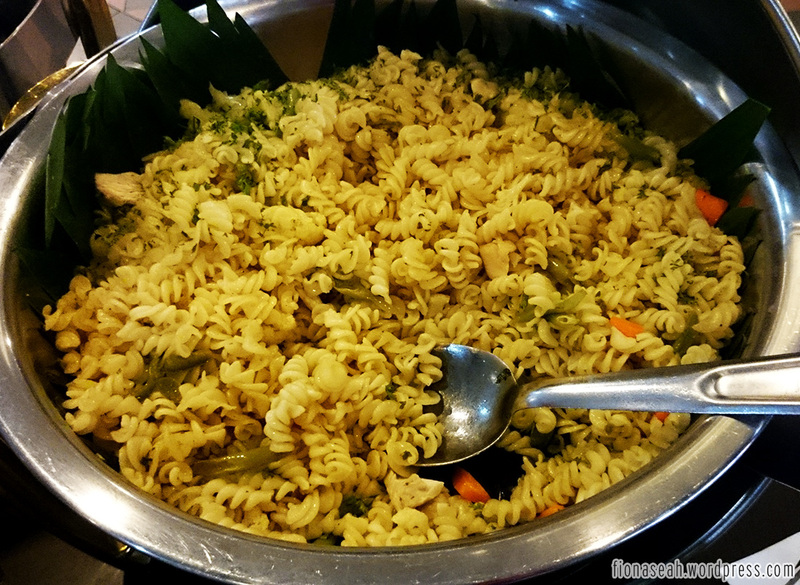 Apart from bread, they served noodles and rice along with 2 other side dishes. I actually ate a second helping of the noodles. 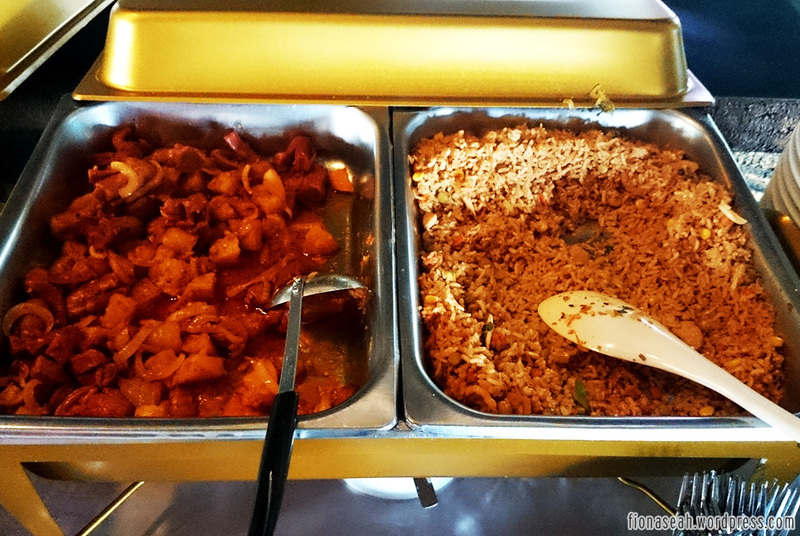 Thus if you’re like me, who eats better with lesser variety, this hotel breakfast should work fine for you. 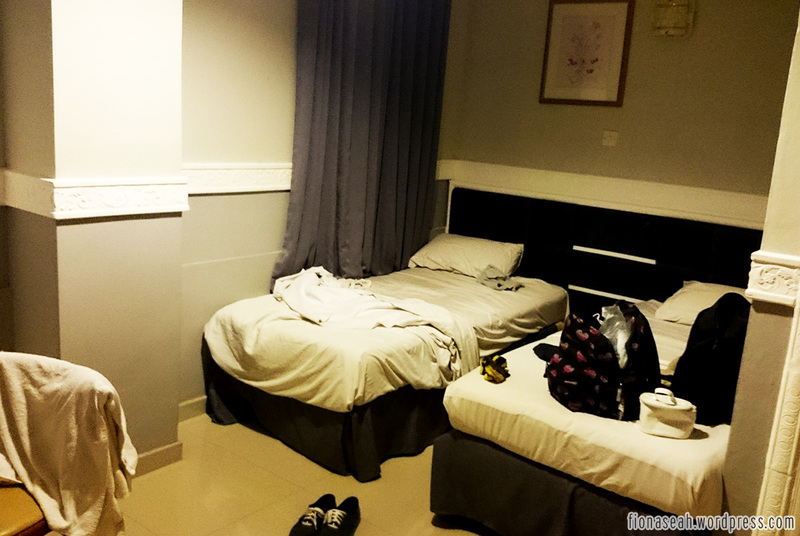 Our tour guide was scheduled to arrive between 9am to 10am Batam Time so we checked out of our rooms at around 9.30am. However his arrival was delayed (due to some problems with the Burmese tourists’ passports) so our tour started a tad later as well. The tour guide was sincerely apologetic. 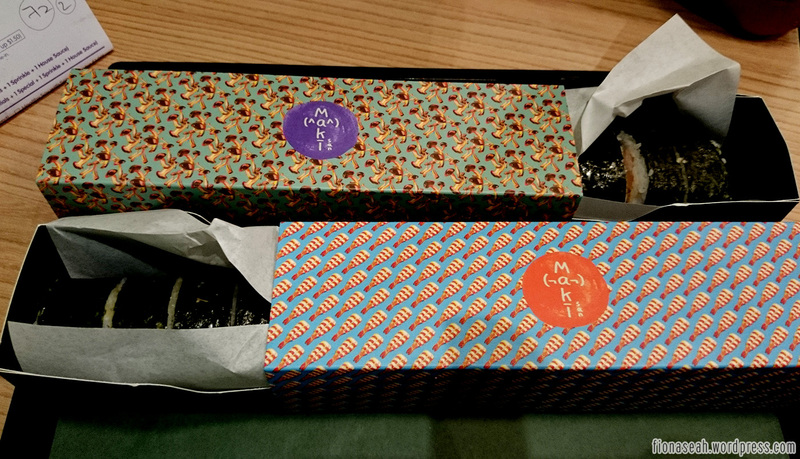 Our first stop was at a chocolate factory. Don’t expect too much of it as it’s just another outlet to fleece tourists lol. What they have there, we have it here at our supermarkets as well at a much cheaper price. 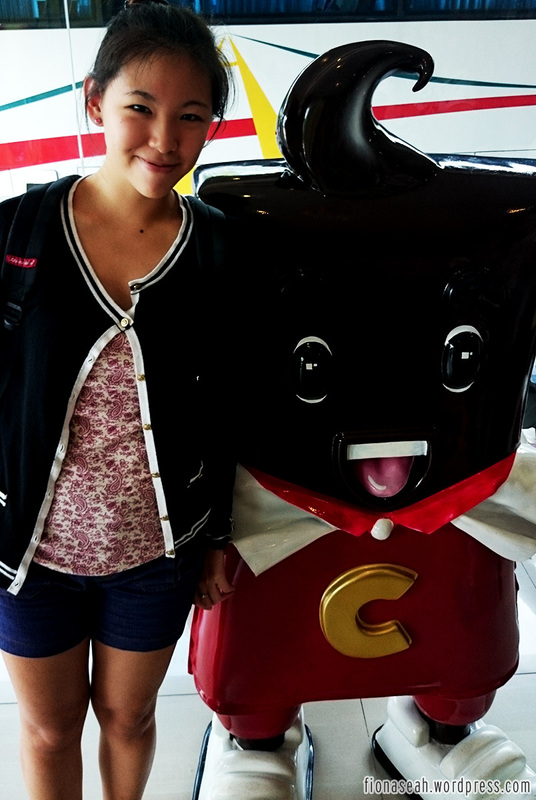 Only took a picture with their Chocolate mascot. We also went to a local product shop which sold equally expensive snacks, a Batik outlet, a temple which only my father went while the rest of us stayed in the bus, and one of their very popular Polo Ralph Lauren outlets. Polo Ralph Lauren had a sale section and I almost bought a female slim fit top for S$35 but I kept telling myself that those were all replicas (how true is this, I’m not sure) and resisted my temptation to splurge! 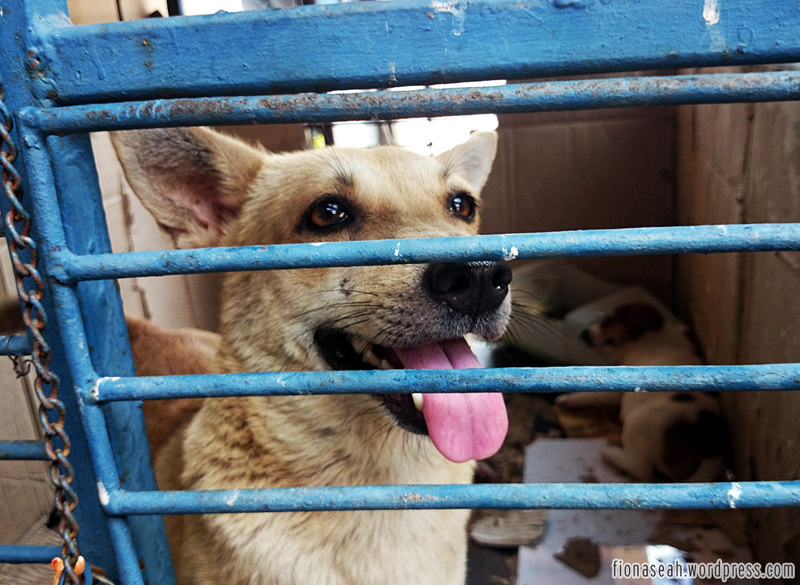 Saw some dogs living in poor conditions opposite the Ralph Lauren store. One dog was let out and we were busy playing with it before entering the store. 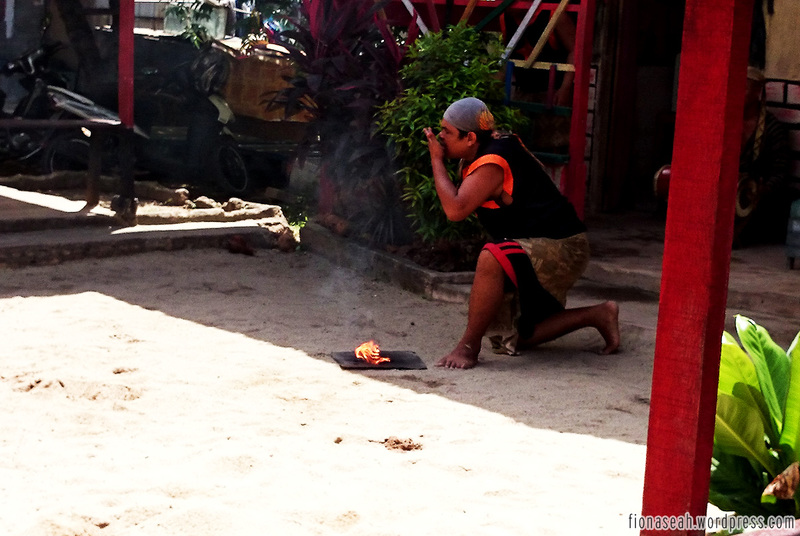 Then we were brought to a place to watch a culture show and to shoot glass bottles with pellet guns. Shooting activity: all the glass bottles! 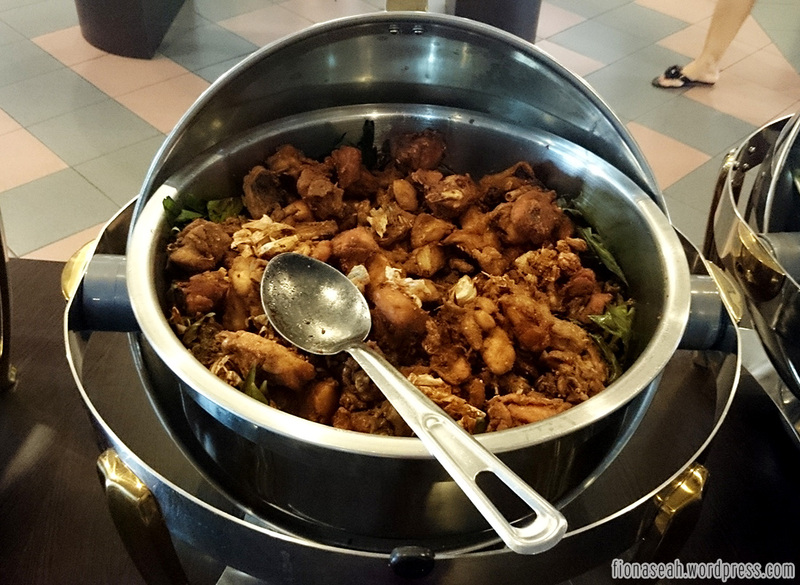 We had our Indo buffet lunch at Restaurant Sari Bumbu. Due to the fasting season for Muslims, everywhere on the streets was quiet. 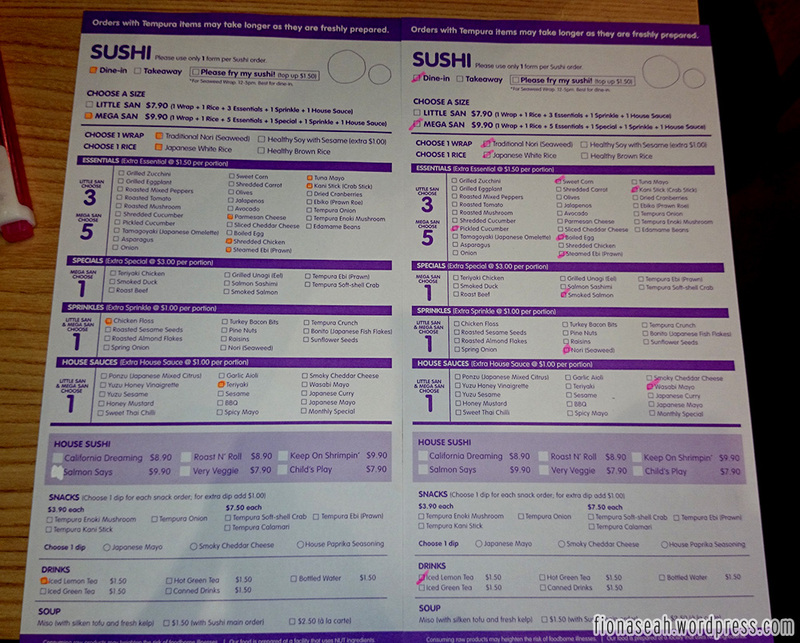 We were the only patrons of the restaurant but actually the food was not bad! I love their soup especially! The soup I’m talking about! 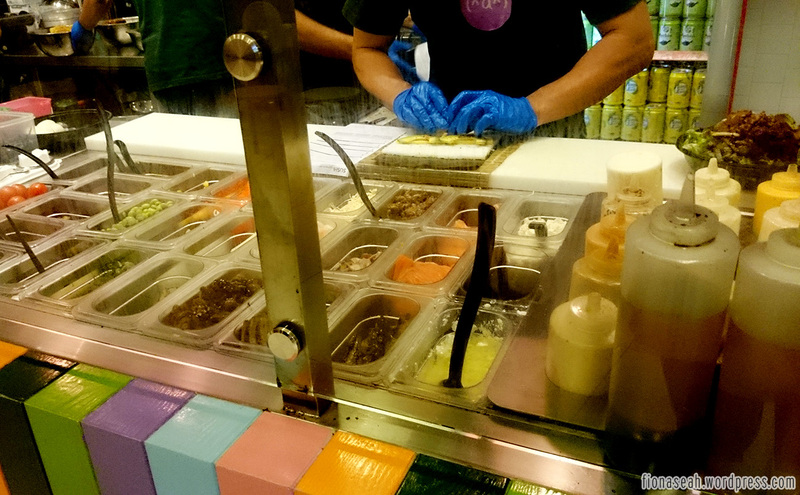 Must try if you ever go there! 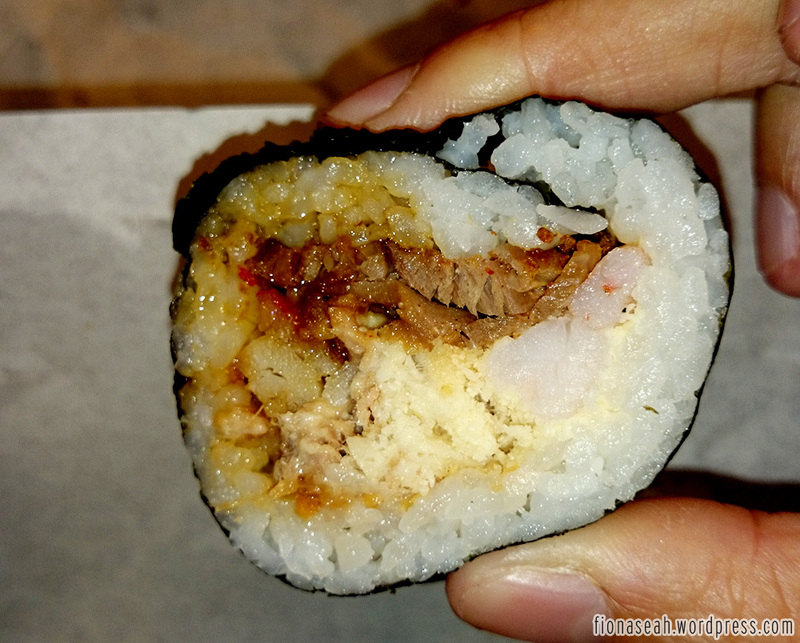 I think this is beef? The best. 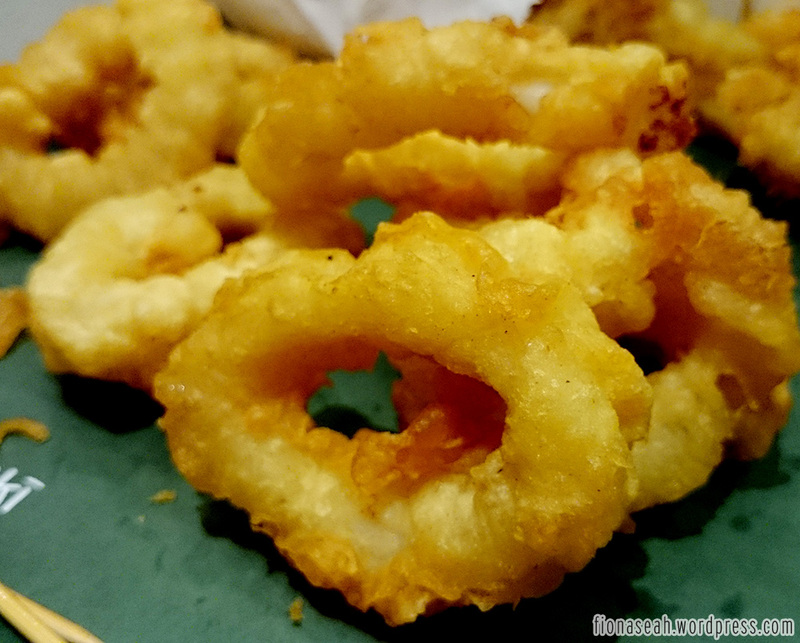 FRIED FISH SLICES! Uhmmmm, can’t remember what this is. Most likely fried chicken. Before we headed for our massage, we visited First Factory Outlet. I believe most of the stuff there are imitations because the prices are too good to be true. But sigh, I still couldn’t resist a bargain. 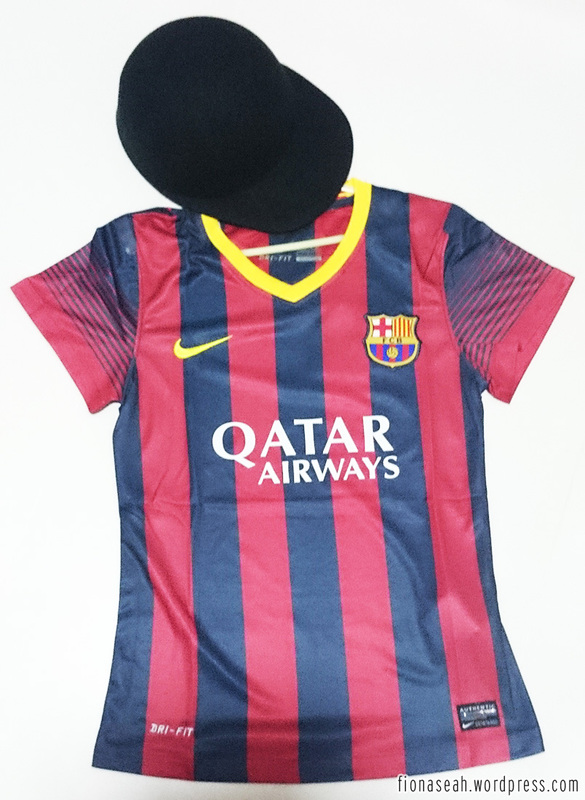 Got myself a Barcelona FC jersey for S$25. Full-body massage at First Choice was mediocre as I didn’t get a satisfactory amount of “bone cracking”. Boyfriend’s experience was worse as he didn’t get any cracks and he left feeling uncomfortable all over. My Mom on the other hand was silently enduring all the pain – not the masseuse’s fault though because my shy Mom chose to keep mum -_- Having said that, my Dad enjoyed his massage so there you go, mixed responses about the massage parlour. I guess if you don’t go for massage sessions regularly, you’ll have lower expectations and this place should be okay for you. 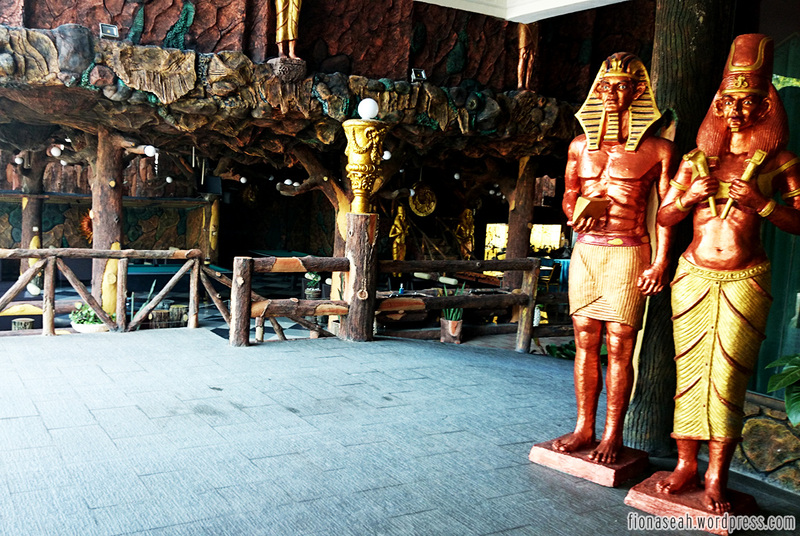 We ended our Batam getaway with another shopping trip to Batam City Square Mall. Boyfriend and I didn’t shop much and we tried to spend our last few Rupiahs at the arcade because according to my tour guide, the Rupiah notes expire every few years (But Wikipedia and other credible sites tell me something else, that only the 1998-1999 notes are no longer legal tender, so it’s up to your discretion). To play we had to buy some game credits at Rp100,000 (approx. S$11) and on average each game station requires Rp2800 (approx. 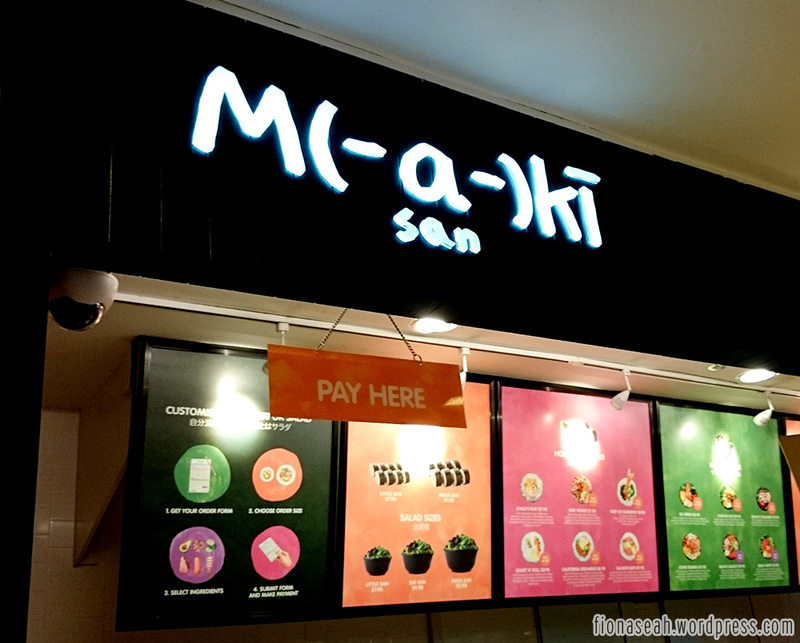 S$0.30). We spent most of our credits on their claw vending machines (as always) and bagged 2 plush toys home. Hehe! 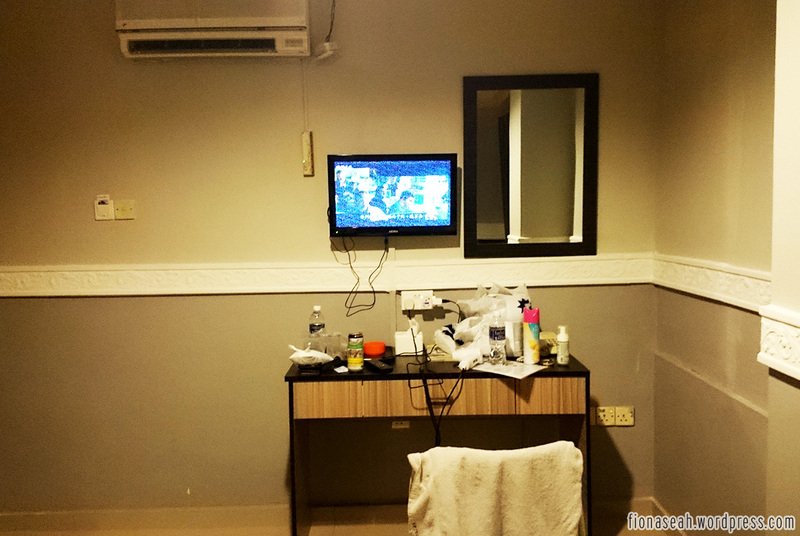 All in all, this Batam trip was not that bad despite the unpleasant experience in our hotel room, probably because it was a shorter stay this time. 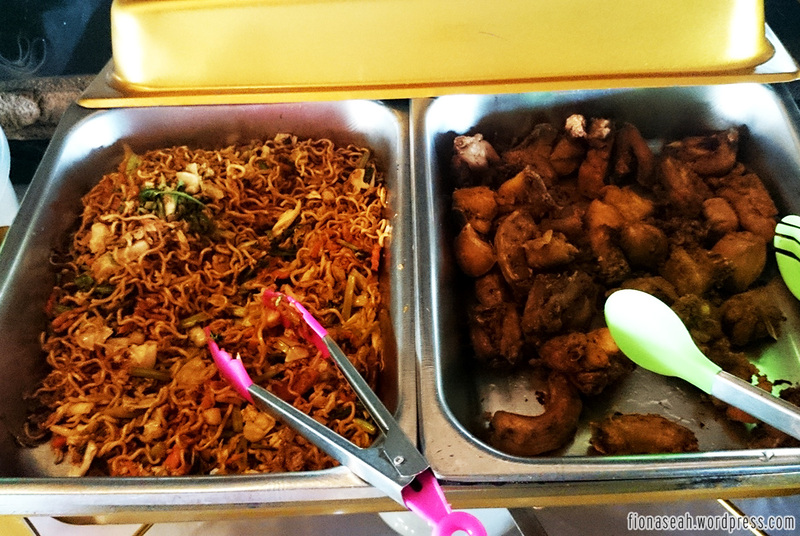 My Mom doesn’t mind a second trip to Batam (oh snap) so yeah…. I can’t promise that I won’t be back there again. 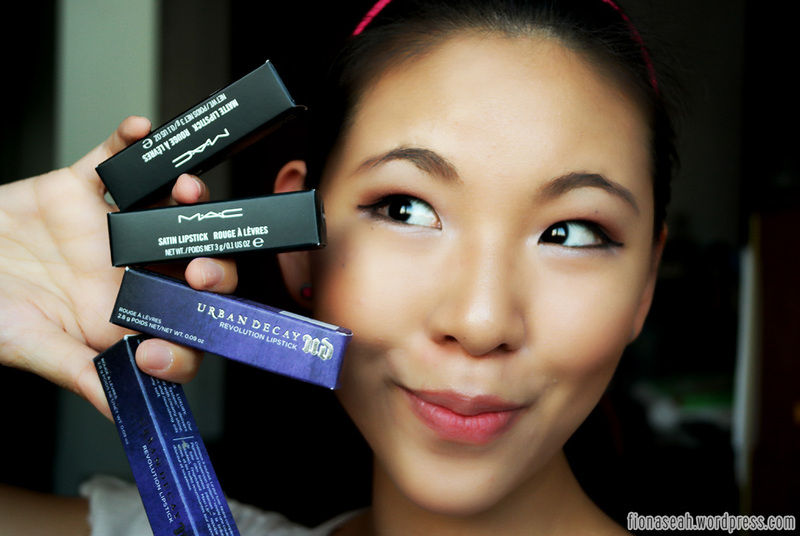 I just received my MAC parcel all the way from USA today and instead of reviewing my haul one-by-one (most of them have already been reviewed by other beauty gurus a million times anyway), I thought I should just talk about them as a whole! 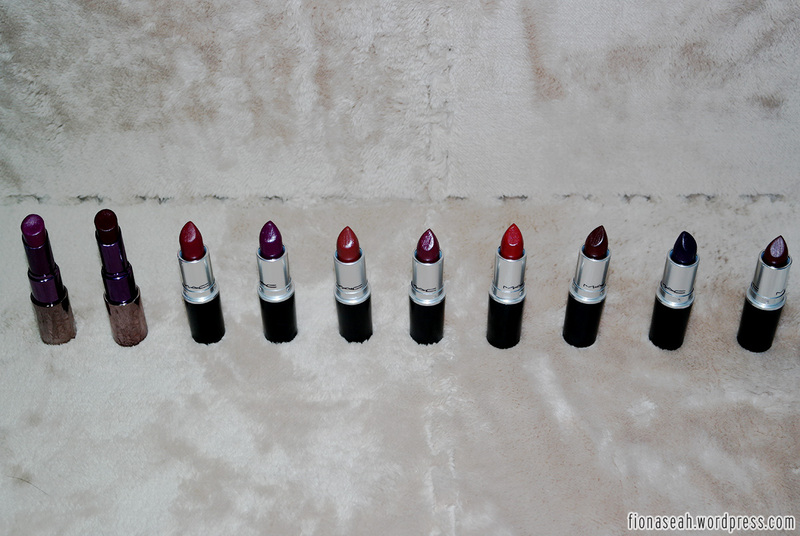 I have a lot of lipsticks as you can see from the picture above (*guilty*) so I’ll pick some and classify them into different groups like favourite dark lipsticks, my lips but better lipsticks, red lipsticks, so on and so forth. 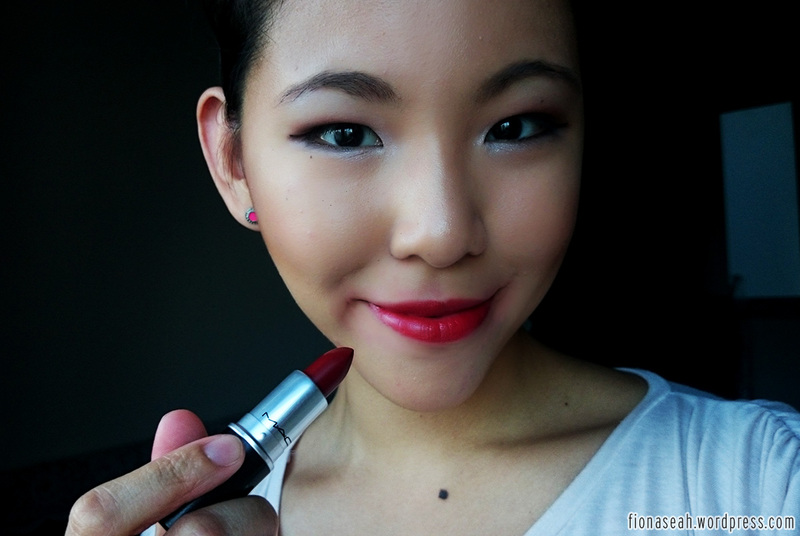 Check out what made it to my MLBB and Red lipsticks lists! 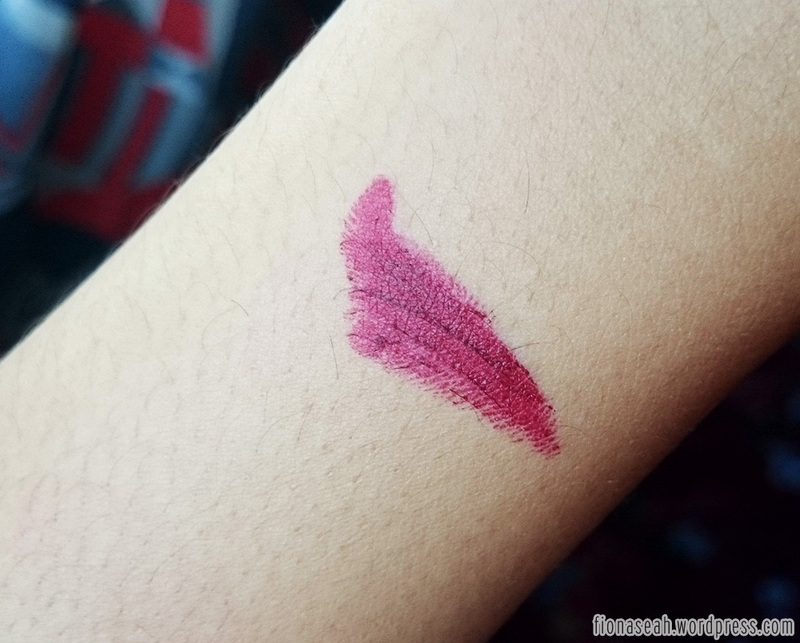 Everyone is born with different lip colour, so here’s mine without lipstick to give you an idea of how the lipstick colour will turn out on my pale pink lips. 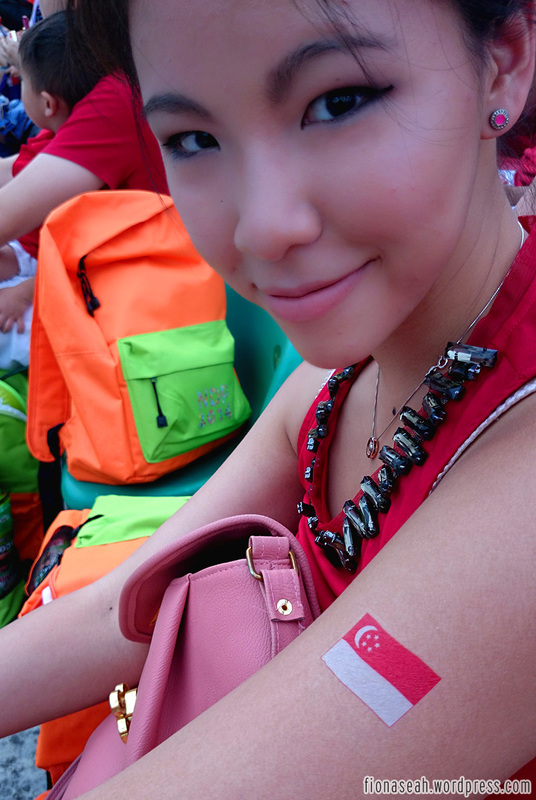 Love my eye makeup here so here’s one to flaunt it HAHA. Overview of my top 10 in no particular order! I love them all just as much! 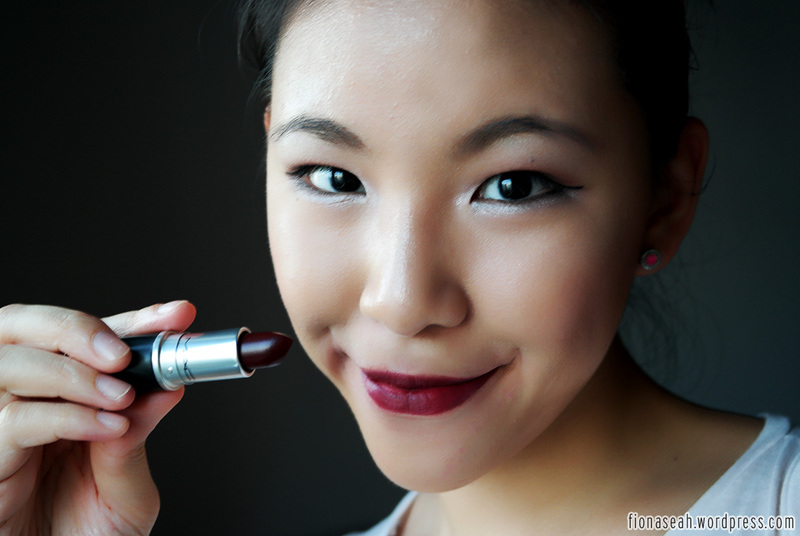 Lighting is really terrible in my room when night falls, so please bear in mind that the lipstick bullets are a lot darker in real life! 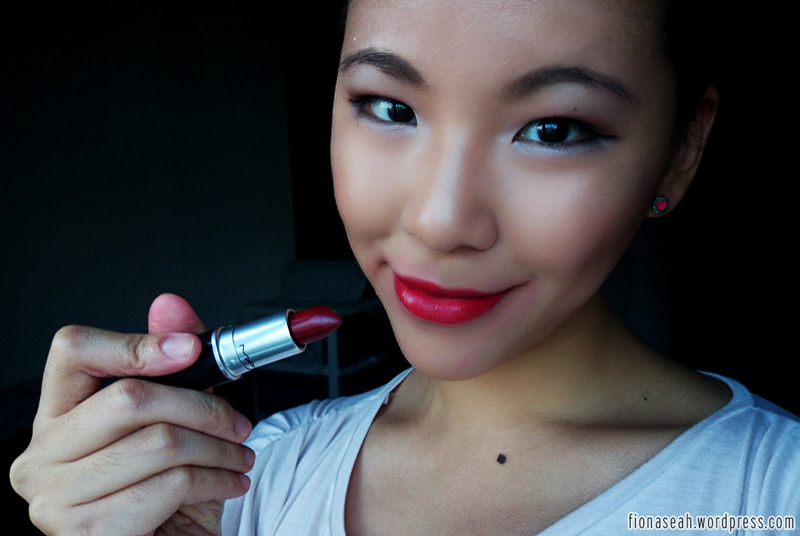 Love UD’s Revolution lipstick line – very moisturising yet long-lasting. 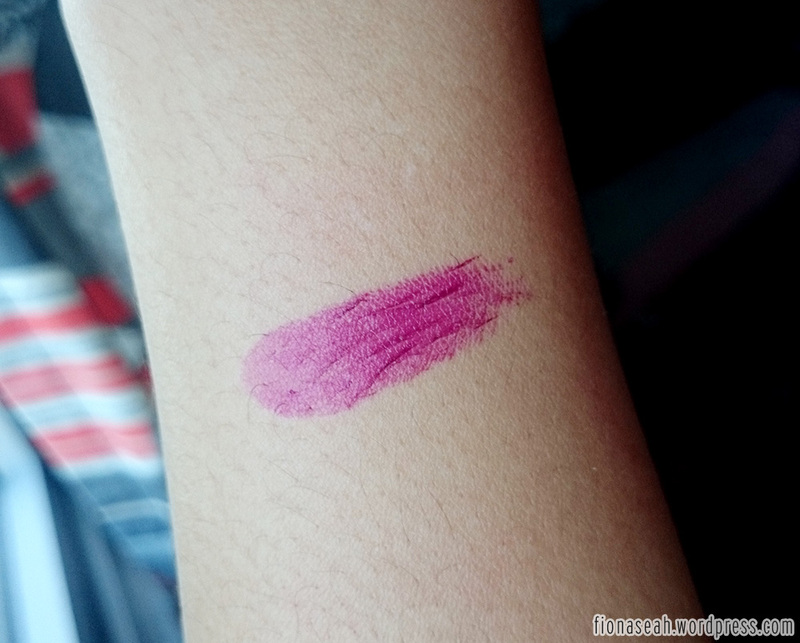 Venom is a deep fuchsia shimmer with blue undertone. 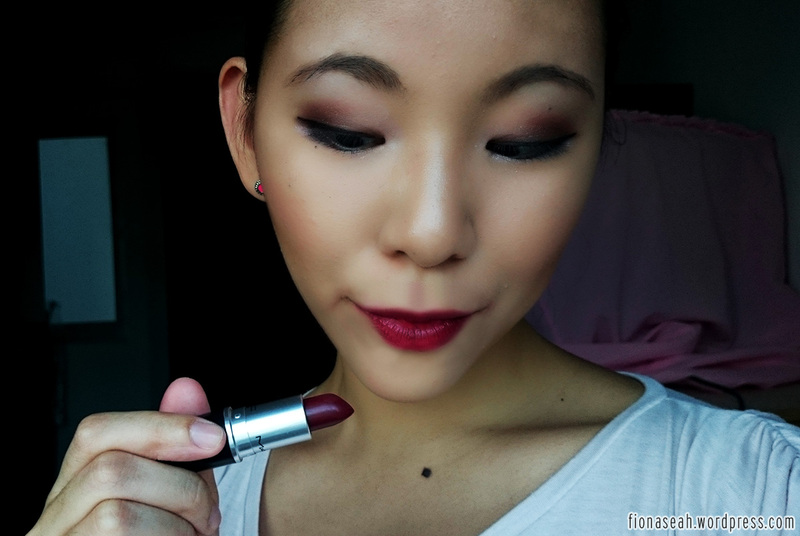 Out of the 10 lipsticks featured here, this undoubtedly is in my top 3 (possibly the top 1). 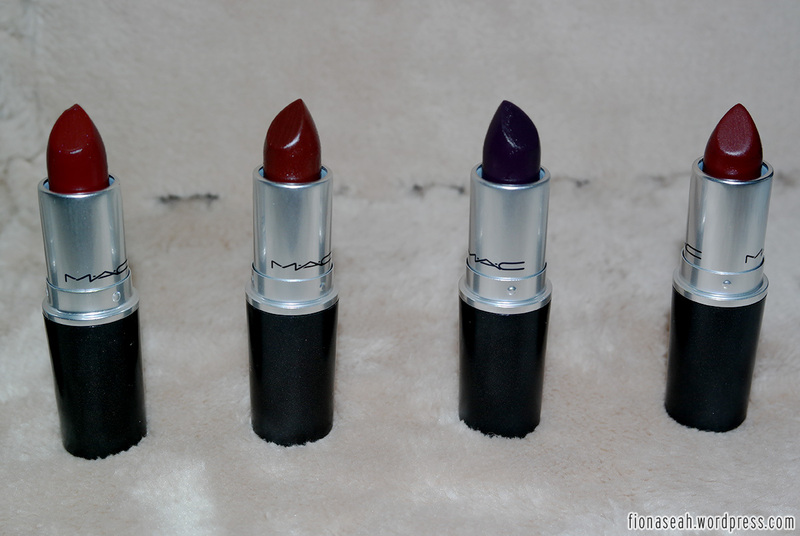 I love how RICH the colour looks. It’s like what, deep burgundy with brown and ruby??! Major LOVE! One more shot for my greatest love! 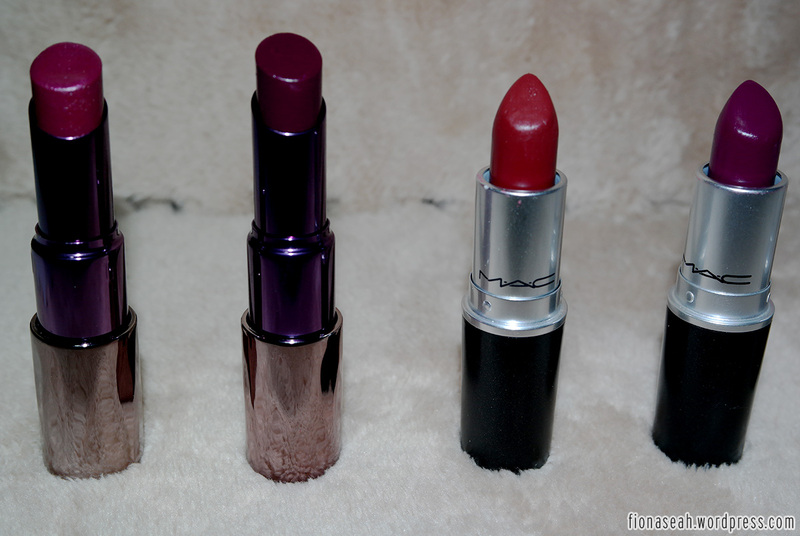 I’m obsessed with the matte finishes in MAC’s lipstick line because they are all so beautifully pigmented. Don’t be surprised to see a lot of them in my upcoming features! 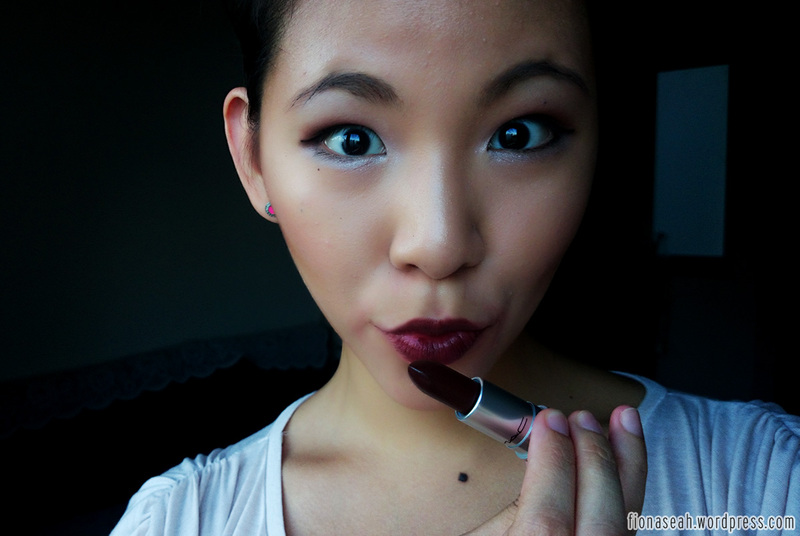 Another deep burgundy shade with red undertone lipstick! 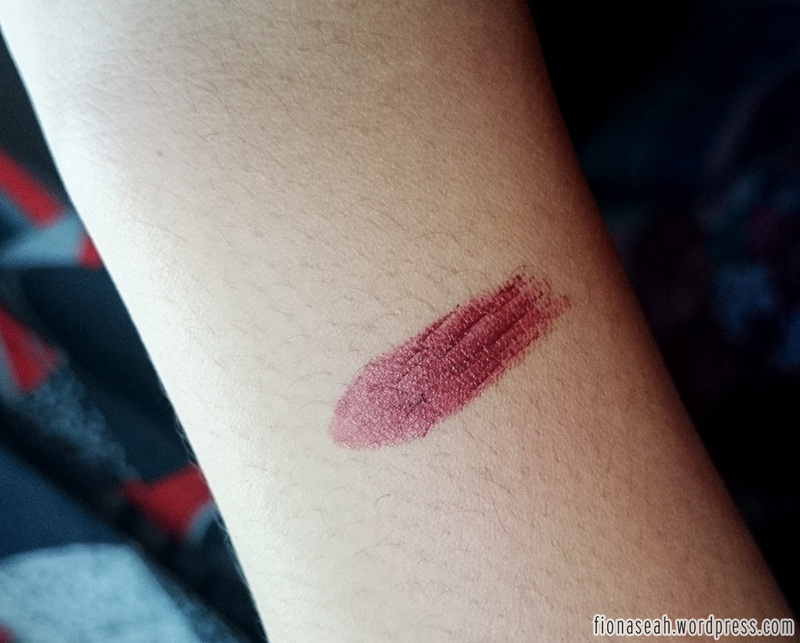 I don’t think this shade is available in Singapore because I couldn’t find this in local stores. I got this off maccosmetics.com! 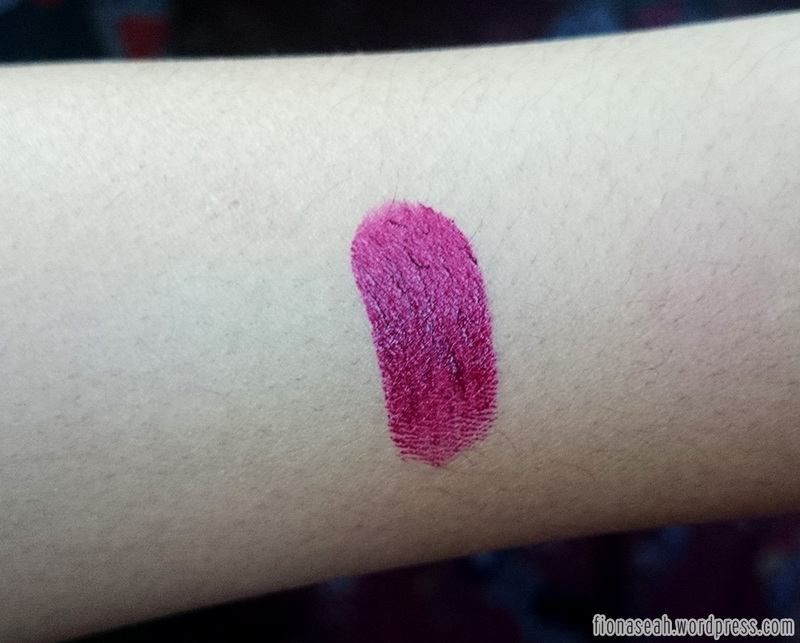 It may look quite similar to Diva here but it is definitely not! This is more towards the red side. No hints of purple at all. 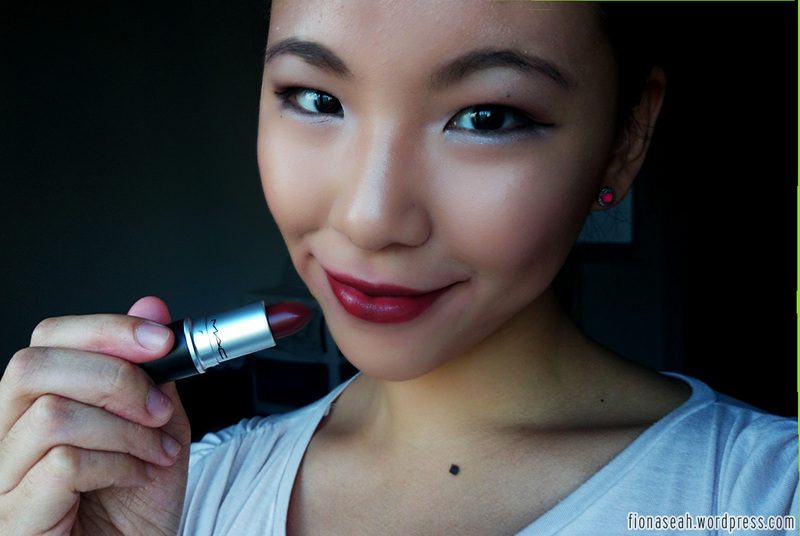 Dubonnet is a deep red with brown undertone. 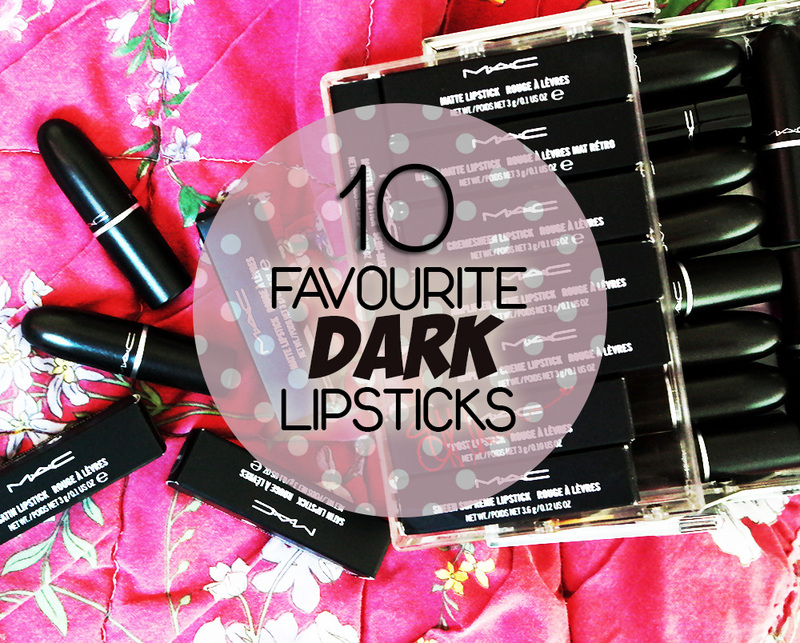 I was contemplating on whether to put this shade in the “10 Favourite Red Lipsticks” category but this is a tad too dark to be in there! Received this today! 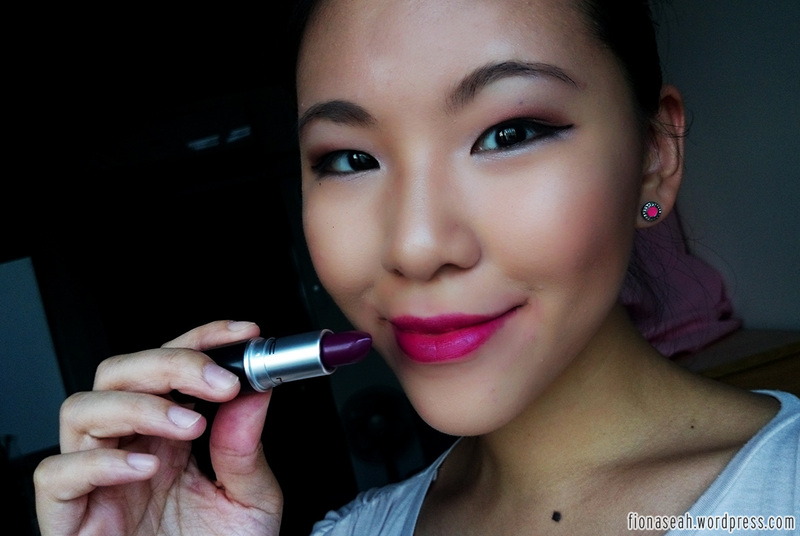 Tried it almost immediately after opening my parcel and fell in love with it INSTANTLY! 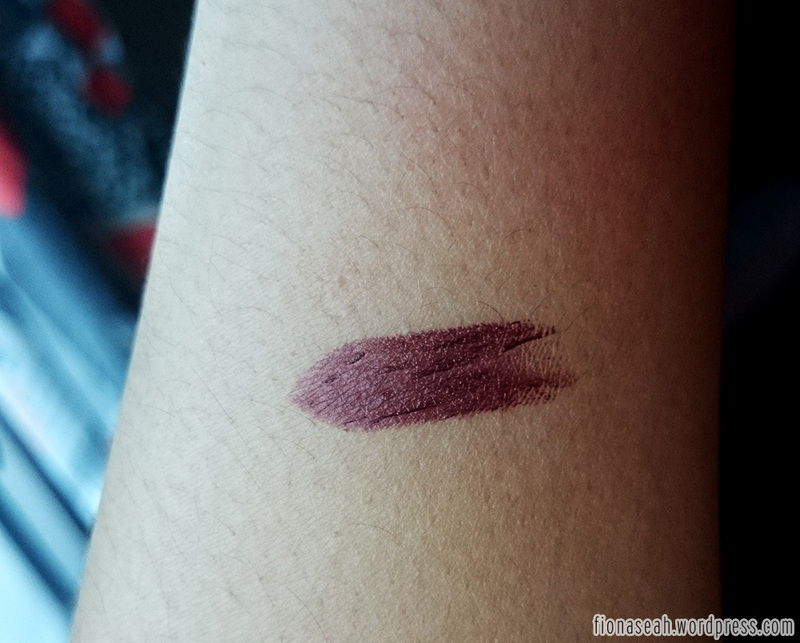 It’s a very gorgeous shade of deep, reddish brown (like rust). Something that Morticia Addams would use haha! 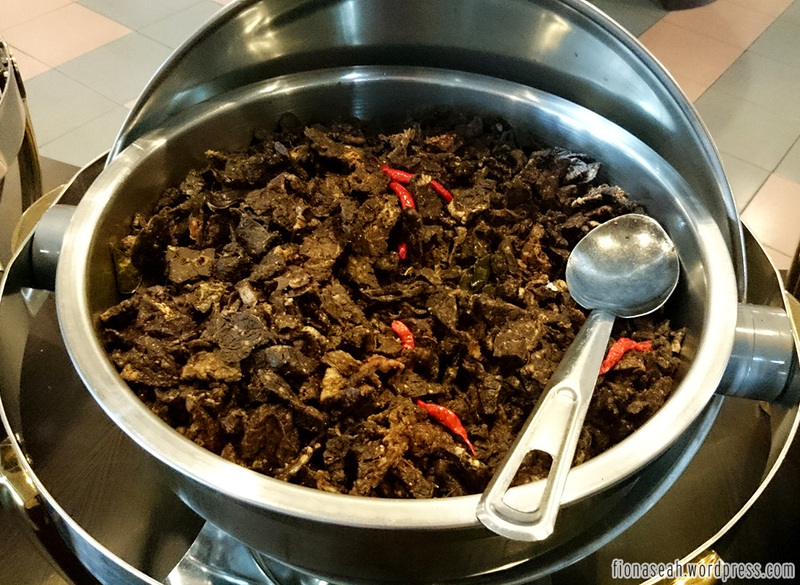 Like Dark Side, this is not available in Singapore. I am hoping for my skin to be fairer! 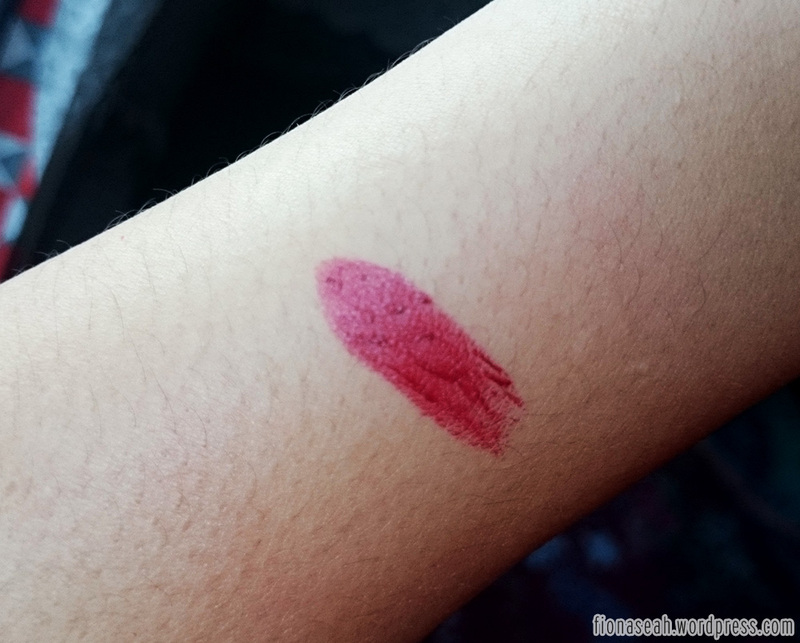 It looks AWESOME with fair skin. This is a WAY darker version of Pure Heroine. 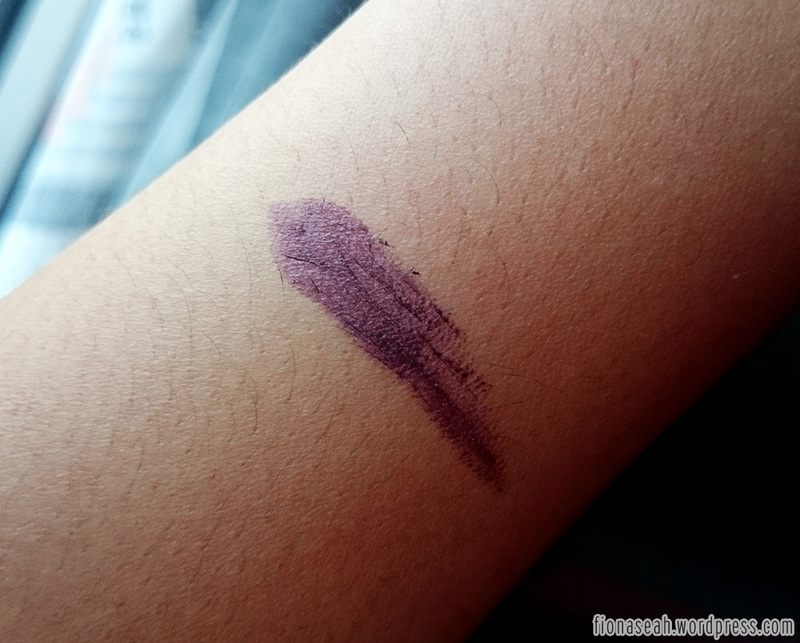 It’s a much deeper purple with red undertone. 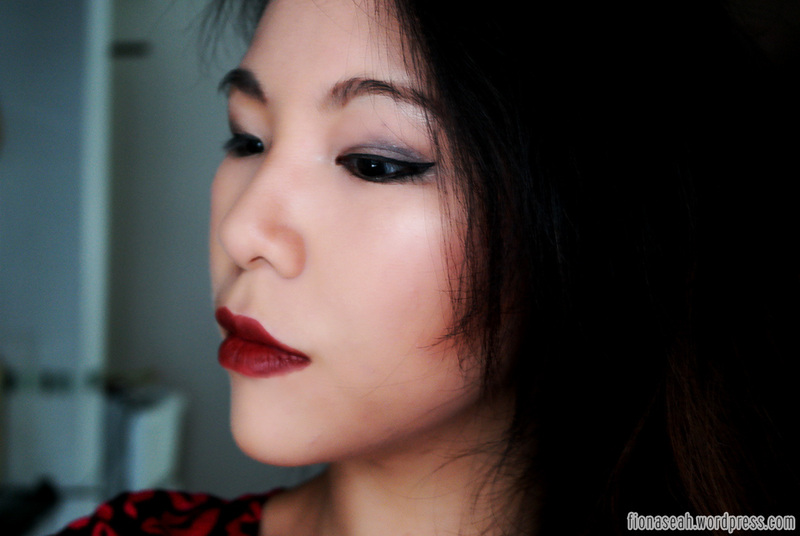 Last but not least, a very intense blackened red lipstick. It’s a little darker than Paramount but lighter than Film Noir. This also just flew in from the states! What do you guys think? 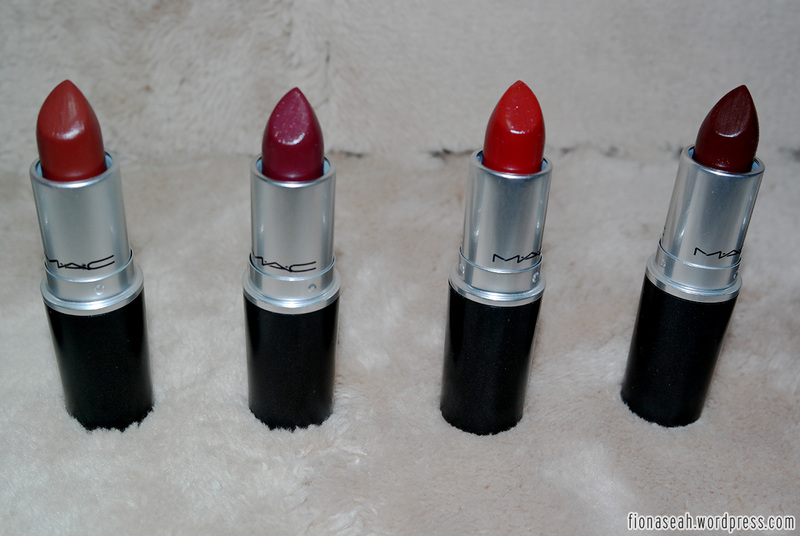 Which colour suits me best? I need unbiased opinion because once I fancy something, I’d just use it regardless of how I look in it. I can’t ask my boyfriend because he objects every single item featured here. Hahaha. Be sure to stay tuned for more posts like this! Hello everyone! Sorry for the lack of beauty updates. I’m still waiting for my MAC parcel to arrive. 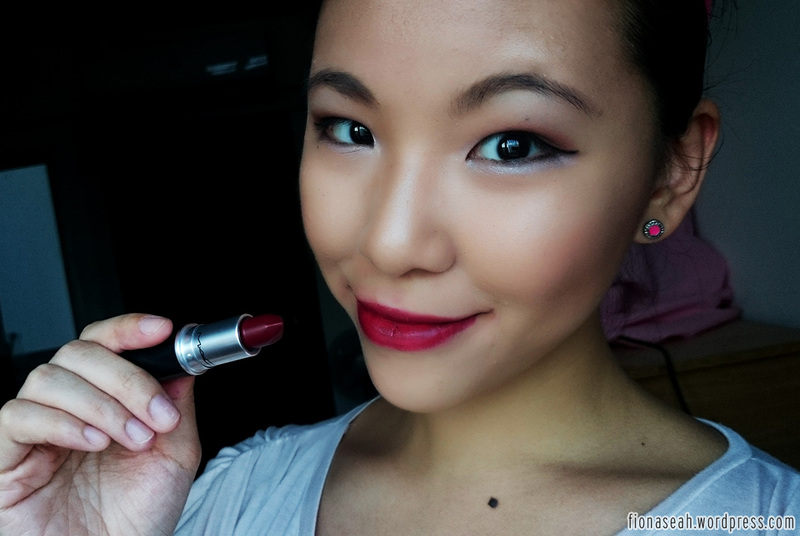 Once it’s here, I’ll do a review on lipsticks 😀 For now I shall do some life updates! 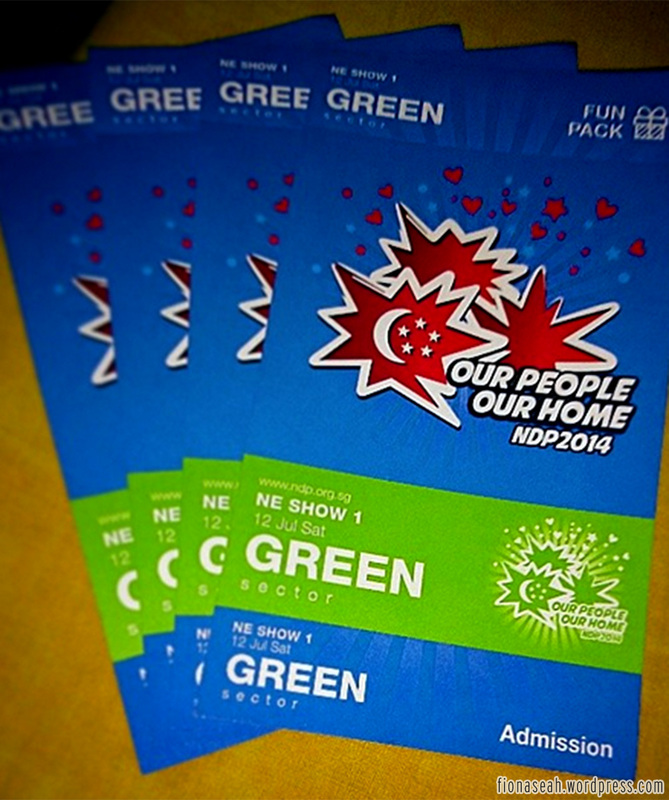 Thanks to my aunt, I had 4 tickets to the preview of National Day Parade (NDP) for last Saturday. If I’m not wrong, it was the first preview for the public. 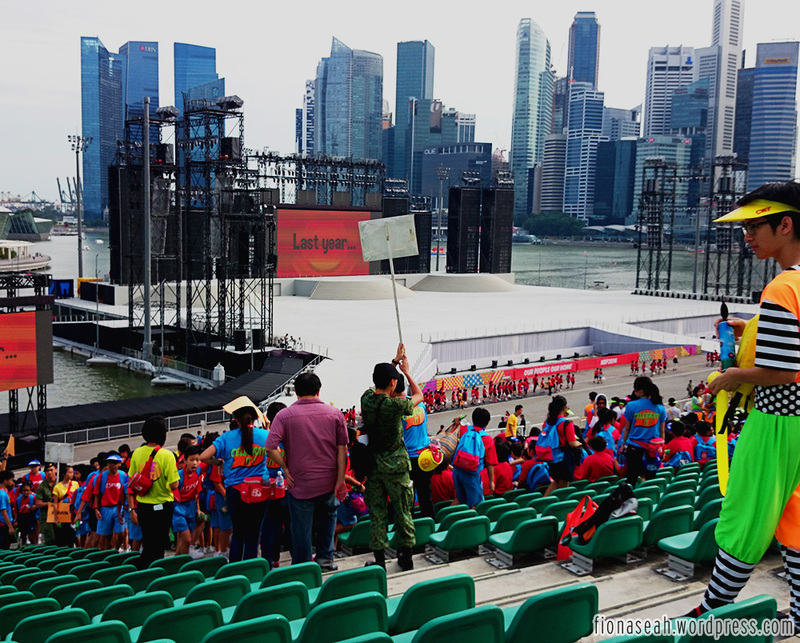 I’ve been to NDP previews at the old National Stadium and the Padang but never to the one at the floating platform, so this year was different for me! 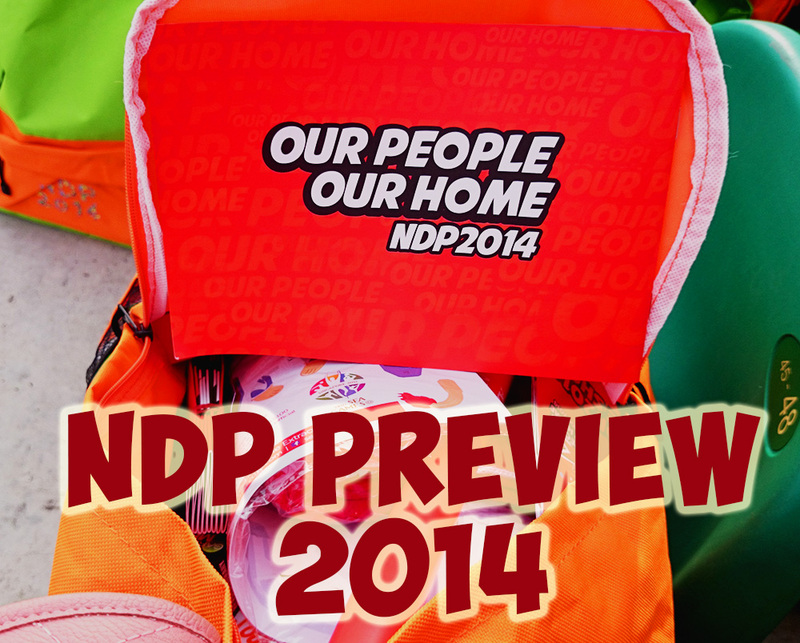 As my parents weren’t interested in the NDP, I invited boyfriend’s parents to come along with us! 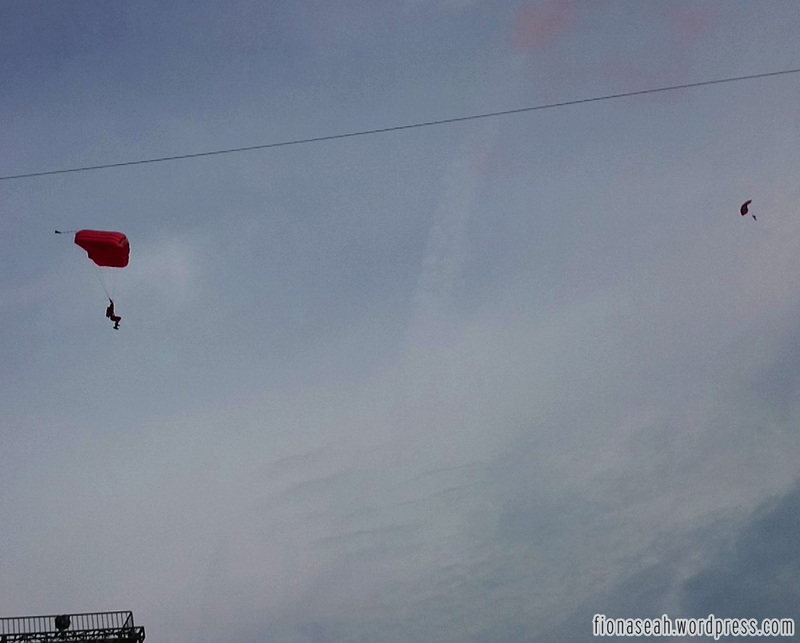 It was also his mother’s first time attending so I guess she was quite excited to go as well! Anyway, no entry time is stated on the admission ticket, I think. 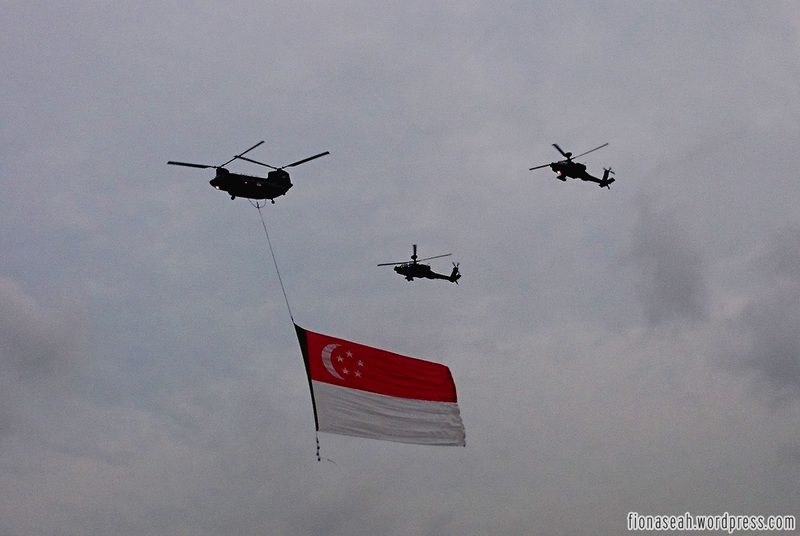 But from my experience, the parade usually begins somewhere between 5.30pm to 6.00pm. However, it was already packed with people by the time we arrived at 4.00pm (when entry points are officially opened). By 5.00pm, the crowd of people outside waiting to be seated would be ushered to the gallery (free seating). The middle top rows are usually reserved for the motivators. 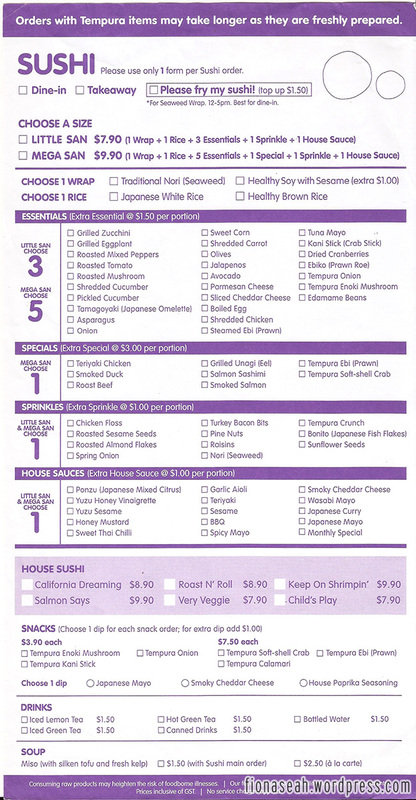 But like every year, the fun pack has everything you need to keep your stomach satisfied throughout the 3-hour performance. There’s also a poncho in case of bad weather. Of course, the auntie in me was more concerned about this year’s discount booklet! Haha. Quite a number of good deals in there. What’s in the fun pack! 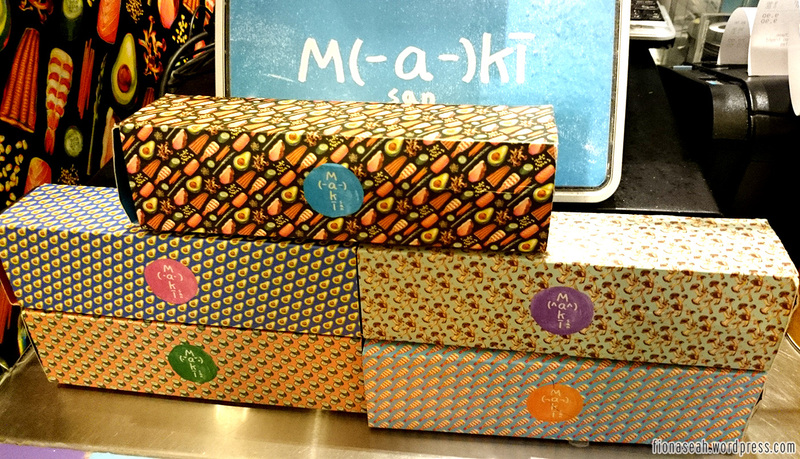 Close up of the goodies! Do note that this is not the complete set as I had drunk one of the beverages 😛 There’s also a packet of Khong Guan biscuit but somehow it’s not in my fun pack. P5 students attending their NE show. 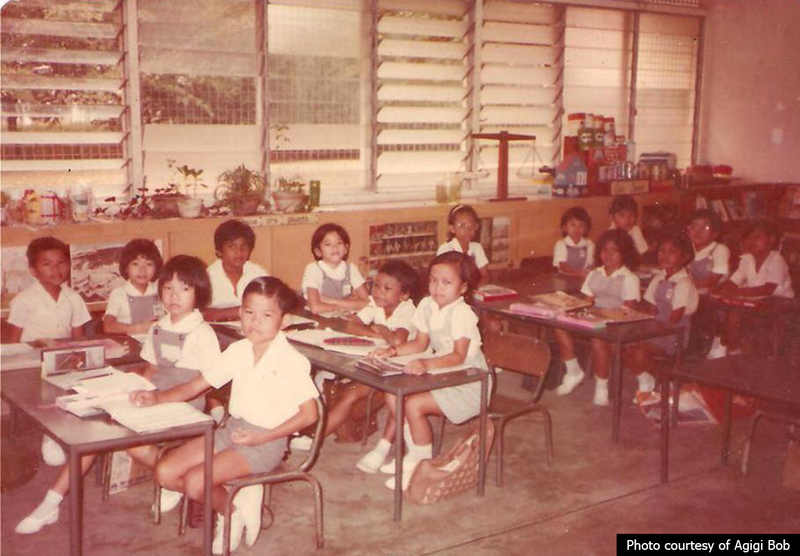 I reckon my seating area was for schools in the north-east region because schools like Edgefield Primary, Mee Toh School and Compassvale Primary were there! Boyfriend and I! We were approached by some NDP volunteers to take a picture and I’m supposed to post it up on Instagram and hashtag them. But I can’t seem to remember their hashtag. Anyone? The simulation of the MPs’ arrival never fails to crack me up! The people holding the MP banner occasionally put up funny faces for the camera. My favourite part of the parade – the marching contingents! 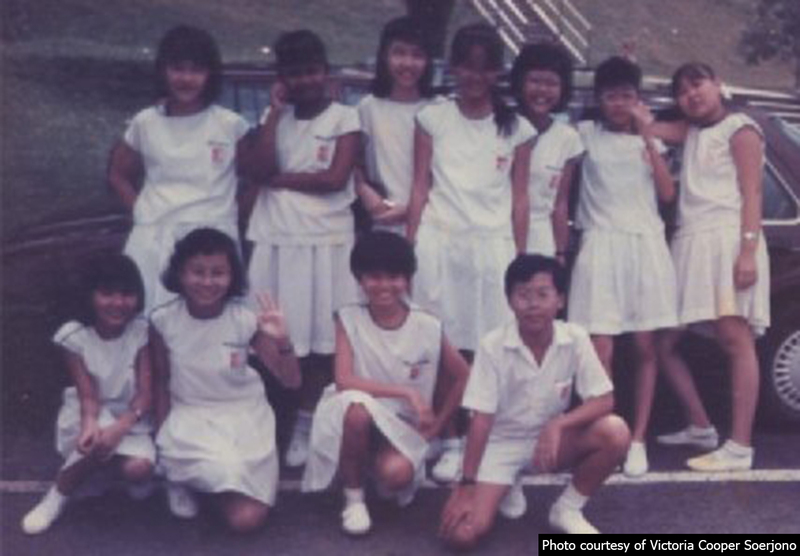 I was part of the Girls’ Brigade in my secondary school but was never good enough for NDP 😦 Inspection was not done by our president of course, but by someone of high rank from the organising committee I think. 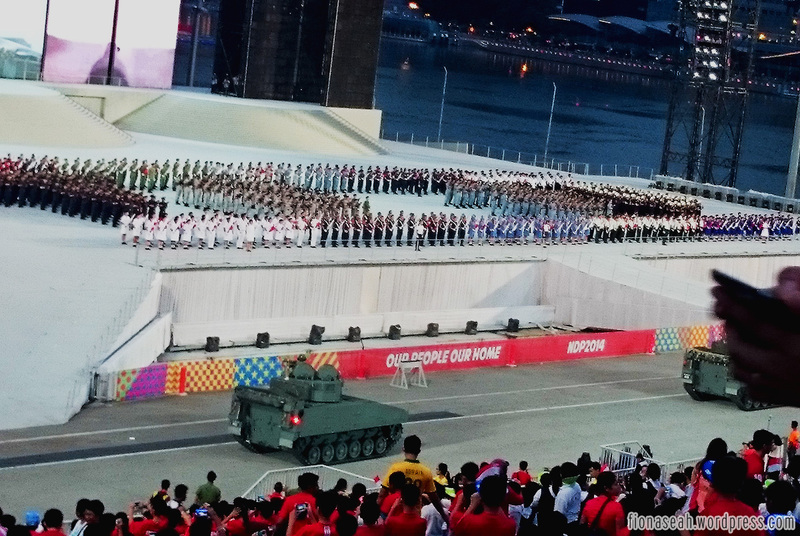 In the past, after the marching in, the choir would start performing some National Day songs but strangely for this year, there wasn’t any choir at all! I’m not sure why but could it be because there isn’t any theme song this year? Nonetheless the whole parade felt very odd and quiet without the choir. 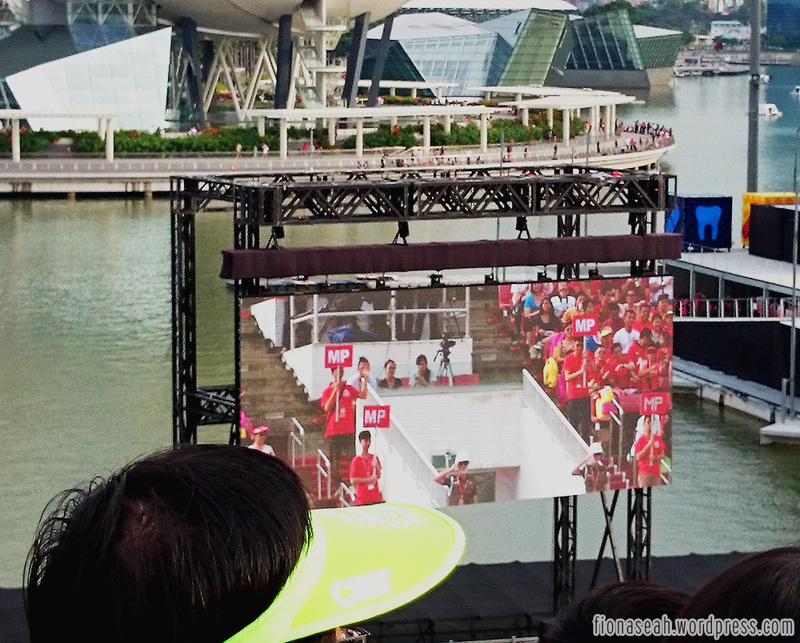 Why oh why did the organising committee remove them? 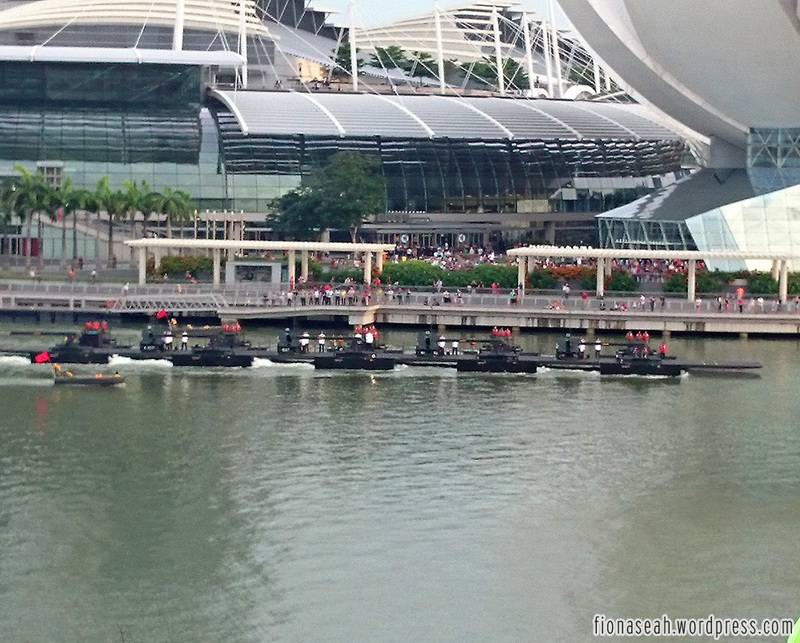 More of our military vehicles… on the waters! 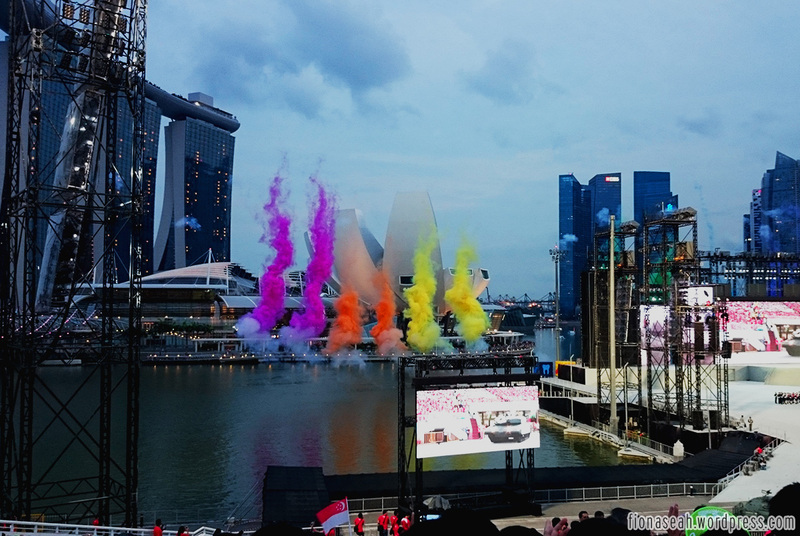 Coloured smoke! So pretty right? I think it was made by the cannons. Our firefighters and a simulated fire scene. 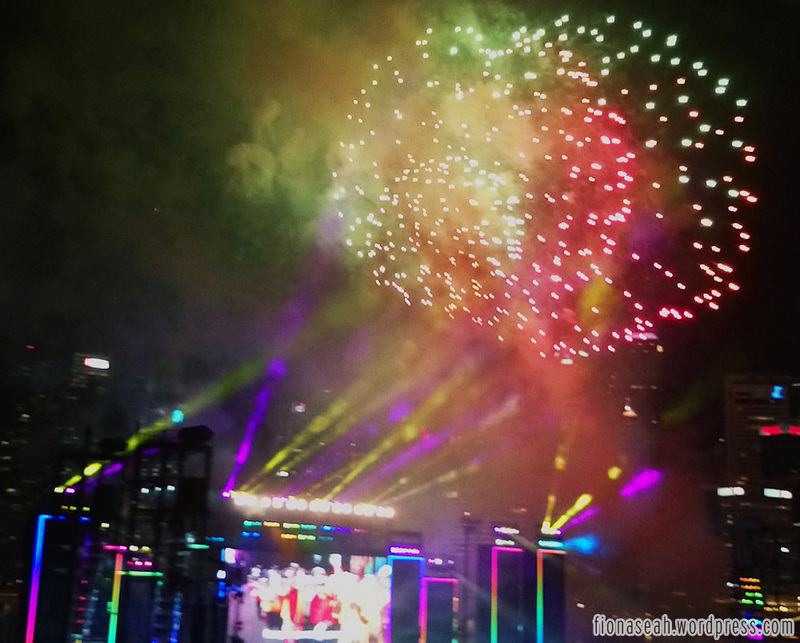 One of my best fireworks shots that night! All pictures were taken using my phone by the way. These are the highlights of the programme! As you can see, it’s nothing spectacular. If you didn’t manage to get the tickets through balloting and are intending to purchase the tickets through other means, I’d definitely advise you against the idea. 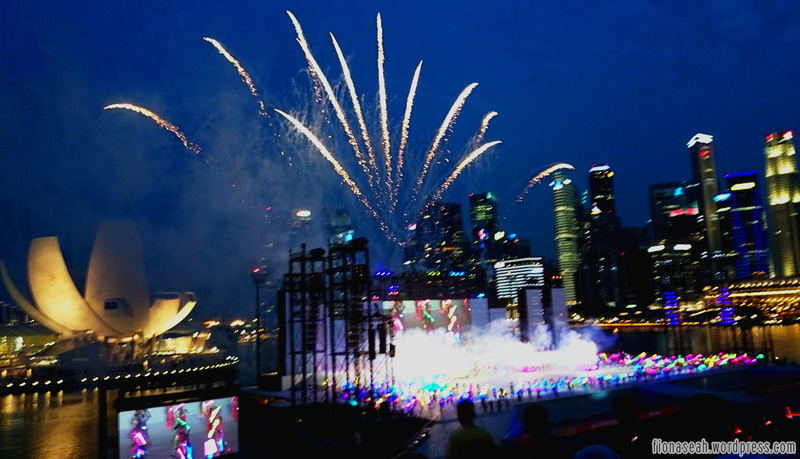 Save the money for next year’s NDP as it will be Singapore’s 50th year of independence. 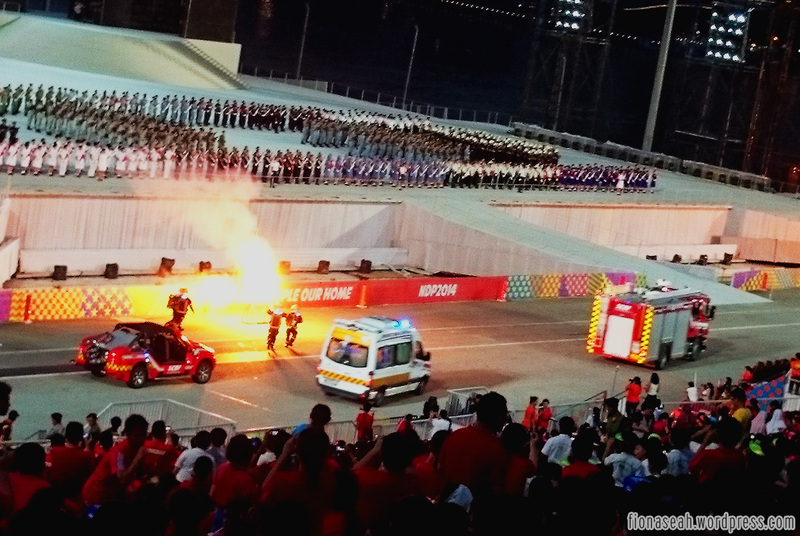 Thus for that reason, I’m very certain the organising committee would have better plans in store (they probably saved the better ideas for next year, making this year’s parade a little dull haha). Long time no update. I was actually working on this blog post about something which has been piquing my interest for some time now. It has got nothing to do with beauty nor lifestyle. It’s about… *drum roll* SCHOOLS!! It took me THREE weeks, but no complaints really, as I enjoyed uncovering the history of these schools. I hope you guys enjoy it as much as I do! 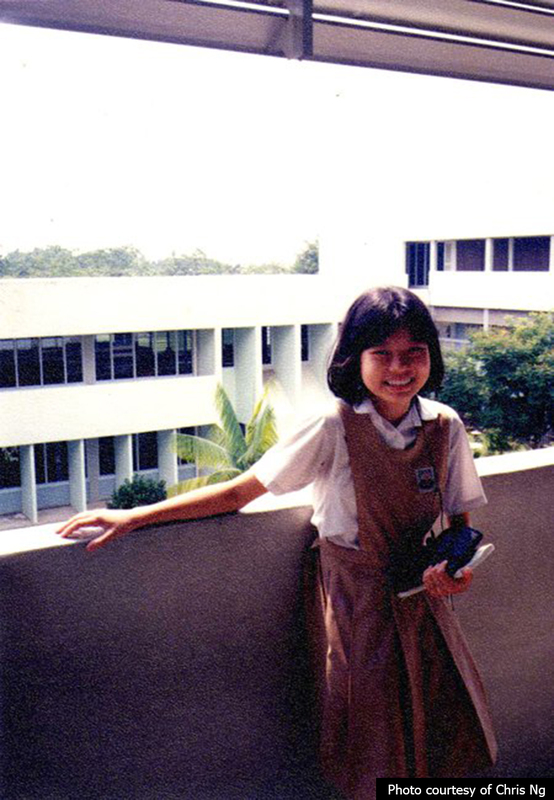 My School Uniform – the first-ever photography project that documents all the school uniforms in Singapore. Well, what prompted me to do this 6200-word entry?! It was reported on the news four months ago that six schools here will be merged into three next year and that sparked my curiosity about other schools that fell victim to declining enrolment. Yup, school closure is still happening here despite complaints about not having enough schools. Ironic, isn’t it? Schools facing low enrolment in the past were usually ordered to close. 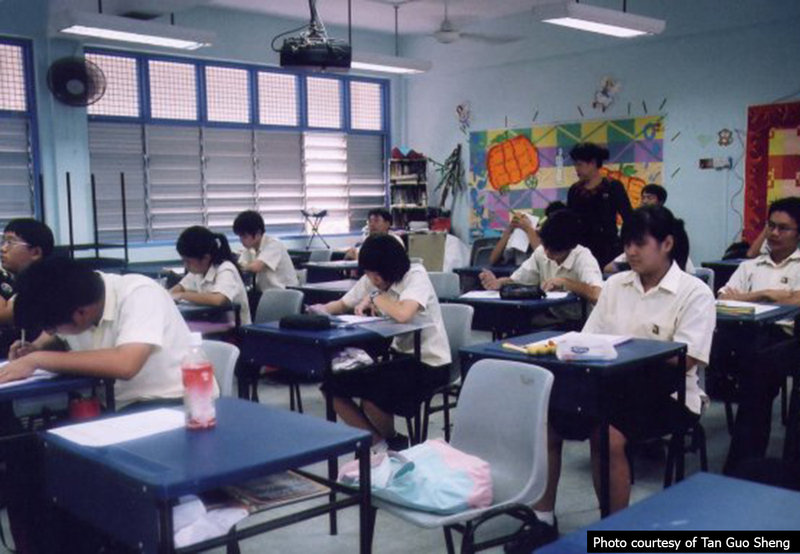 However Ministry of Education (MOE) had decided since 2002 to merge these schools instead to “form a good size school”. This is good news to pioneer schools as they are still able to preserve their history after the merge unlike those unpopular ones before 2002, whose name and history are now only remembered by their alumni. If you are an alumnus of any of the absorbed schools, your child is still eligible to be registered in the merged school under phase 2A(2). However, if your school has been closed for good, you’d have to join the back of the queue again. Reports showed that falling enrolment is a result of declining birth rate, but I beg to differ. Although it does play a part in the dwindling registration, it is definitely not the main cause. Schools that receive lower number of applications are usually located in more mature estates with no area for further housing development (new flats) thus lowering the number of new young families in that area. Above all, one can still see popular schools receiving more applications than its number of vacancies every year so low birth rate is certainly not the main culprit. Psst, you may even find your parents’ schools here! 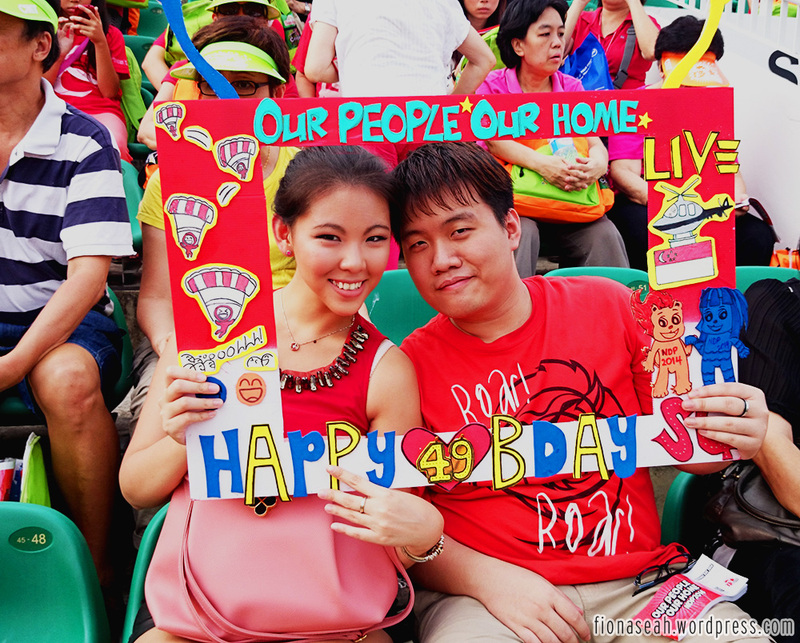 My Dad and Mom were from Outram Primary and Alexandra Estate Primary respectively. Both were closed to make way for new developments. Check out PART 2, PART 3 and PART 4 if you haven’t! 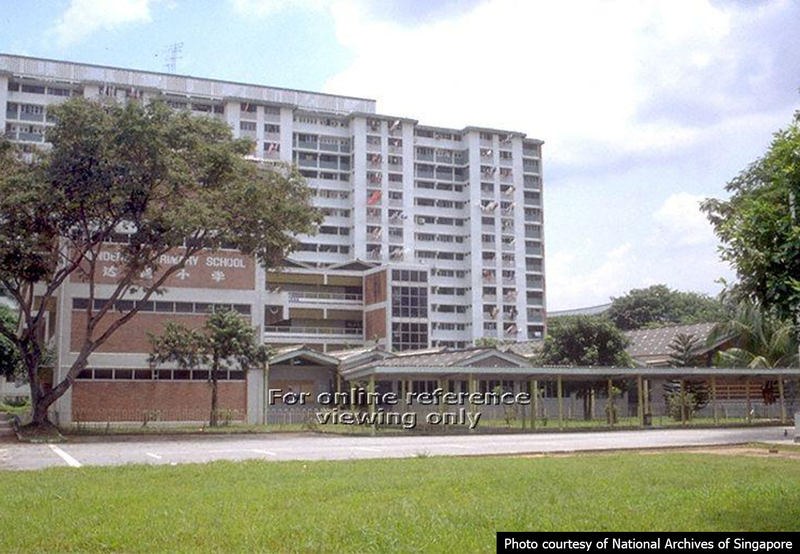 Established in 1954, it is known to be located beside Crescent Girls School previously. 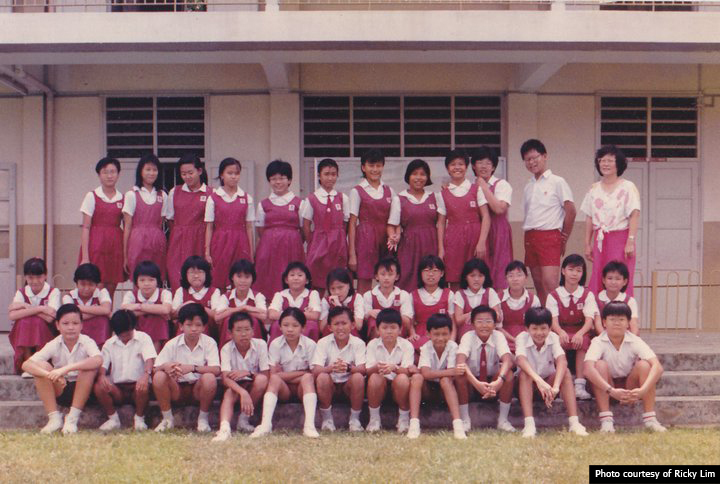 Female students put on their red pinafore dress with white inner blouse while the boys wore white collared top with red shorts to school. Crescent Girls School currently sits on its site. Some of its notable alumni include our Prime Minister’s wife, Ho Ching, as well as her siblings. A new school named Alexandra Primary School (ALPS) was recently built in the vicinity of where AEPS used to be and it started operations this year. It is highly plausible that its name was derived from there as ALPS is seen sharing the history of AEPS on its Facebook page. However, as ALPS is not a direct amalgamation of AEPS and other schools, parents cannot enroll their children in that school under Phase 2A(2). 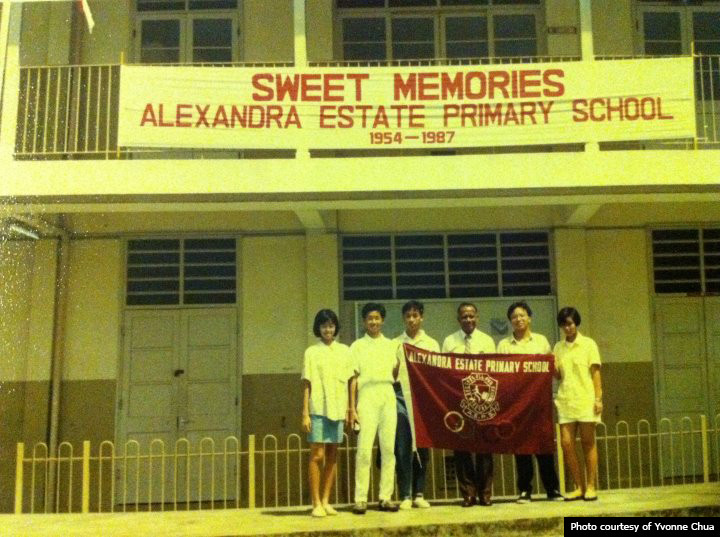 After Alexandra Estate Primary closed, their students were given a choice to transfer to the either the newly merged Jervois Primary or Keng Seng Primary in 1987. 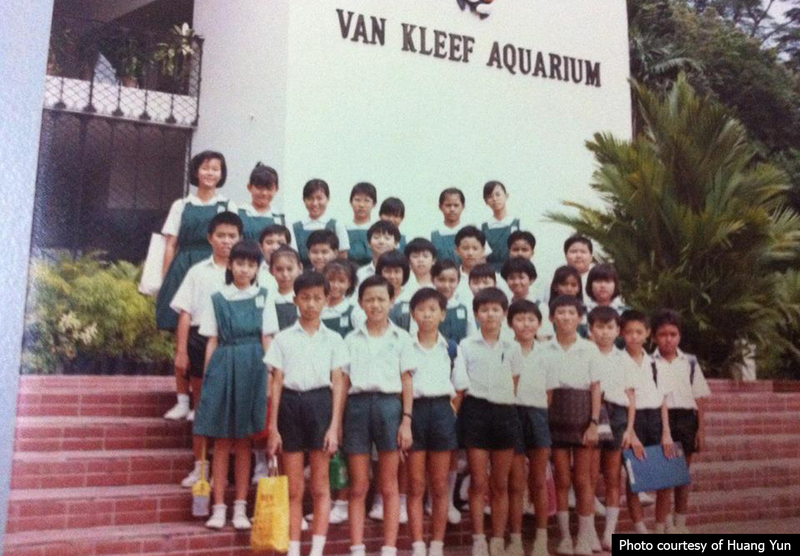 When Jervois Primary was closed in 1989, most of the students joined Keng Seng Primary. 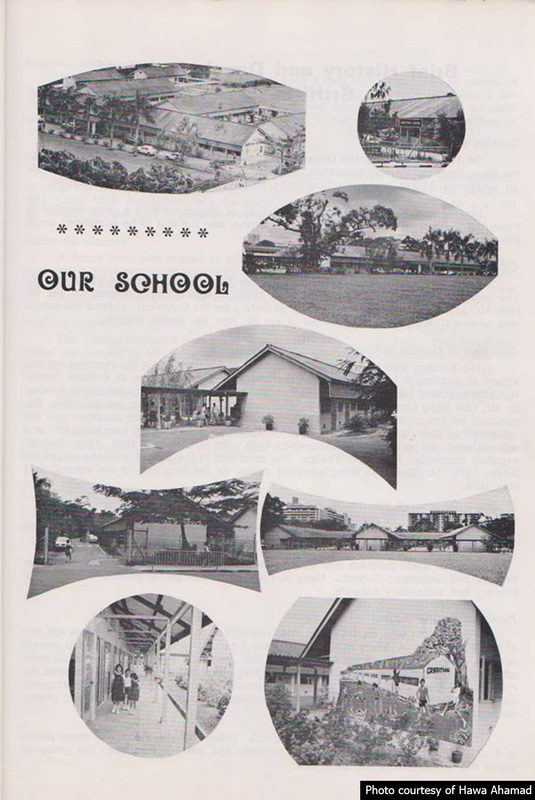 Apart from knowing that they were all very near to AEPS, I can’t really find much information about these schools but it was mentioned somewhere on the net that the site of Jervois Primary is currently used by a halfway house. Their Facebook page (to reconnect alumni) aren’t very active either so there’s absolutely no other ways to check. 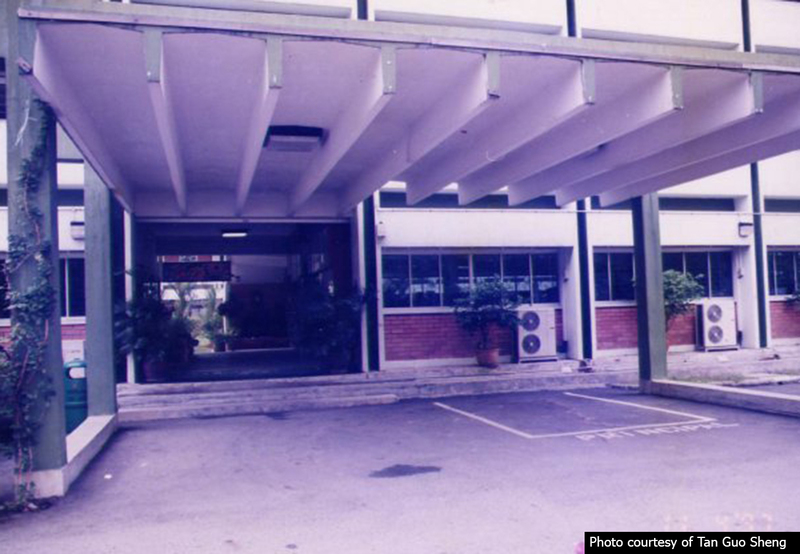 Established in 1975, the 113th school built by the government was situated at the junction of Jalan Membina and Jalan Bukit Merah. It was the first school of the contemporary design built under the Education Ministry’s School Building Programme and had 1817 pupils at time of opening. 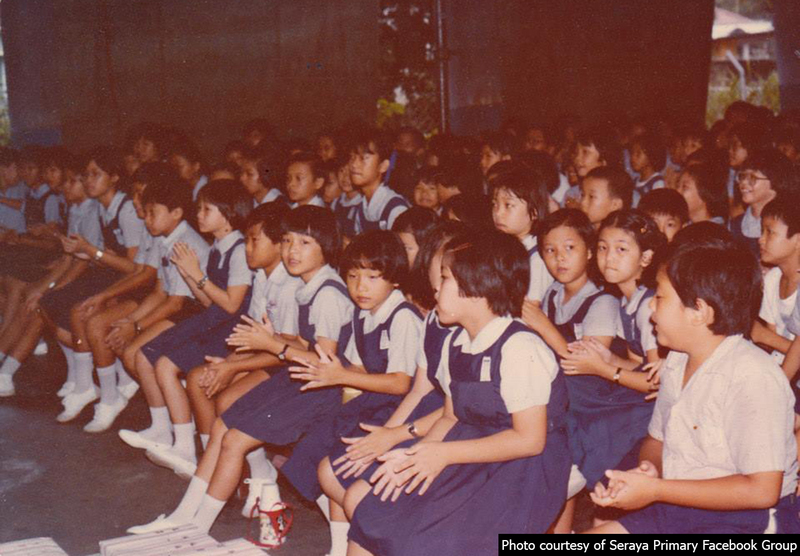 Membina Primary took in students from Tiong Bahru Primary when the latter closed down. 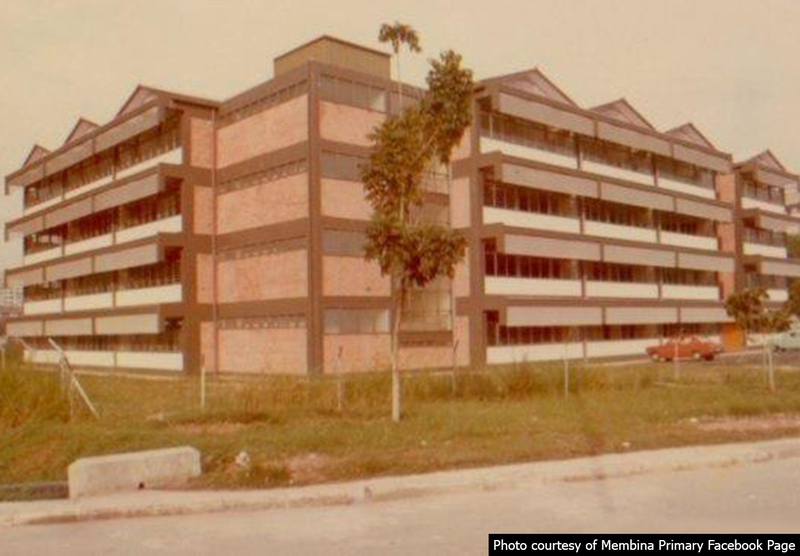 However Membina Primary aged with the estate and lost its appeal. With its history dated as far back as 1930, this school came a very long way. 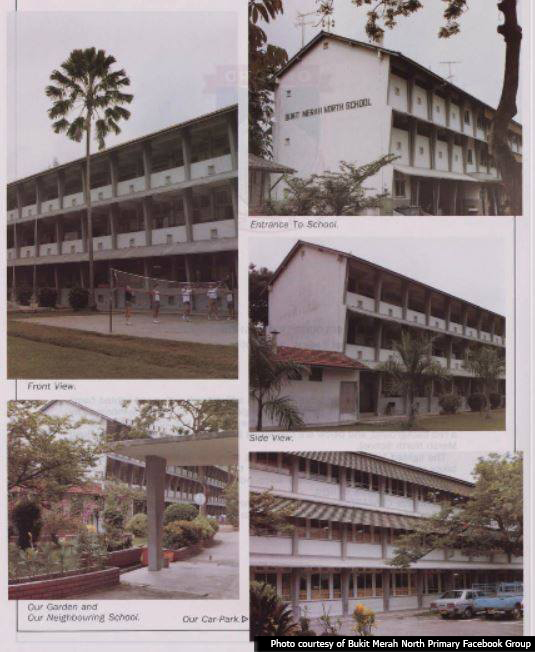 Previously known as Kaimin Public School and Jiemin Primary School (a merged school between Quan Min Primary and Jie Gu School after the Bukit Ho Swee fire but the latter resurrected in 1985 at Yishun), it was described by Colonel Tan Peng Ann as an L-shaped building, with only a single storey on one side for the administrative office and two storeys on the other for classrooms. As not many people drove then, there wasn’t any major carpark but there was a large school field for recreational purposes. 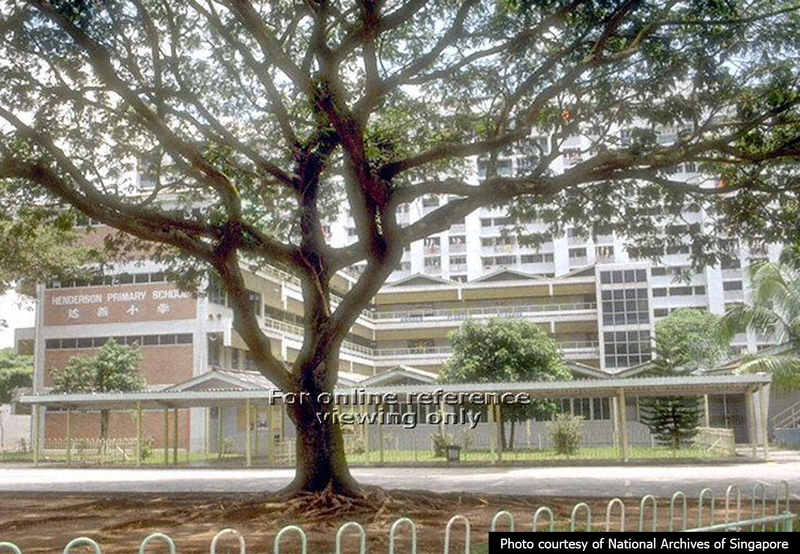 Edit: a reader (Lee Keng Hua) had argued that the school was in fact shaped like a metal staple with a 2-storey admin block before 1980. The canteen was at the end of the school building, opposite the admin block. Are there any ex-students who can confirm this? Pictures of the school are greatly appreciated! Its current site is now occupied by a power station. 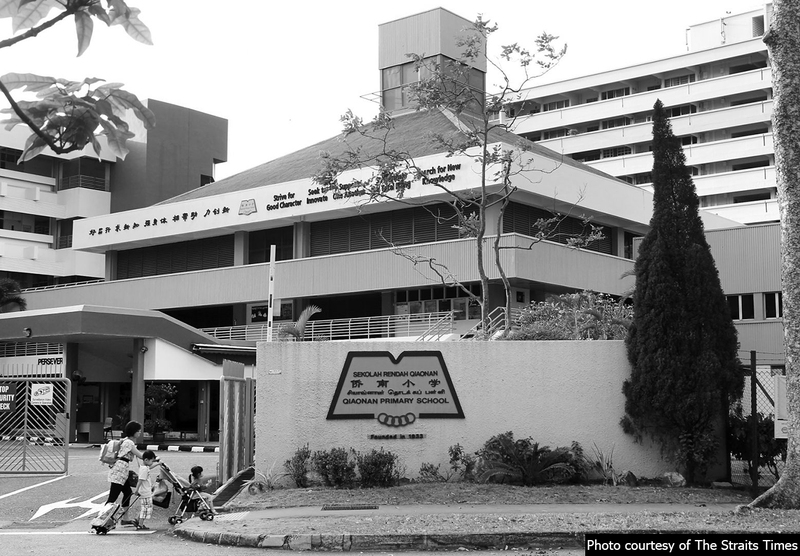 Bukit Ho Swee Secondary was officially opened in 1967 at the corner of Lower Delta Road and Jalan Bukit Ho Swee while Tiong Bahru Secondary, located beside Lower Delta Road (in front of the present Tiong Bahru Plaza) was established in 1966. 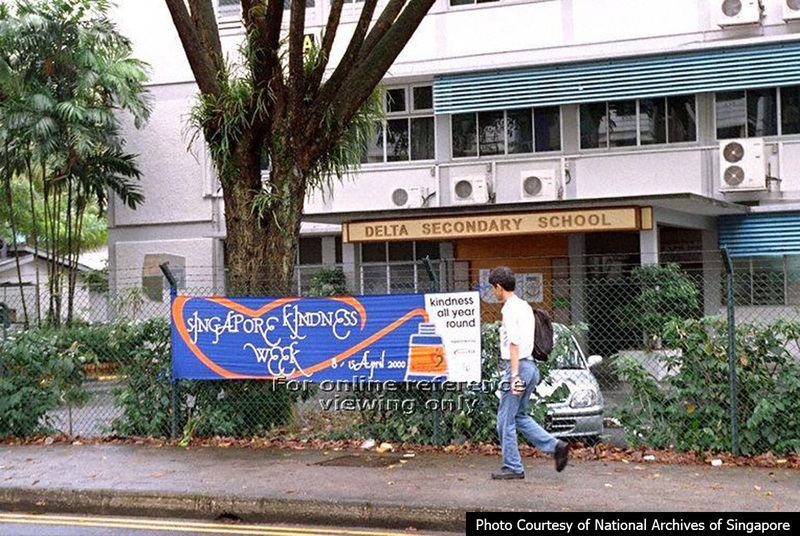 Both were the most popular secondary schools in the neighbourhood. 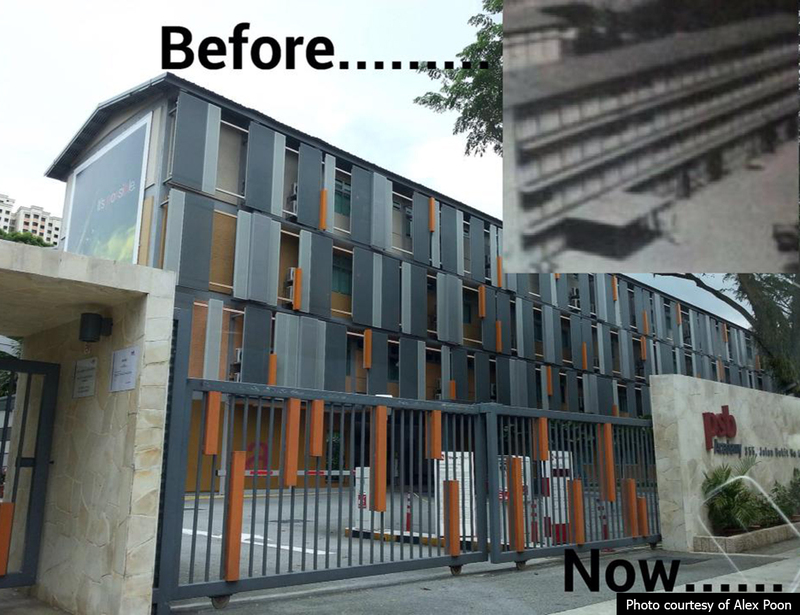 Bukit Ho Swee Secondary – before and now. 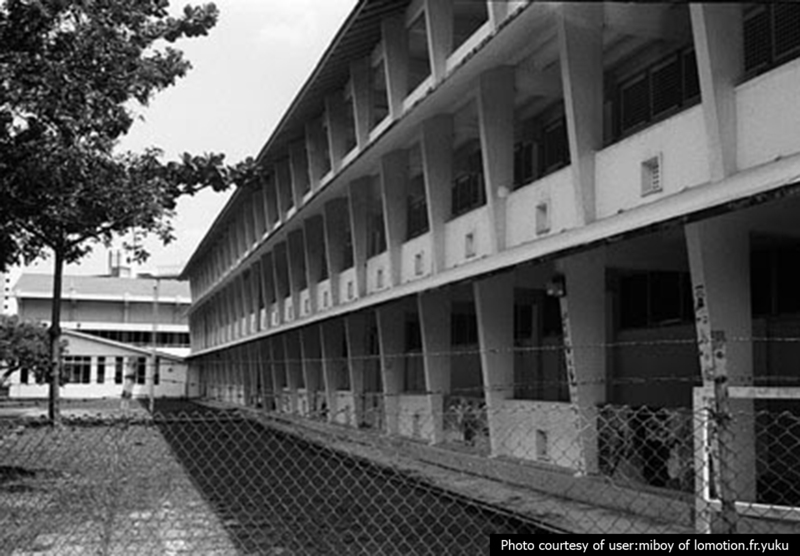 The “structure” of the Bukit Ho Swee Secondary School building can still be seen. 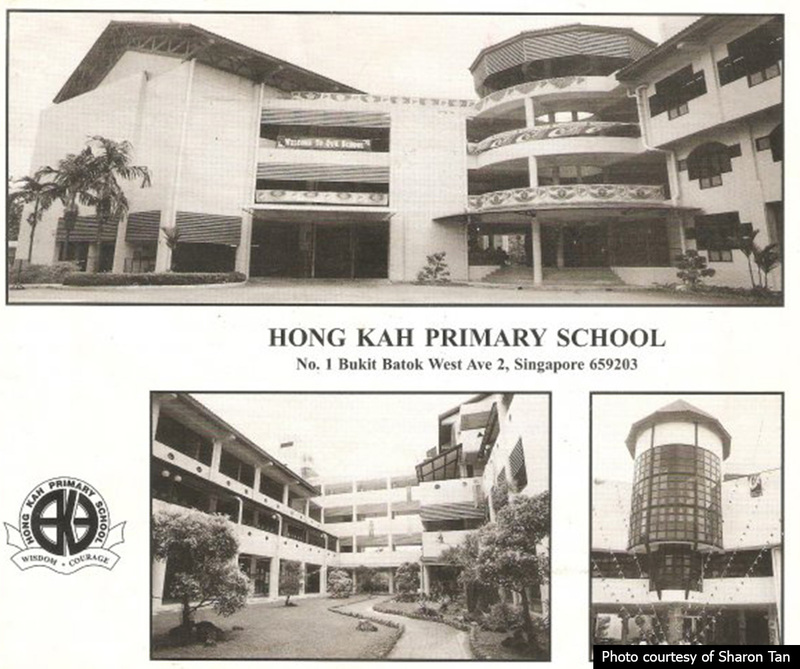 Tiong Bahru Secondary was also where my wilful Mom studied for 2 years before she decided to drop out. The first merger proved ineffective as enrolment didn’t pick up, probably due to the aging population in the estate and more young families were moving out to new towns. 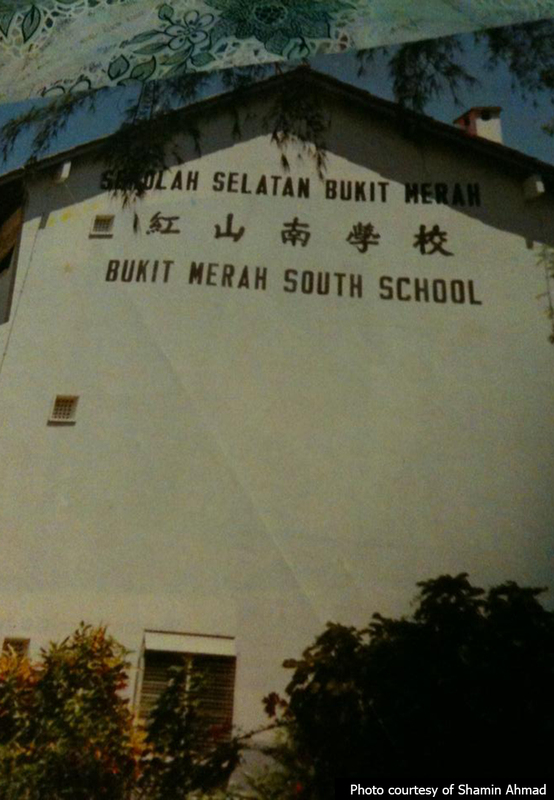 Delta had to merge (again) with Bukit Merah Secondary in 2004. The newly merged school is now functioning at the newly built Bukit Merah Secondary School site at Lengkok Bahru. Ex-pupils of Delta Secondary may wish to reconnect with their schoolmates here (restricted access). Technical studies were very sought after during the 1960s which prompted the government to set up 2 main technical schools then (the other being Queenstown Technical – now Queenstown Secondary). The purpose of such schools was to educate students and prepare them for engineering and technical working sectors (industrialisation). 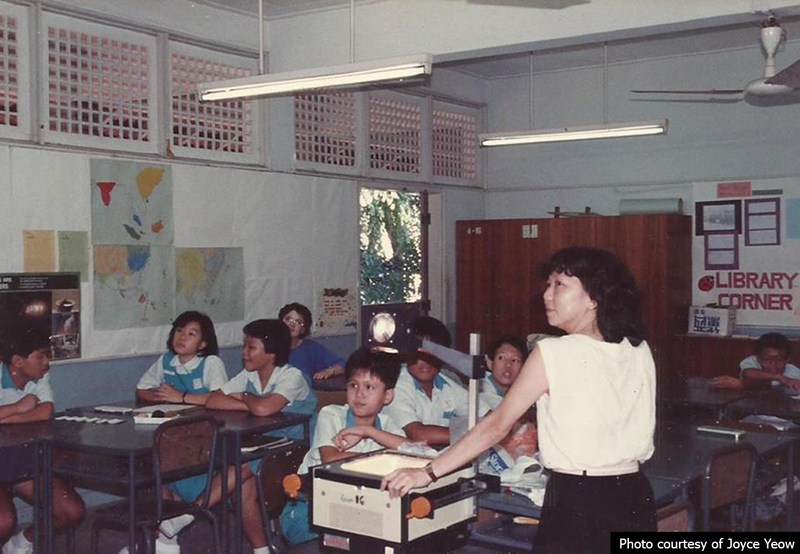 I’ve chosen to feature Tanglin Tech, even though it still exists today, because it’s one of the pioneer technical schools that molded education in the present future. And most importantly, my Dad had his secondary education there. 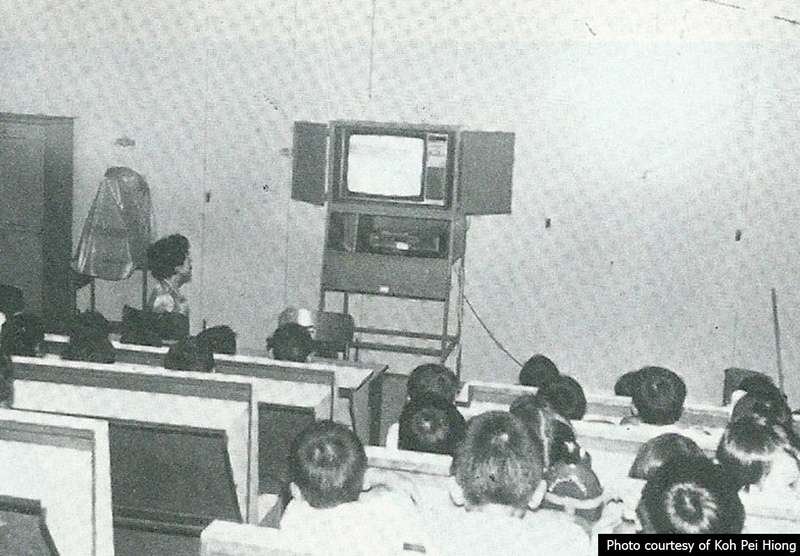 The school started out as an all-boys school where medium of instructions was Chinese. Then it started admitting female students to its technical courses after the first renaming exercise. 50 years later, it is no longer at Tanglin Halt, but at West Coast Road. Unfortunately, I spoke too soon. 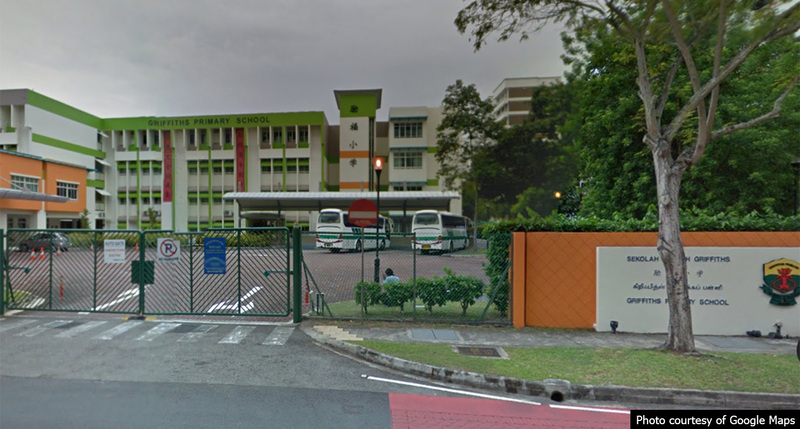 It was reported in the news on Saturday (26/7/2014) that the school will be merging with Clementi Woods Secondary School due to falling enrolment but it will still be operating on the former’s current site. 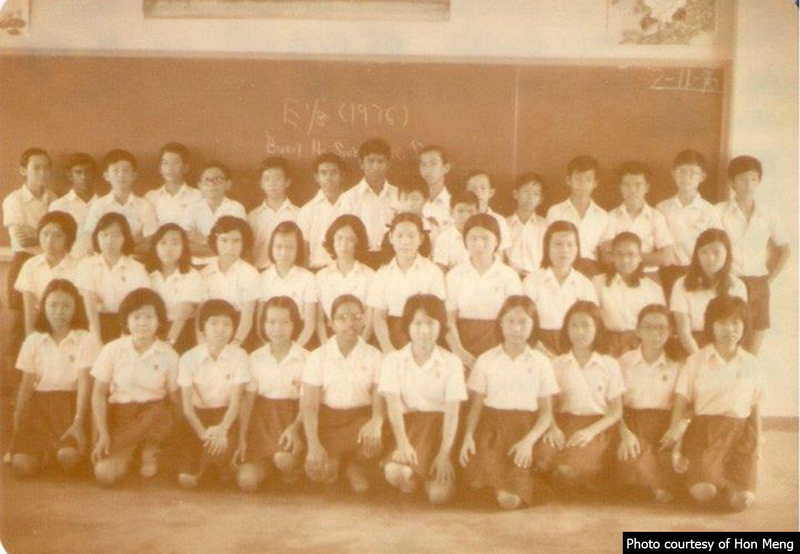 Ex-students of the 50-year-old school are hoping for the merged school to be Tanglin’s namesake. To join the rally, click here. 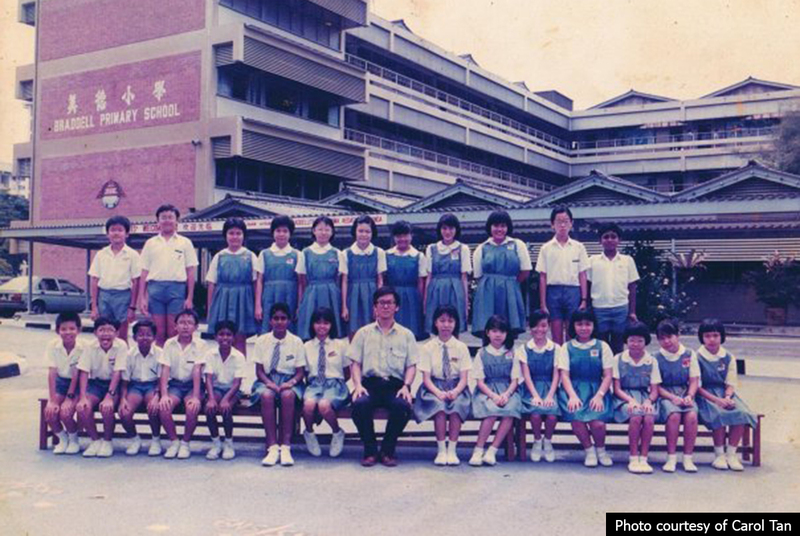 The newly merged school will be Tanglin’s namesake. 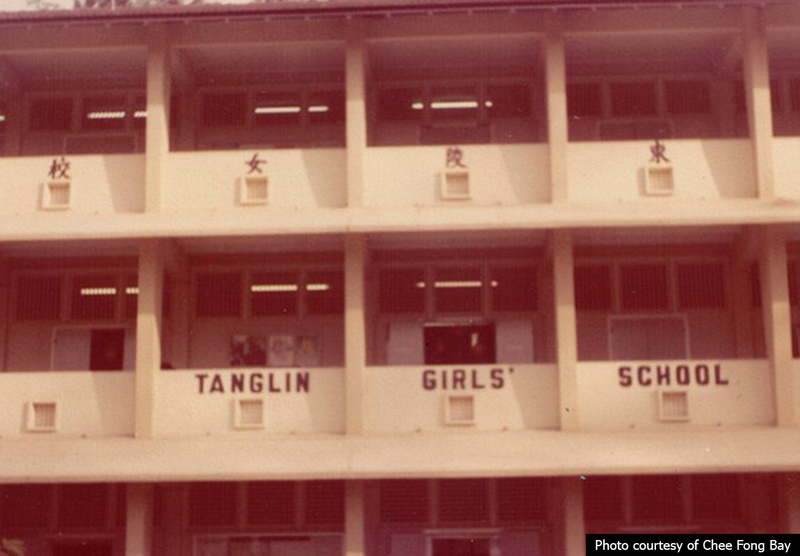 Established in 1957, Tanglin Girls’ was a four-storey high building on top of a slope (was it a trend in the past to place schools on higher altitude? 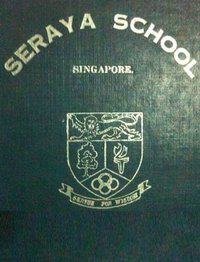 Haha) and was also considered as one of the better schools in Singapore. 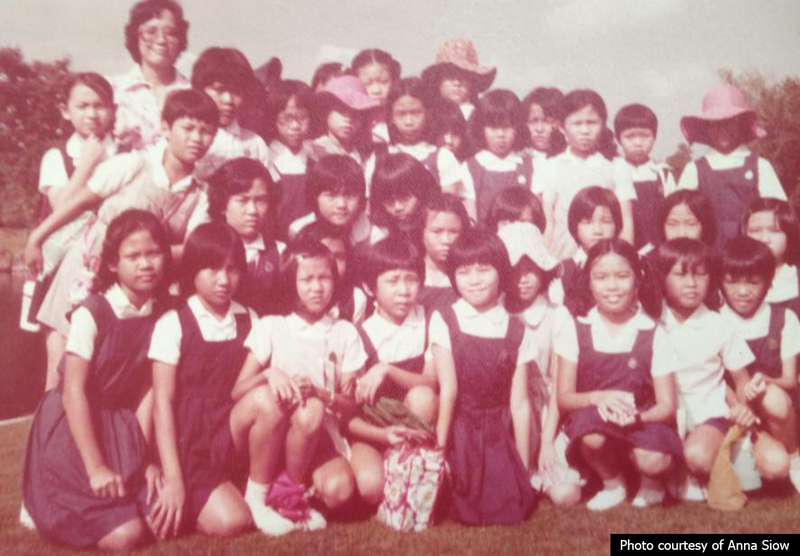 Students wore white blouse and dark blue pinafore. 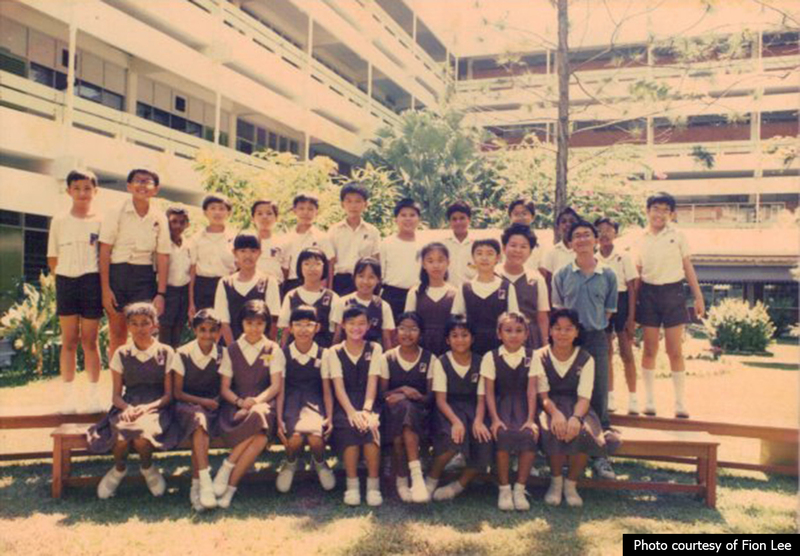 Ex-students of Kay Siang spoke briefly of the school being formerly known as Tanglin Boys’ School but in actual fact, Kay Siang and Tanglin Boys’ started out as two separate schools. 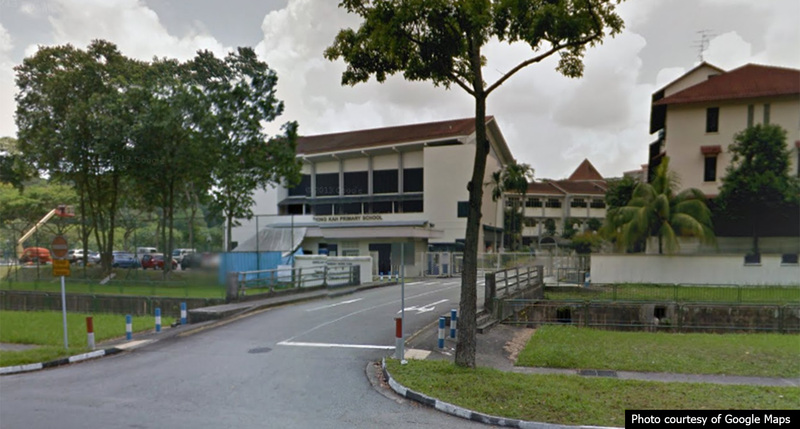 The 3-storey Tanglin Boys’ School probably merged with Kay Siang along the way and became co-ed. 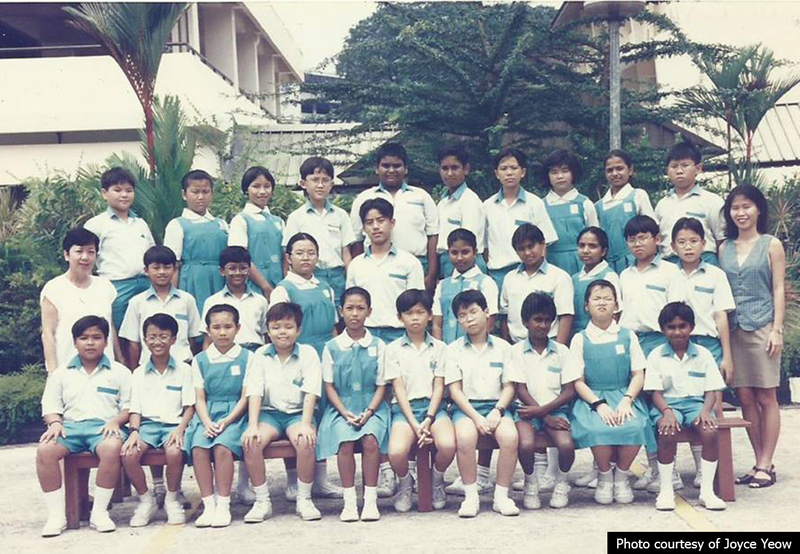 The first batch of students in Tanglin Girls’ and Boys’ were mostly from Bukit Merah South, Bukit Merah North and Redhill Schools. These three schools also have their own history documented below. Other than this, nothing much can be found about Tanglin and Kay Siang. The amalgamation between Tanglin Girls’ and Kay Siang Primary proved to be ineffective as the merged school still couldn’t sustain past 2 years. Probably due to dipping enrolment, it was subsequently merged with Belvedere School which was just a road away. The school had a very unique location, at the top of a hill above Crescent Girls’ School. 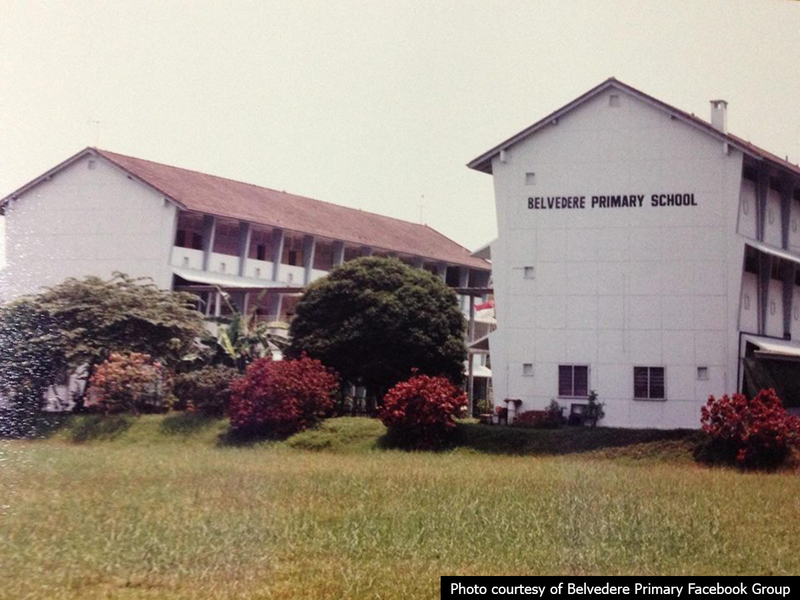 Singapore Poly started in borrowed premises at three sites, one of which was Belvedere School. 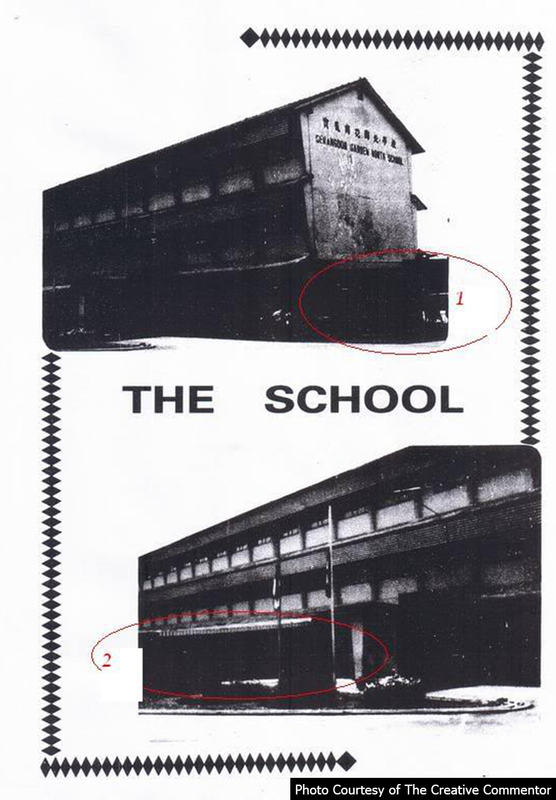 The school complex was eventually demolished with all the schools under its wings erased from the national school directory forever. 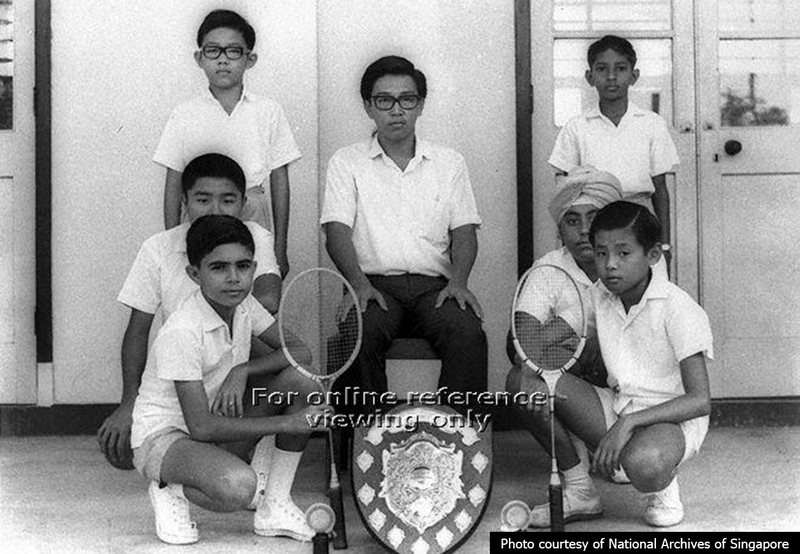 Notable alumni includes Pritam Singh, a Member of Parliament from the Workers’ Party. 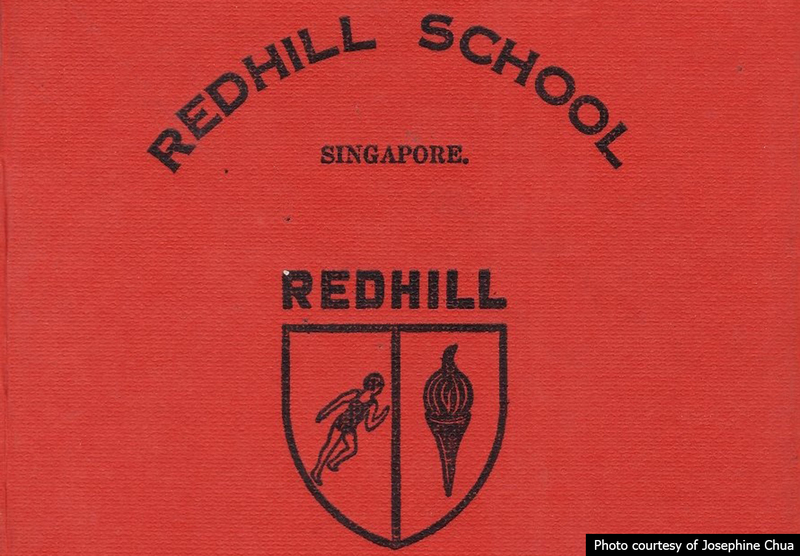 Both schools have a history so rich that they have their own article on Singapore Infopedia. Pearl’s Hill School was established in 1881 and underwent several name change and relocation before settling on its final one in 1914 and 1972 respectively. 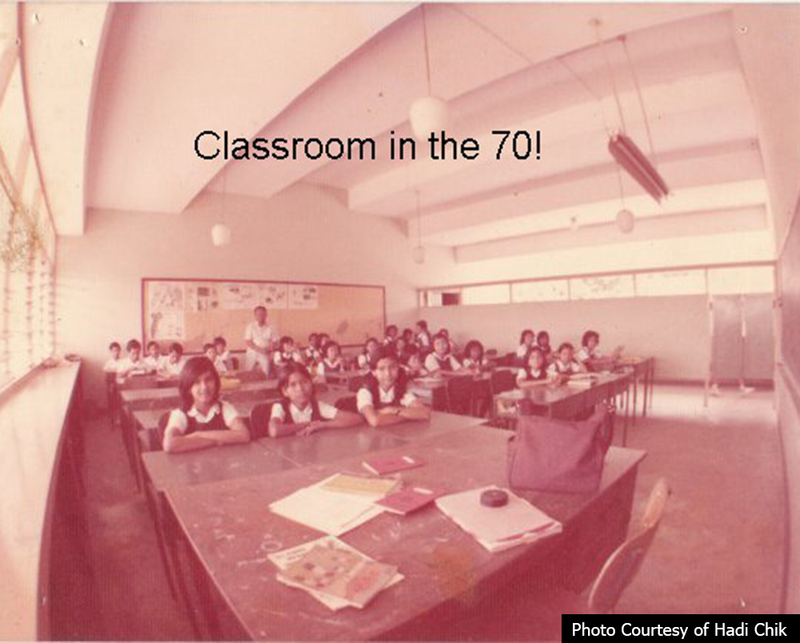 Initially located at Cross Street, it was among the first batch of government English elementary schools established by the British colonial government. 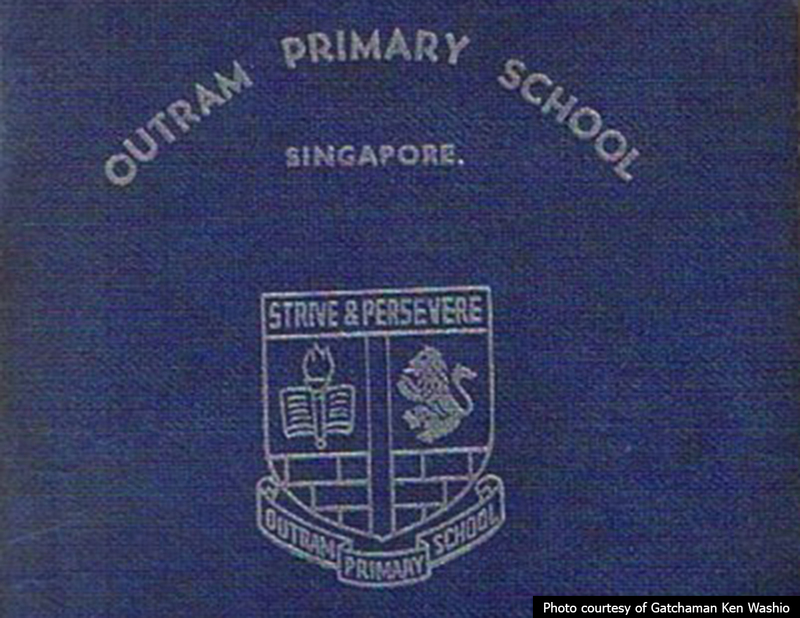 It was affiliated to Outram Road School (later known as Outram Secondary) and students who had finished their Standard One education (PSLE in the olden days) would be posted there. It was finally homed in a 12-storey building on the slopes of Pearl’s Hill at Chin Swee Road, making it the tallest school building ever built in Singapore. The new Pearl’s Hill School ceased operations in December 2001 due to dwindling enrolment. Hotel Re! presently occupies the building. Located near Pearl Hill Terrace, it was closed to make way for the construction of Outram Park MRT station. 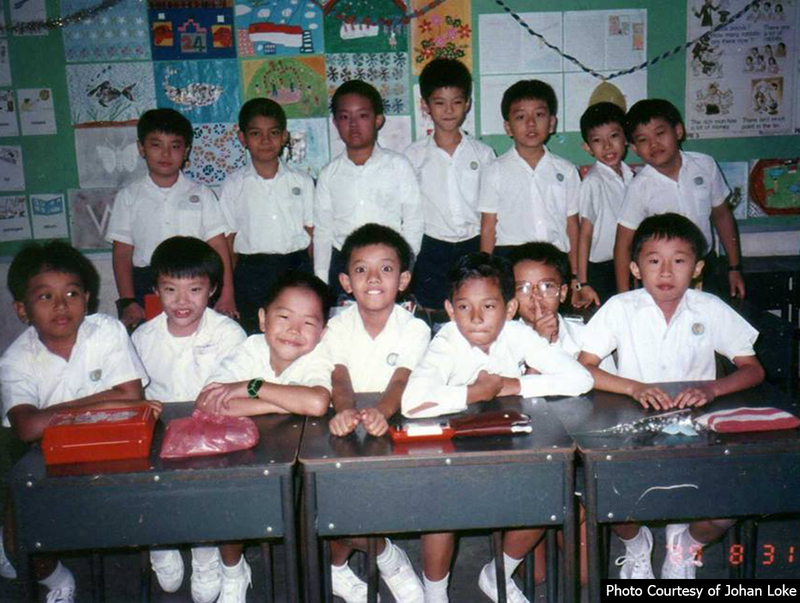 Students and staff from Outram Primary went to Zhangde Primary School (next to Singapore General Hospital) when the school ceased to function. I’m not sure if this is considered as a merge but it could be, since Outram Primary is mentioned on Zhangde Primary’s history. This happened quite recently but it still deserves a mention because they had been around for a long time, at least for Alexandra Hill. 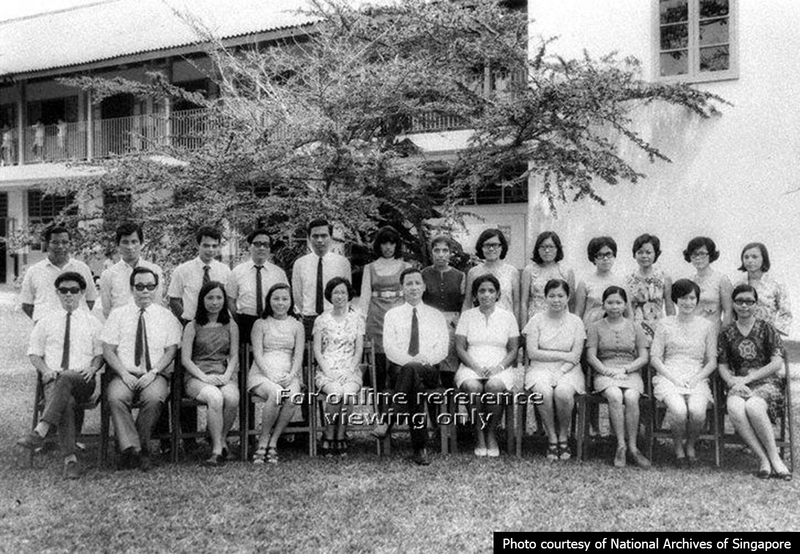 Even though its year of establishment isn’t stated anywhere on the net, I reckon that it existed since the 1960s as Dr Amy Khor (Member of Parliament for Hong Kah North) was a student there from 1964 to 1969. 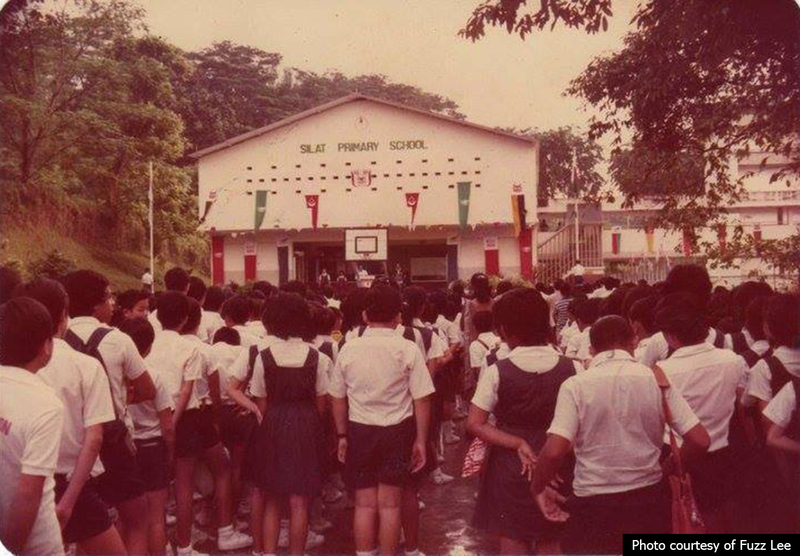 Bukit Ho Swee, on the other hand, was actually a merged school between Bukit Ho Swee East School (English-medium) and Bukit Ho Swee West School (Chinese-medium) formed in January 1986. Prior to the merger, East’s uniform was white and brown while West’s was light blue. 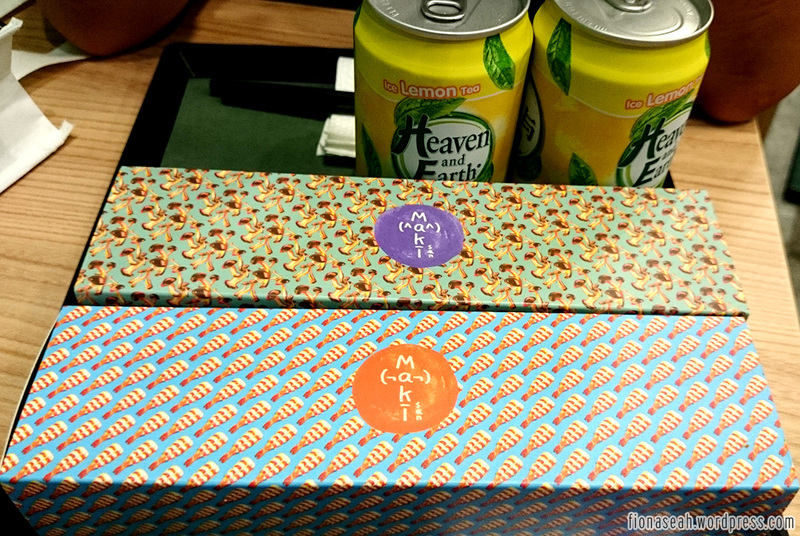 Both schools shared a common tuck shop but had two assembly grounds. 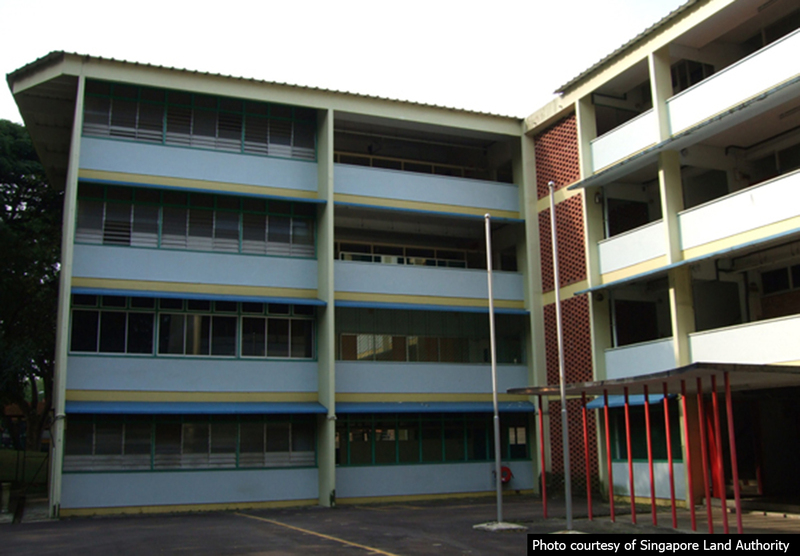 After they were combined, only Bukit Ho Swee East Primary’s building was utilised. The image of the dilapidated premise is still fresh in my mind because my Dad had to drive past it after visiting my grandparents at Jalan Bukit Ho Swee during my younger days to get home. I kinda foresaw the closure of that godforsaken place. Singapore Exam and Assessment Board had since taken over its site. 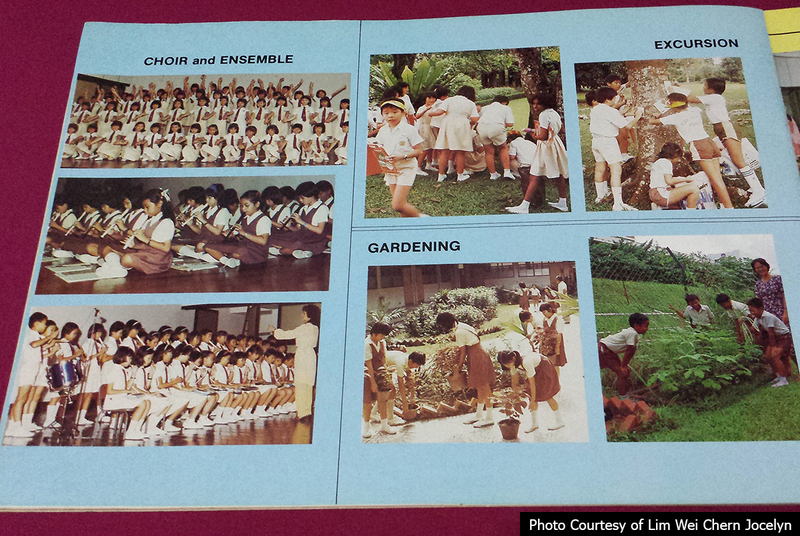 Keng Seng Primary seems to get the most limelight from the merger as it even got its own book. 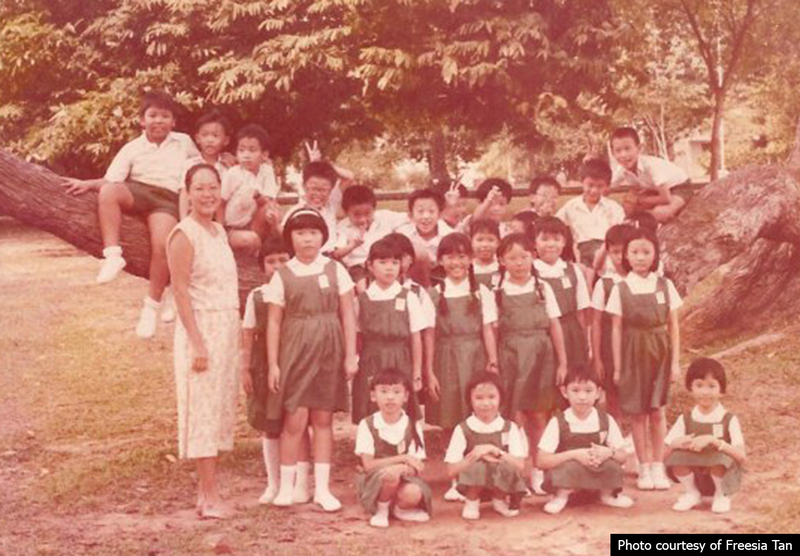 Like Bukit Ho Swee, it was also an amalgamation of many schools – three, in fact – namely Keng Seng School, Strathmore Primary School and Friendly Hill Primary School in 1980. 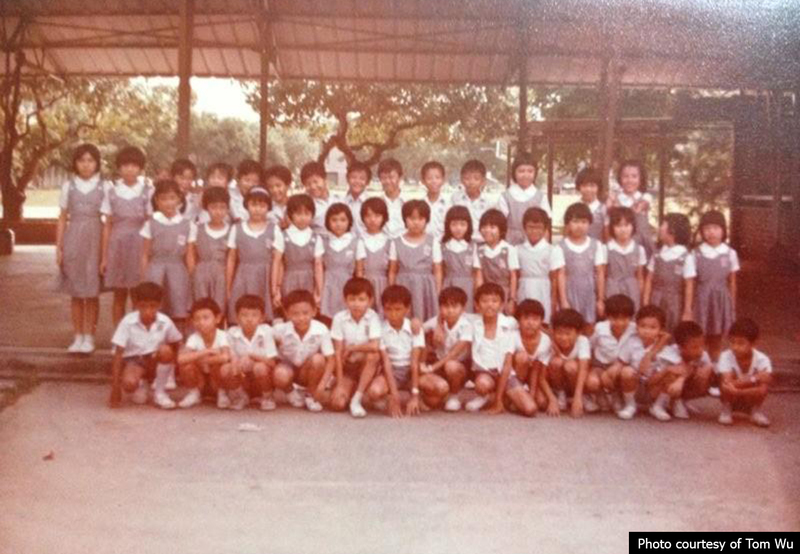 You can pretty much tell from here that Keng Seng Primary is an old school. 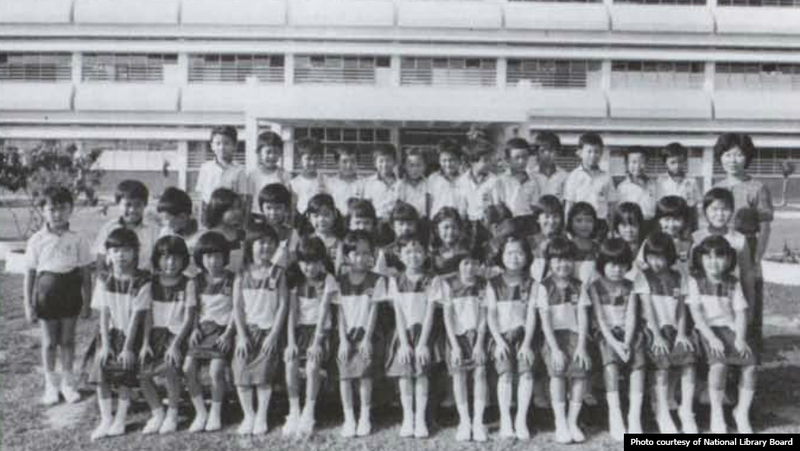 Keng Seng School came into existence in 1939 through donations from farmers who were supportive of education. These were pig farmers who lived around the area, hence pig faeces along the way school were a common sight for students in those days. Occasionally, the pigs would also break into the classrooms! 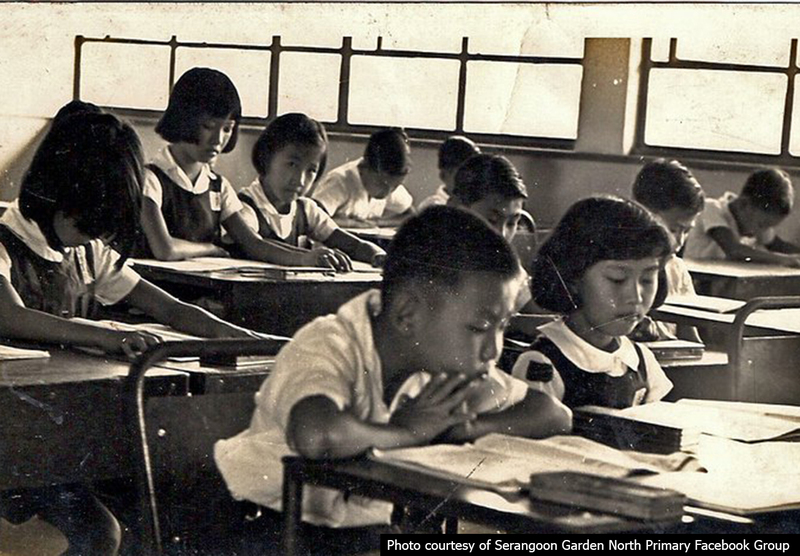 However, preference for English education grew by the mid 1970s, leading to the decline of Keng Seng’s popularity among parents. 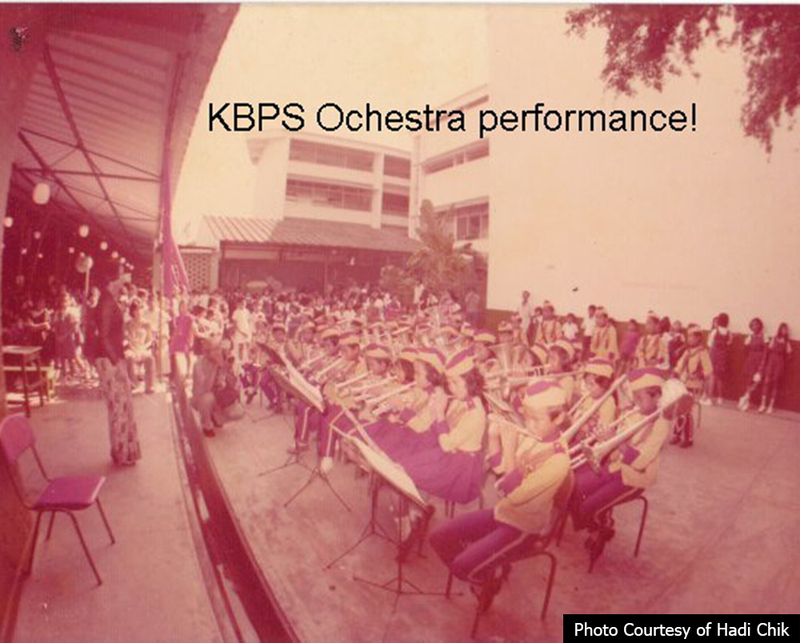 Keng Seng was down to less than 300 students by then and hence had to merge with two other schools. 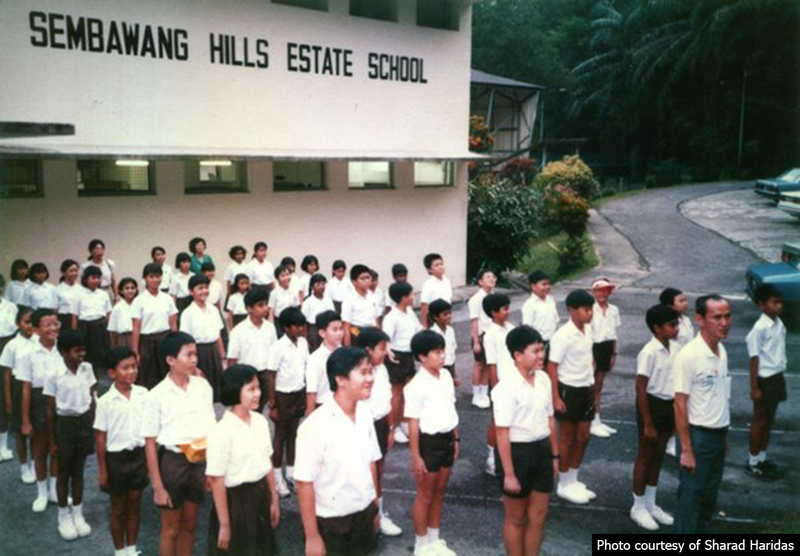 Although the name “Keng Seng” was retained after the merger, it had to take on Friendly Hill’s school crest and Strathmore’s school song. 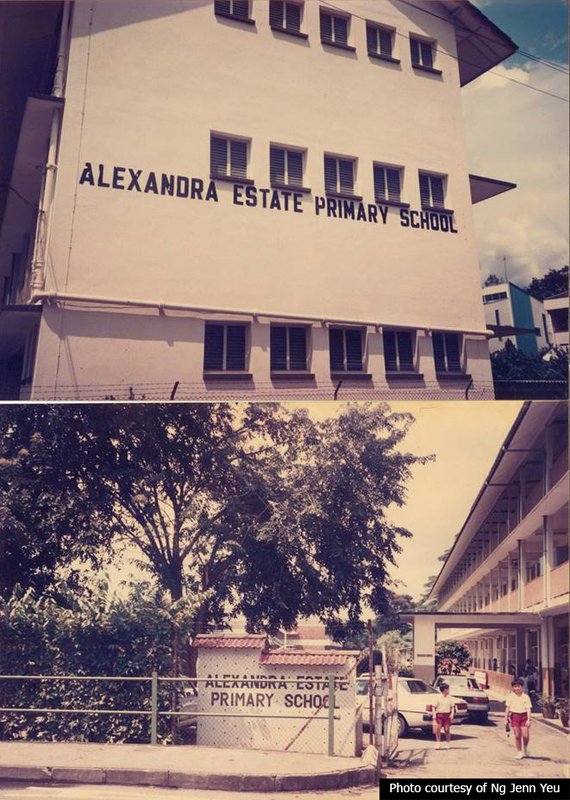 The amalgamated school relocated to Alexandra Road. More information about the parents schools (Friendly Hill and Strathmore) can be found in part 3. As for Henderson Primary, it closed without a trace so I can’t really find any information about it. No one, even its ex-students, documented on its history before the merger? What a waste. 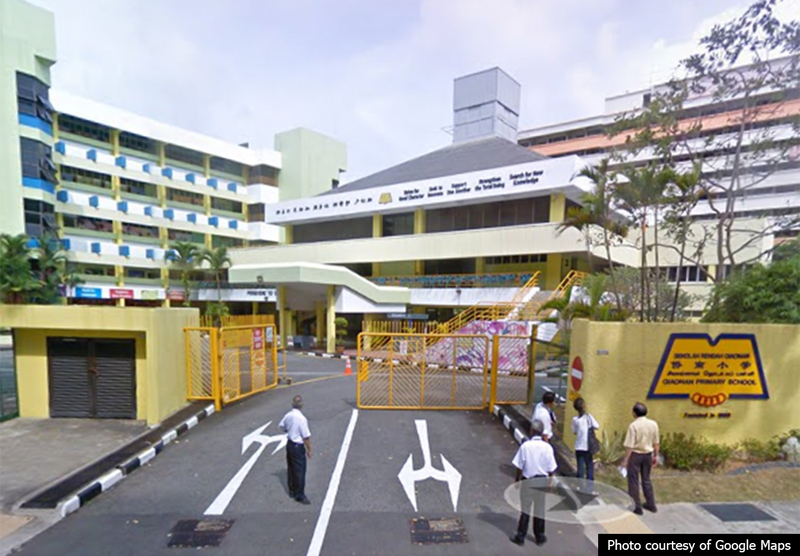 Gan Eng Seng Primary is presently located at the former site of Alexandra Hill Primary. These three schools were adjacent to one another and they shared a big field where cows and other animals roamed. 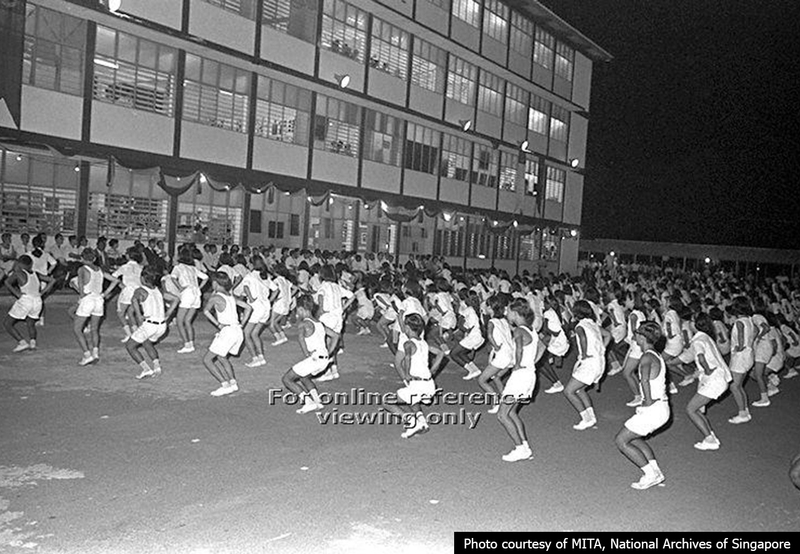 Bukit Merah North School was founded on 10 January 1955, conducting classes at Crescent Girls’ School and then at Delta East School (defunct as well). It only shifted to its latest location at Redhill Close in September 1956. The other 2 schools, I believe, were also there since early 1950s. The ancient OHP projector that we all missed. 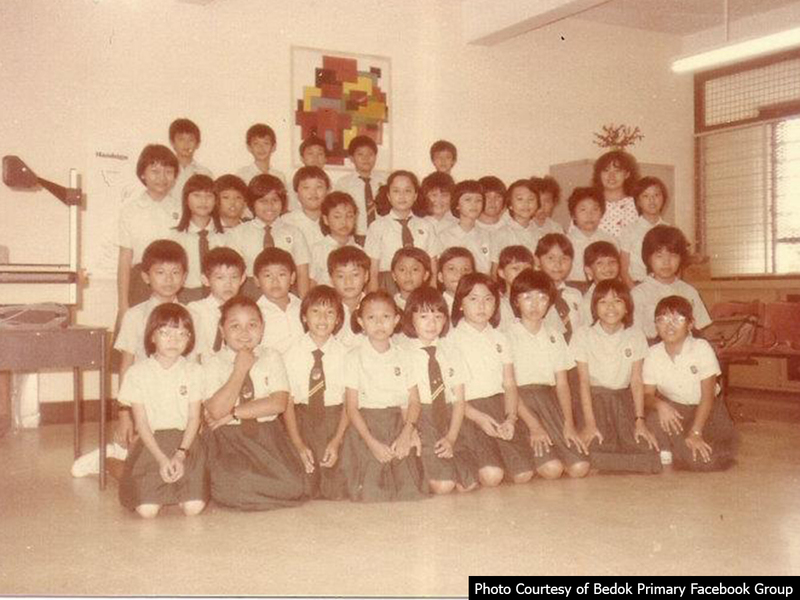 Bukit Merah Primary School shut its doors 12 years later due to falling enrolment and was subsequently merged with Alexandra Hill Primary School. 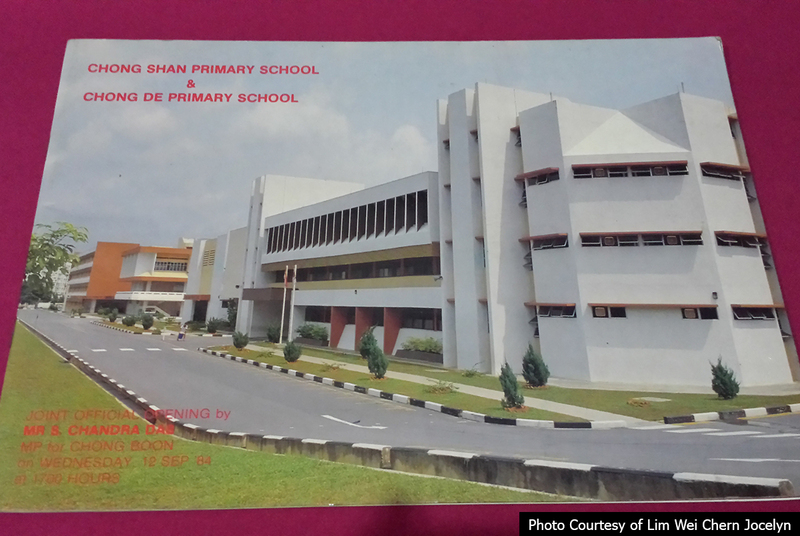 The newly merged school was then shifted to Telok Blangah a year later and the old site was revamped to the current Gan Eng Seng Primary School. Gan Eng Seng School now sits on a smaller piece of land space, as some land area was cut off to Bukit Merah Secondary School. Did you know? 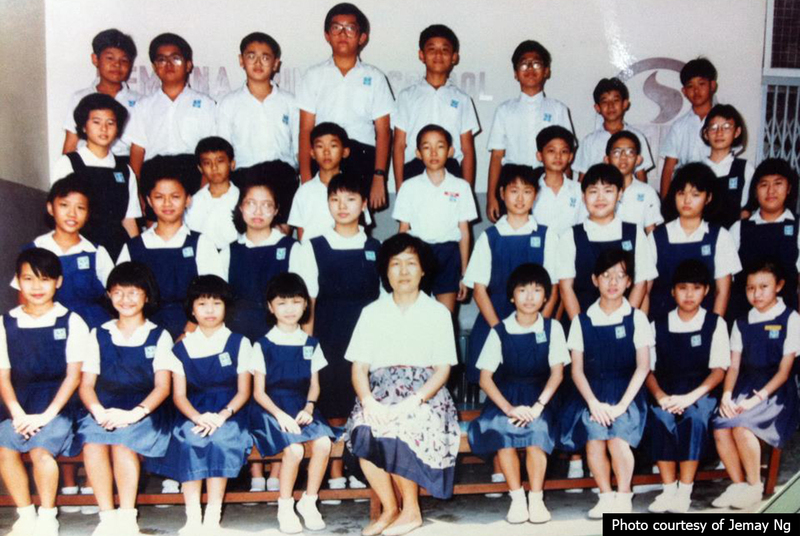 F4’s Ken Chu attended Bukit Merah Primary School during his 8-year stay in Singapore. 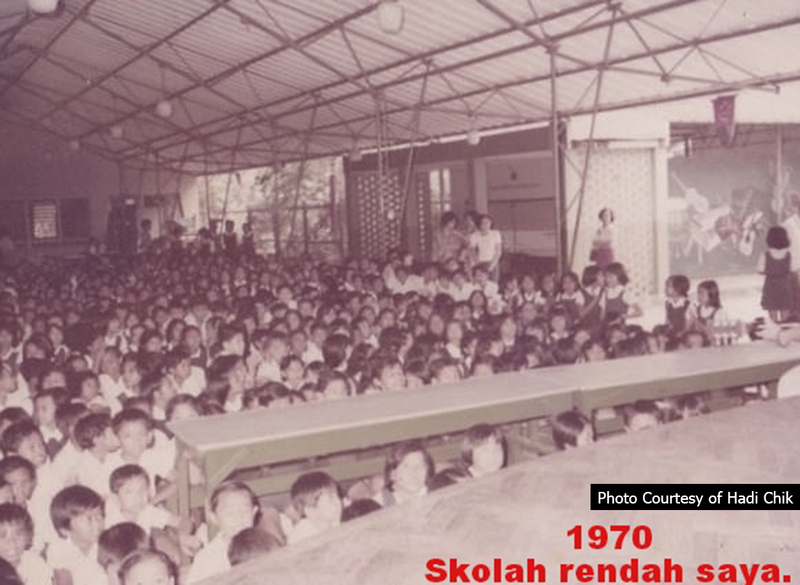 This school is a result of the merger of two primary schools in 1984 – Silat I Primary and Silat II Primary. The six-storey white building was at Silat Road in old times. 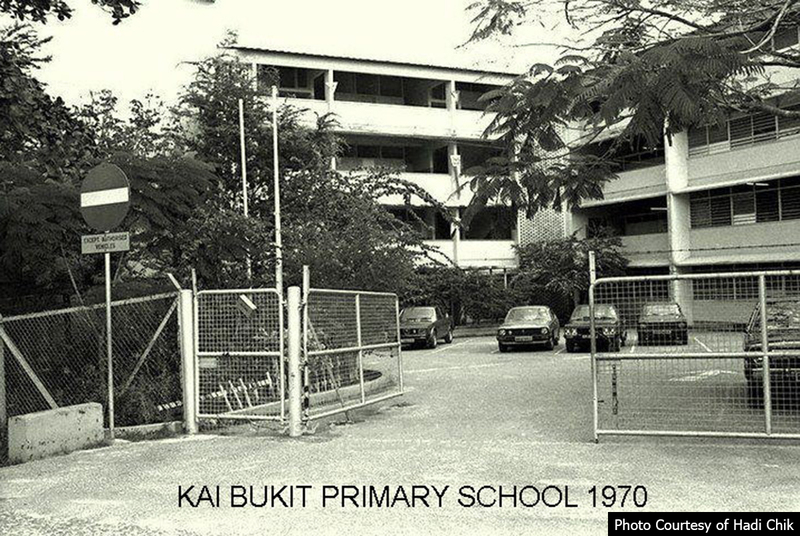 That stretch of road where the school once stood is now renamed to Bukit Merah Road. The school field was also reduced by almost a third to make way for the road that now runs in front of it. 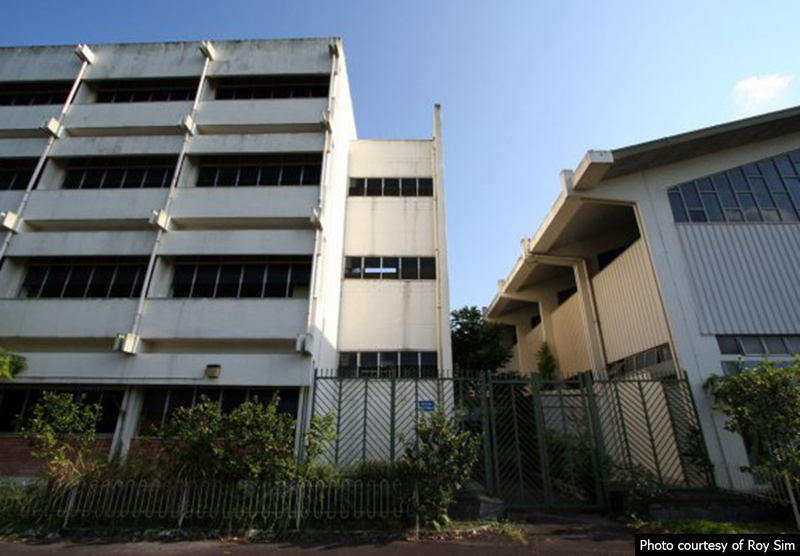 Judging from the photographs taken by ex-students (as recent as 2013) who went back to explore, the abandoned building was probably still standing on the same ground not too long ago. But Street View shows something else when I tried to look it up so it could already be gone by now. The school was closed (last batch was in 1991) following a declining enrolment rate and its students joined Zhangde Primary, which is still existent today. 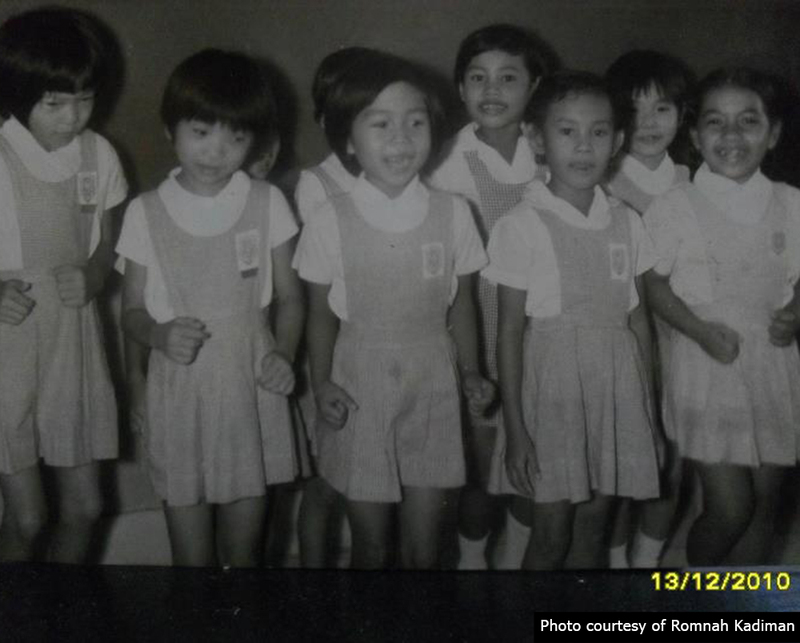 Local actress Fann Wong was there from 1978 to 1983 before it was merged with Kwong Avenue School and renamed to Sennett Primary. After not offering primary one places for two years due to low demand, the school was closed in 1999 and students were transferred to nearby Cedar Primary School. At the same time, Jagoh Primary was also earmarked to close due to low enrolment. Its students were transferred to Blangah Rise Primary School. Singapore Indian Fine Arts Society presently sits on the former site of Rangoon Road Primary. 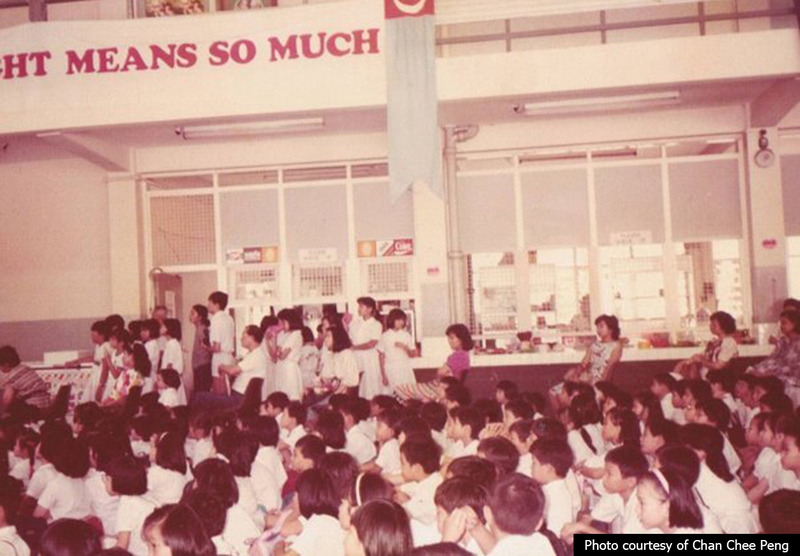 This school was form by merging two schools – Whampoe School (est. 1950) and Towner School in 1984 – and catered mainly to the population in the immediate vicinity of the school. 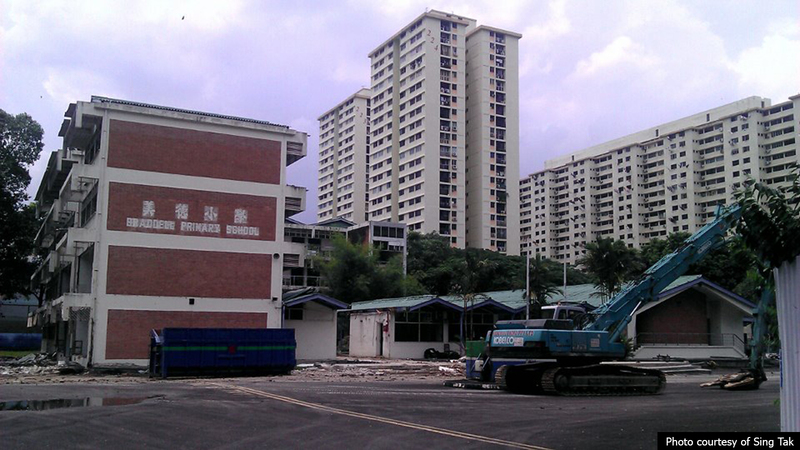 However, it was demolished to make way for HDB flats and students moved over to May Primary School. This school was an amalgamation between May South (blue uniform) and May North (green uniform) Primary School and students in the newly established school wore blue and green uniform. When Cambridge Primary shut its doors in December 1998, its remaining students were also absorbed by May Primary. However the school was later vacated and renamed May Adventure Camp. 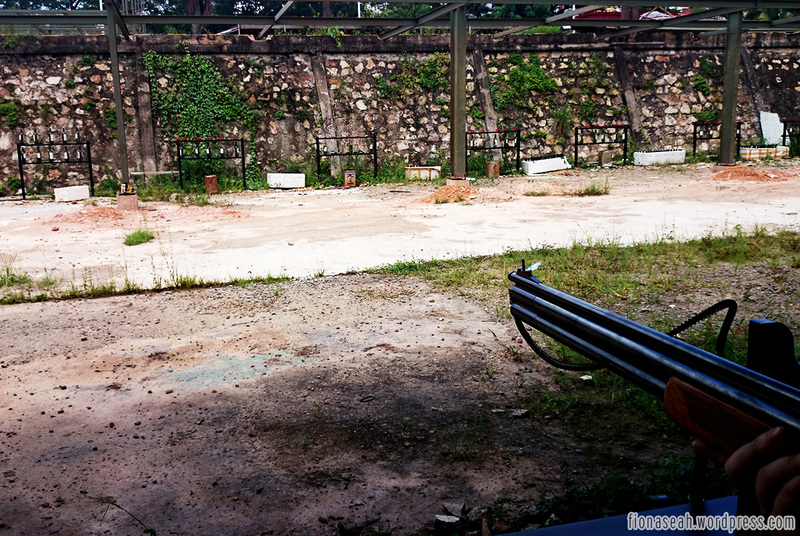 Its park nearby was also converted into an expressway. 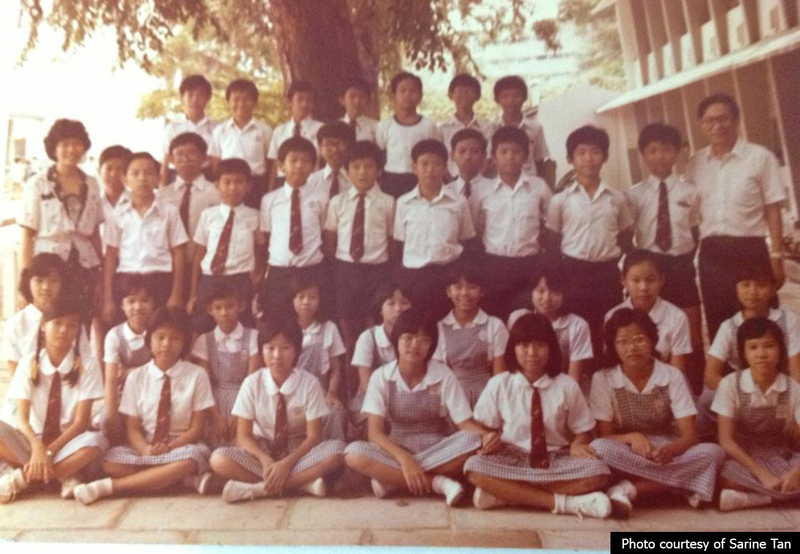 Yam Ah Mee (think General Elections) was from May North Primary School. Established in 1956, the school moved into its own premises at 49, Kensington Park Road. 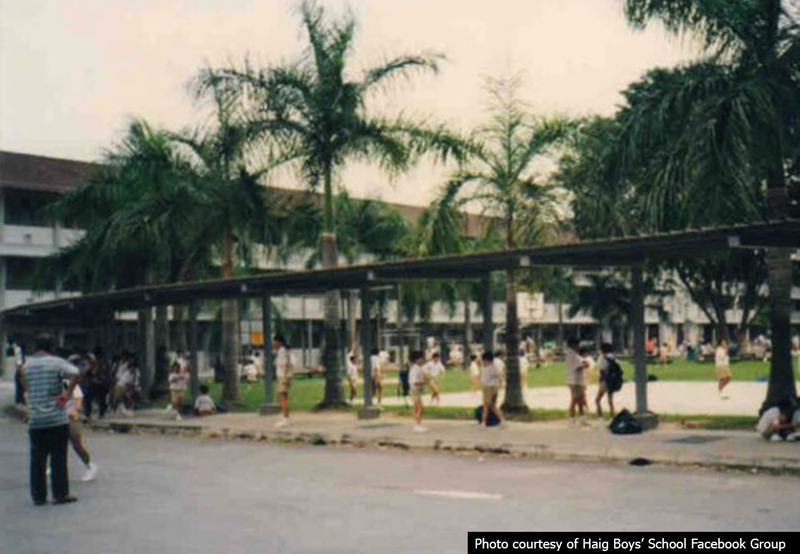 Students there used to fight (playfully) with those from Serangoon Garden South when they crossed the centre-line of the field into their territory. 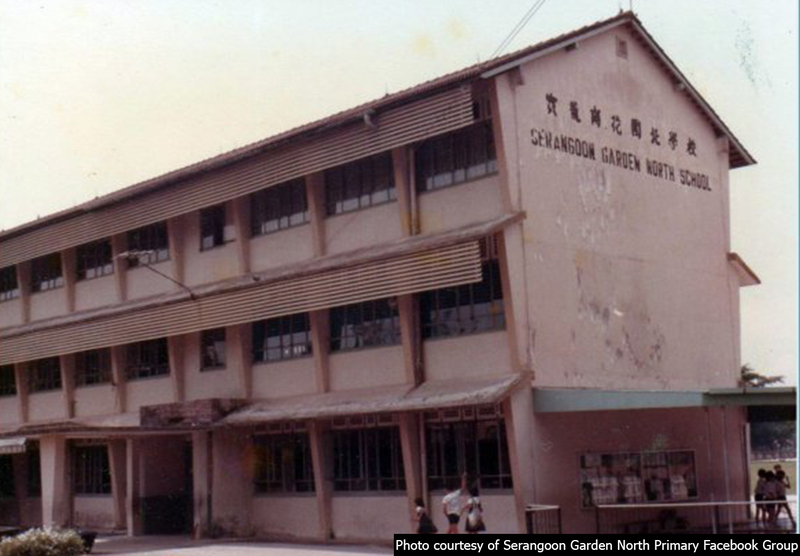 However, the latter was later proved to be victorious when it took over Serangoon Garden North to form to new Serangoon Garden South School (probably because it was established a year earlier). 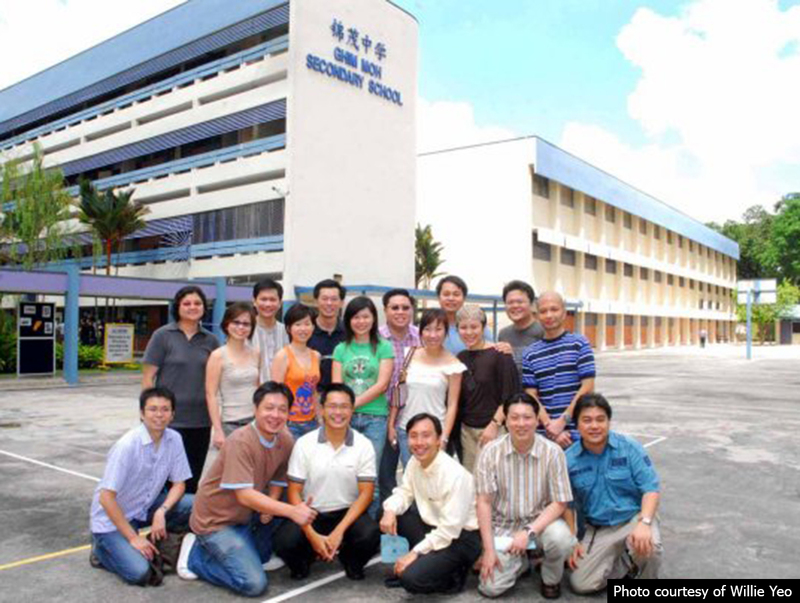 But that victory was short-lived as in January 2007, the school was merged with Zhonghua Primary School and is now located at Serangoon Ave 4. 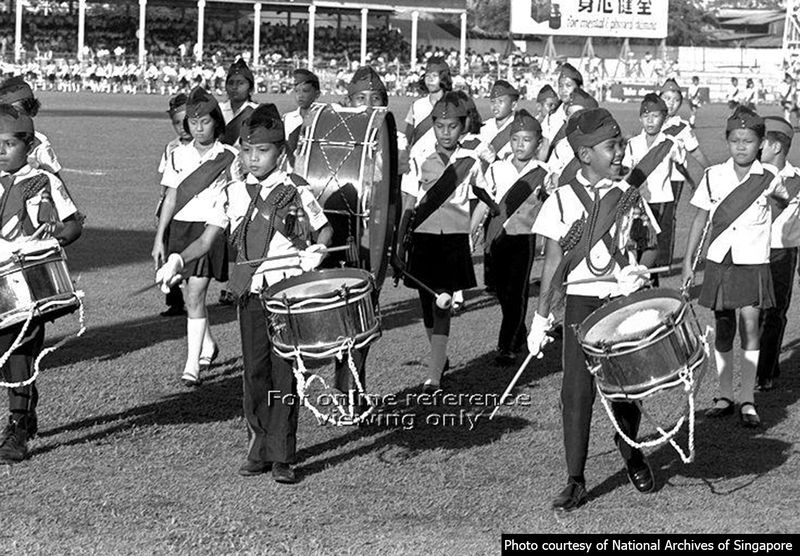 Founded in 1963, the school was loosely associated to the police force for having a homophonic name to “mata-mata” (Malay for “Police”). Luckily for them, they had a neighbour with a similar name (Mattar Primary) and a minister named Ahmad Mattar which cushioned the teasing. 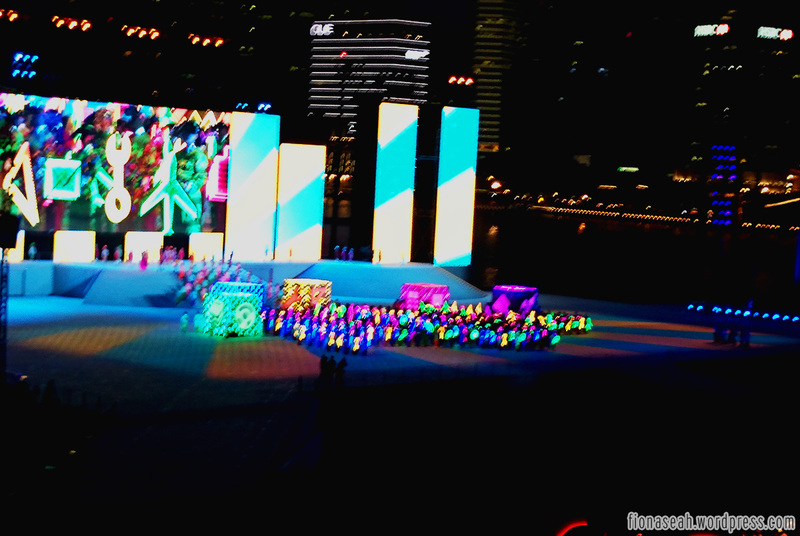 They had a very big field shared with Mattar Primary and Aljunied Primary. With 3 schools in close proximity vying for students in the fast-maturing estate, it’s no wonder none of them lived til this day. Ex-students of Mattar Primary School (merged with Mattar East) said that the school was later absorbed by MacPherson Primary but this absorption is not stated anywhere on the latter’s history. Rumour has it that the school was built to accommodate the dragon babies born in 1964. 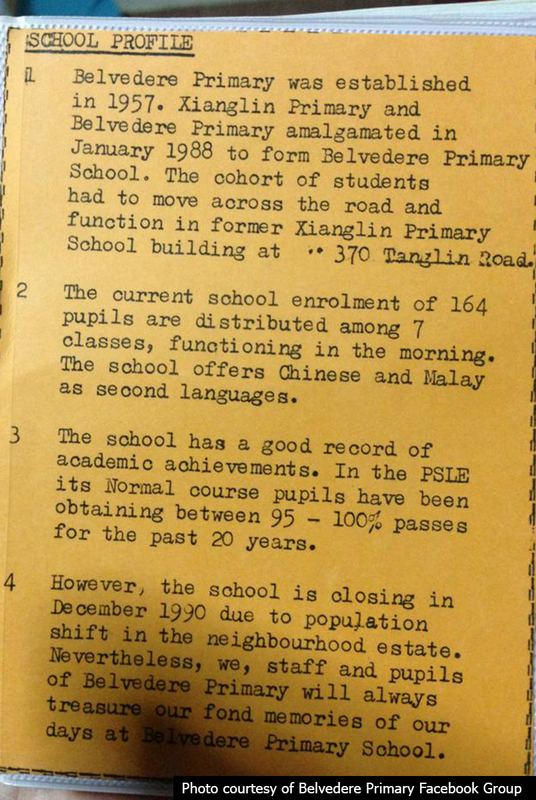 In other words, the school started in 1971 (officially opened in 1972) when most schools in Singapore were full. A relatively new school in that era, it had “no past successes to look back upon” as I quote the then-parliament secretary to the minister for education. 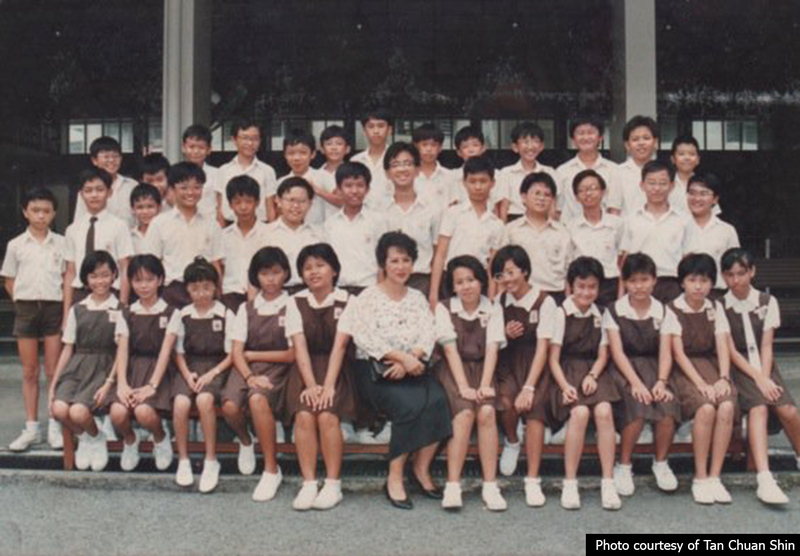 26 years went by and the school didn’t seem to gain any recognition but it did churn out a few well-known figures such as local actress Jacelyn Tay (郑秀珍), who was a vice-head prefect of the school. 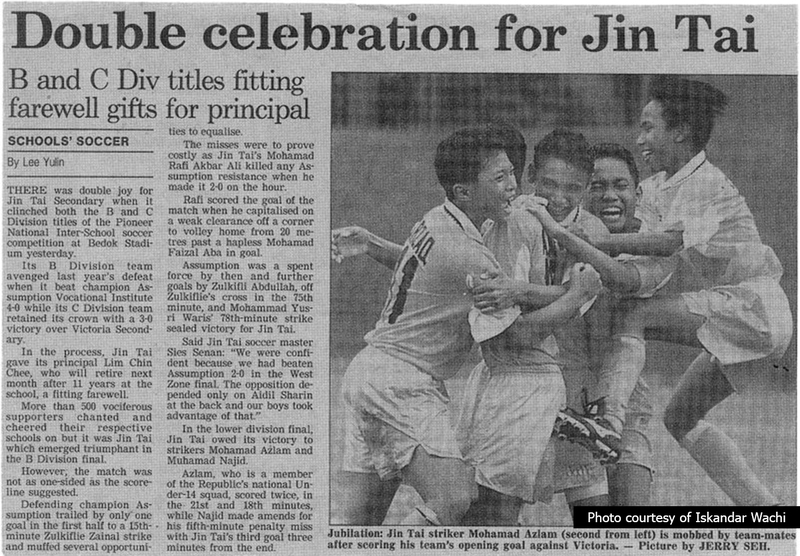 It was absorbed by MacPherson Primary (currently at Aljunied Primary’s site) upon its closure. 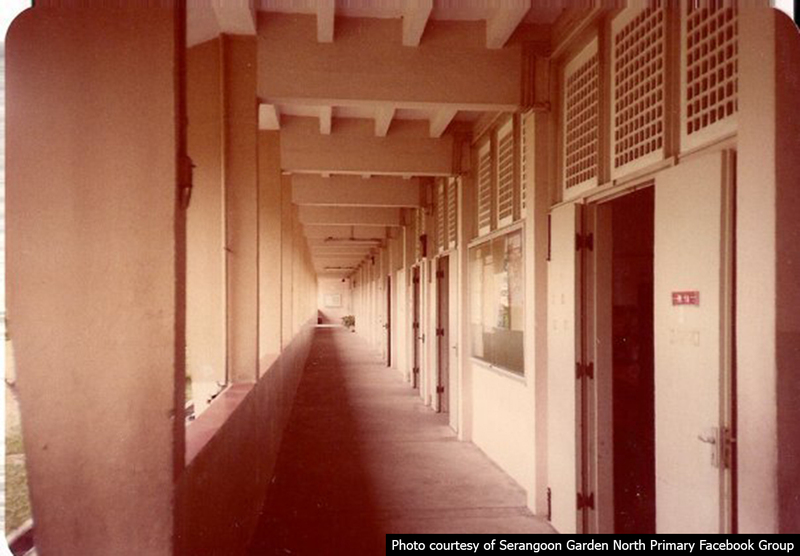 Chong Shan started functioning in 1982 and was in fact the 180th school built by the Singapore government. 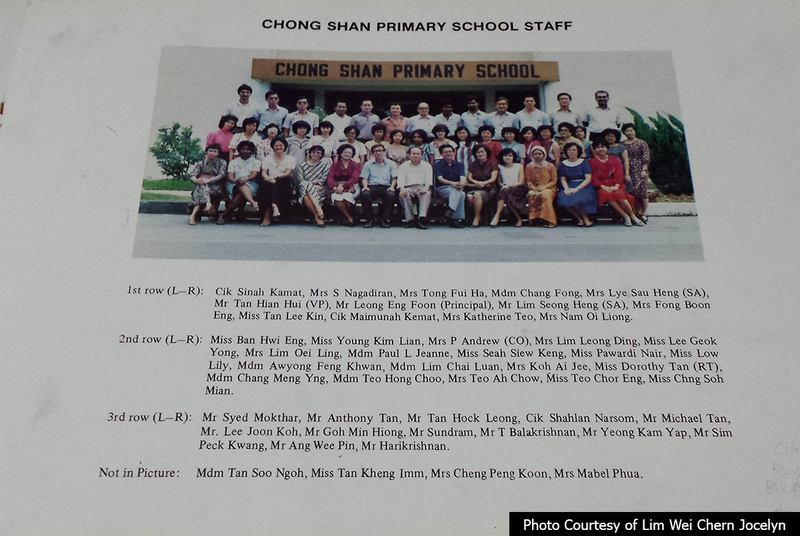 It had a joint official opening with Chong De Primary in 1984. 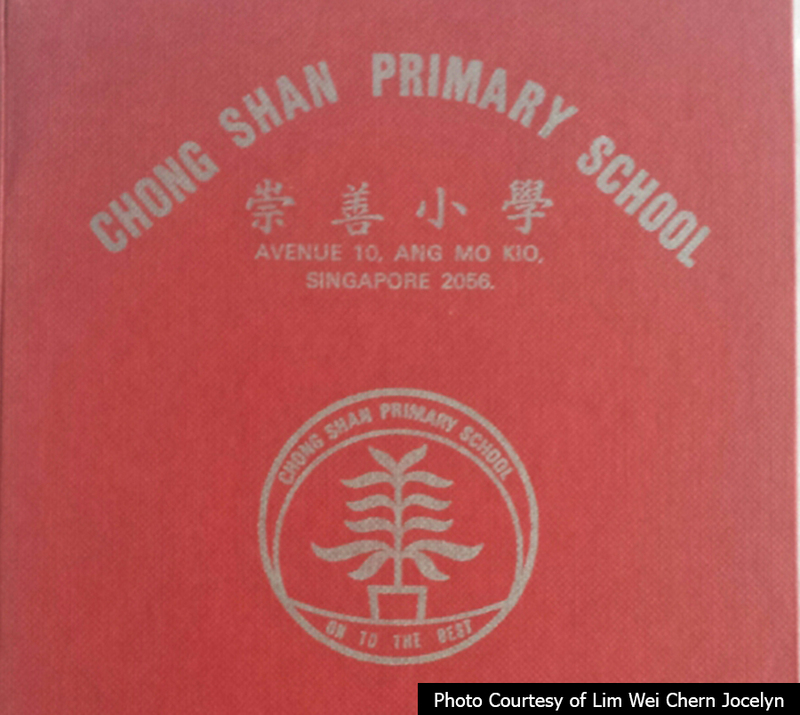 Chong De Primary’s students were transferred to Chong Shan when it closed in 1998. 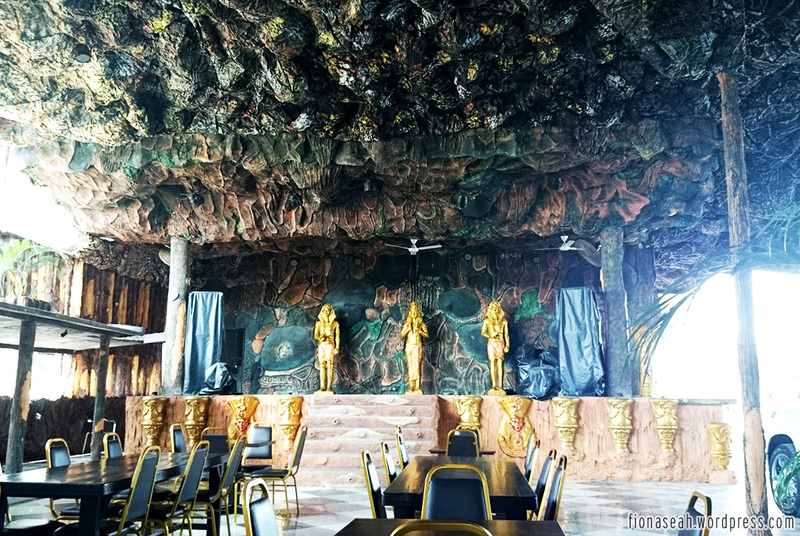 More details about Chong De can be found in part 2. 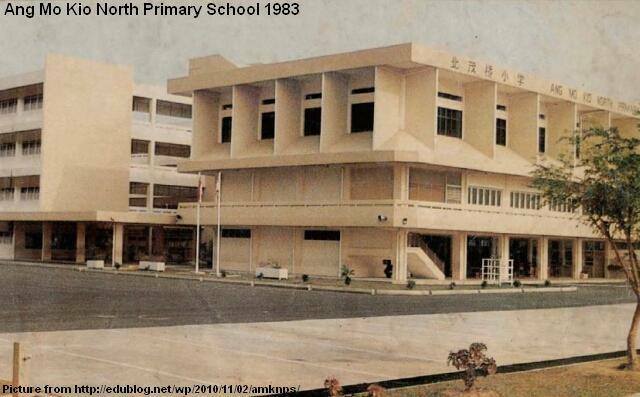 Ang Mo Kio North was established in 1981 and Hong Dao Primary in 1982. 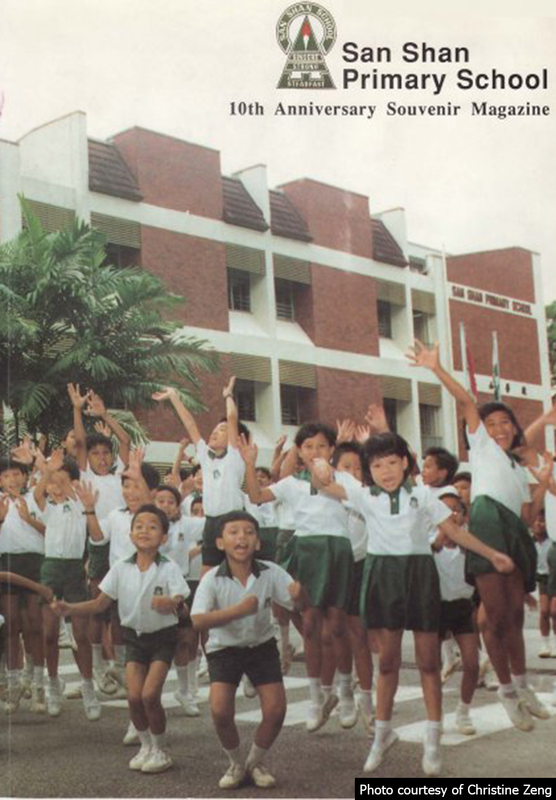 Li Hua Primary had a longer history as it originated as a rural school in the fifties, formerly known as Lee Hua Chinese School at Yio Chu Kang Road. Students used to wear all-white before the attire changed to white and blue. 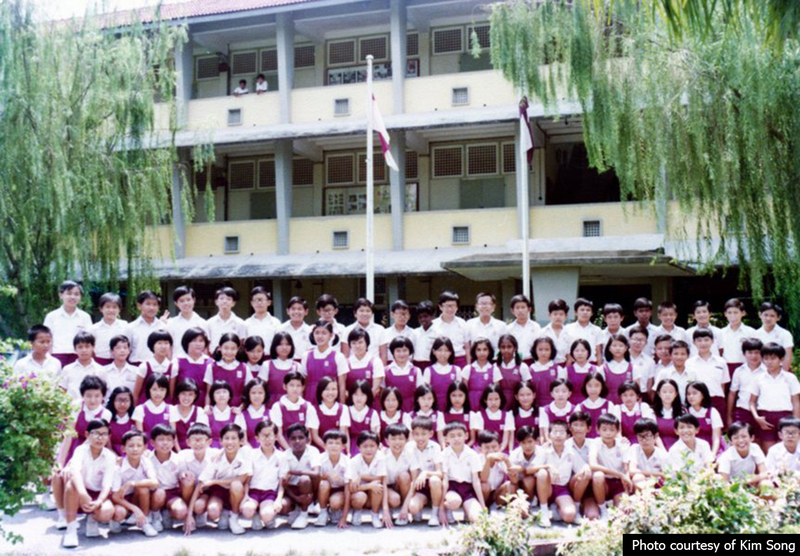 Ang Mo Kio North and Li Hua primary schools shared a field with Presbyterian High School before it moved to a bigger space. 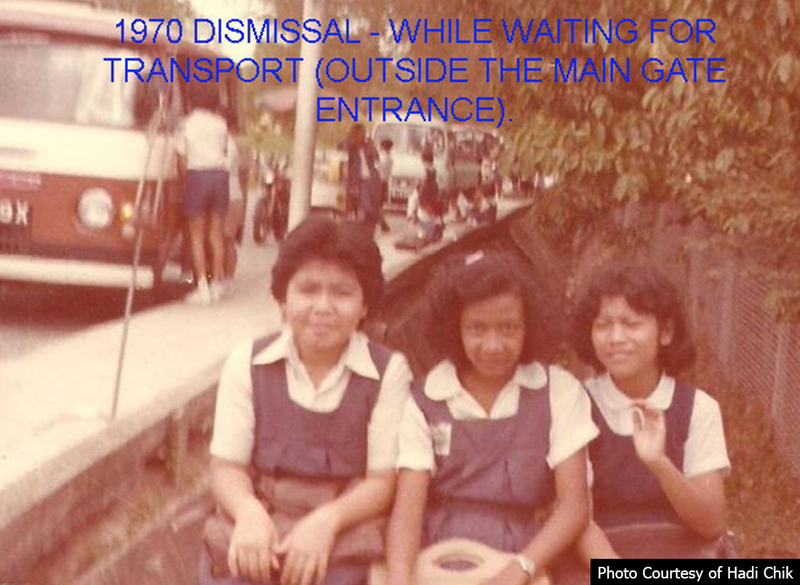 The school overlooked the forest reserve by Casuarina Road and students wore white blouse/shirt and brown skirt/shorts. 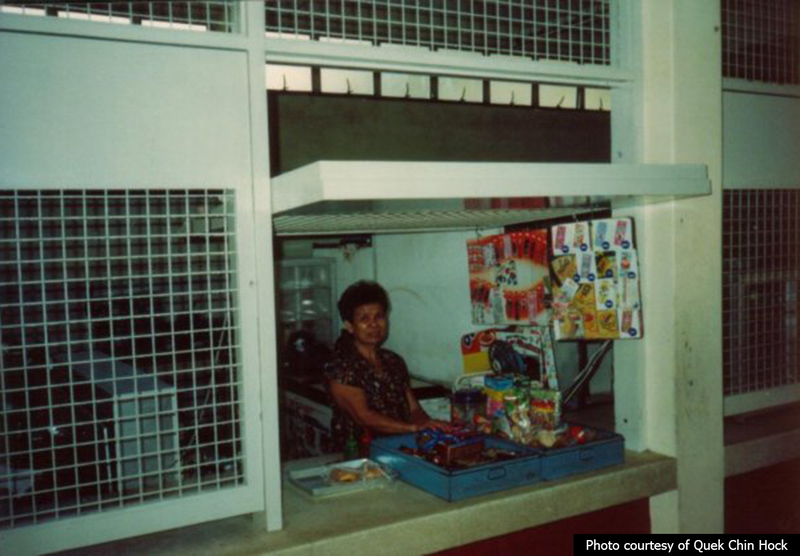 Many ex-students recalled having a prata stall (now known as Casuarina Curry Restaurant) conveniently across the street. 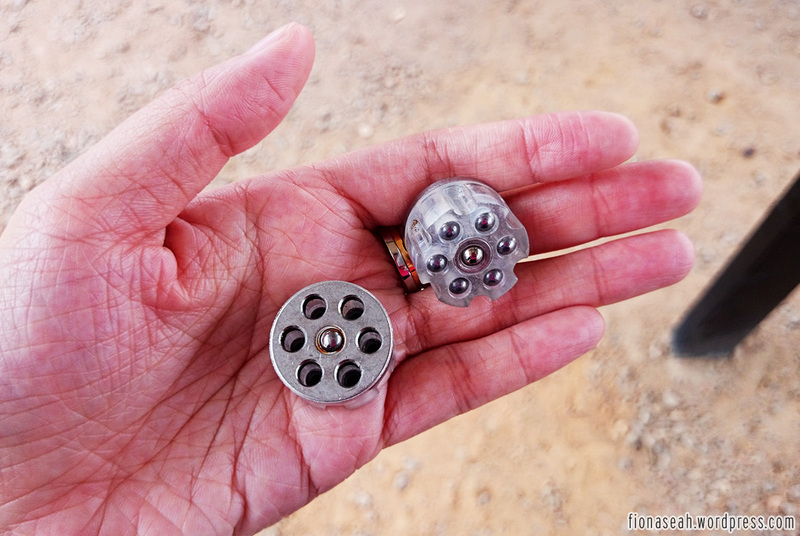 It garnered media attention in 1968 during the Gene Koh murder trial as the mentioned’s decaying body was found by one of the school’s stallholders when he went to relieve himself in the forest at night. 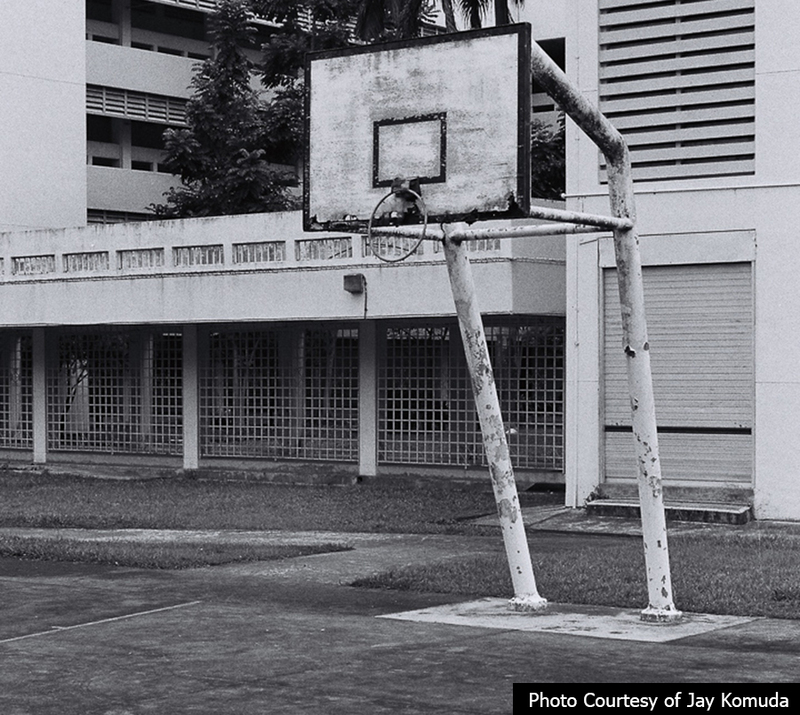 In 1992, the school was closed to make way for private housing development. Seraya Primary and Fowlie School were like sister schools to each other for they shared the same field back then before both schools were merged to form Fowlie Primary. Both schools were also opposite each other and very often, students from Seraya would go over to Fowlie’s canteen to eat. 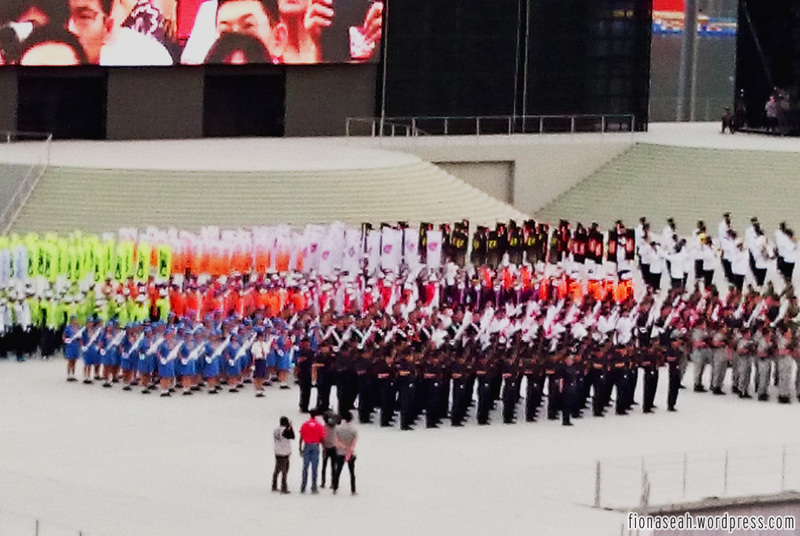 Other schools in the vicinity were St Hilda’s, Tong Cai, Haig Boys’ and Girls’ School. 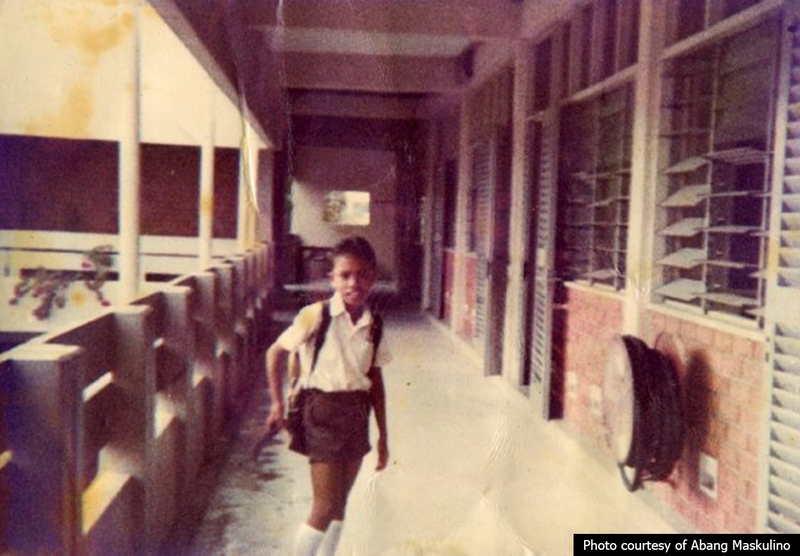 For a brief history of Fowlie, refer to Seraya Primary. Unfortunately I’m unable to obtain any details of Mountbatten Primary but if you’re an ex-student, you may consider joining this members-only Facebook group here. Please feel free to provide me with the history of Mountbatten Primary if you’re familiar with the school. Haig Boys’, on the other hand, isn’t as mysterious as its other counterparts. Founded in 1951, it was named after Field Marshal Sir Douglas Haig, British Commander-in-Chief during the Battle of the Somme. 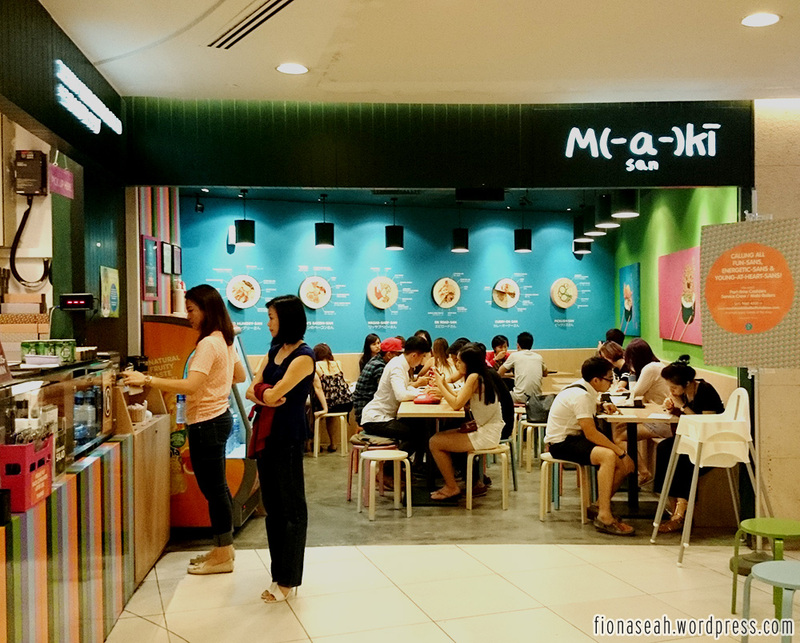 Its original location was at Haig Road in Katong but was later relocated to Mountbatten Road. 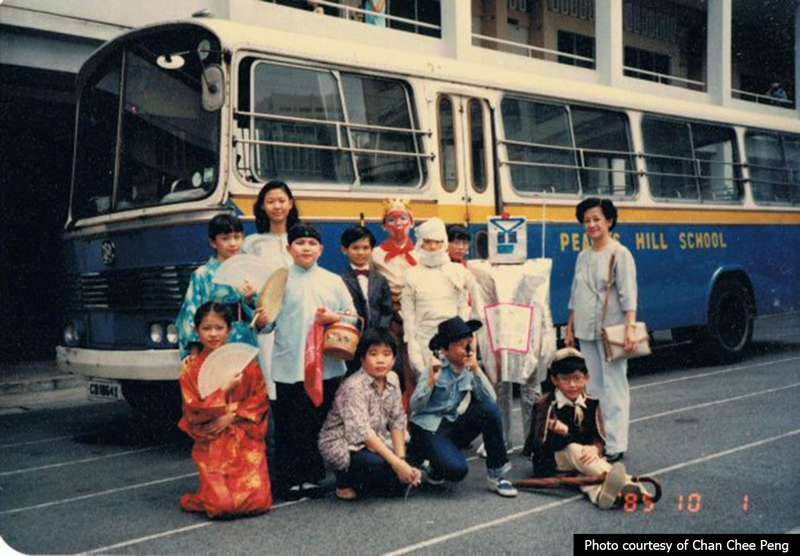 Today, Tanjong Katong Primary is a popular school with the expatriate community in Singapore with about 40% of its students coming from 30 over countries. Some parents even started queuing as early as 3 days before the opening of Phase 3 registration to vie for a spot in the school. Judging from its popularity, this school is definitely going to be around for a long time and this is certainly good news to Fowlie’s alumni, whose alma mater had merged twice in its history. 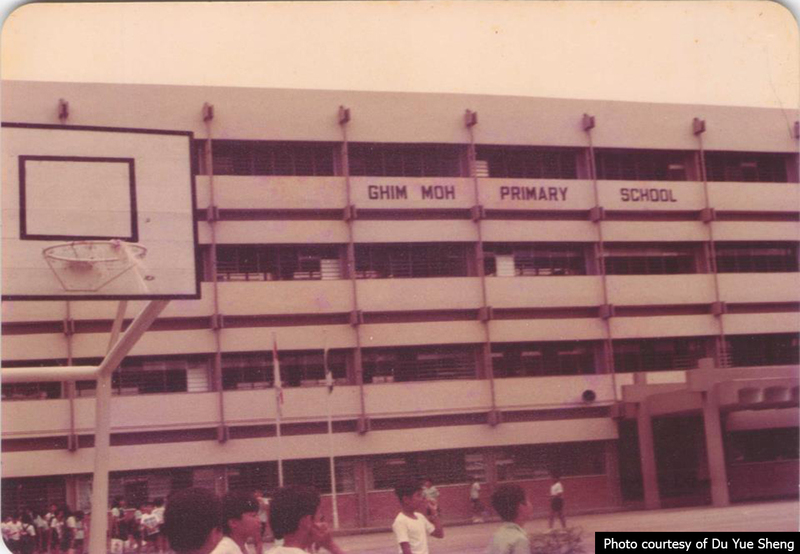 Known to be located behind Singapore Badminton Hall, its remaining students were taken in by Guillemard Primary (previously known as Guillemard Road English School but merged with Guillemard West Primary in 1984) upon closure. 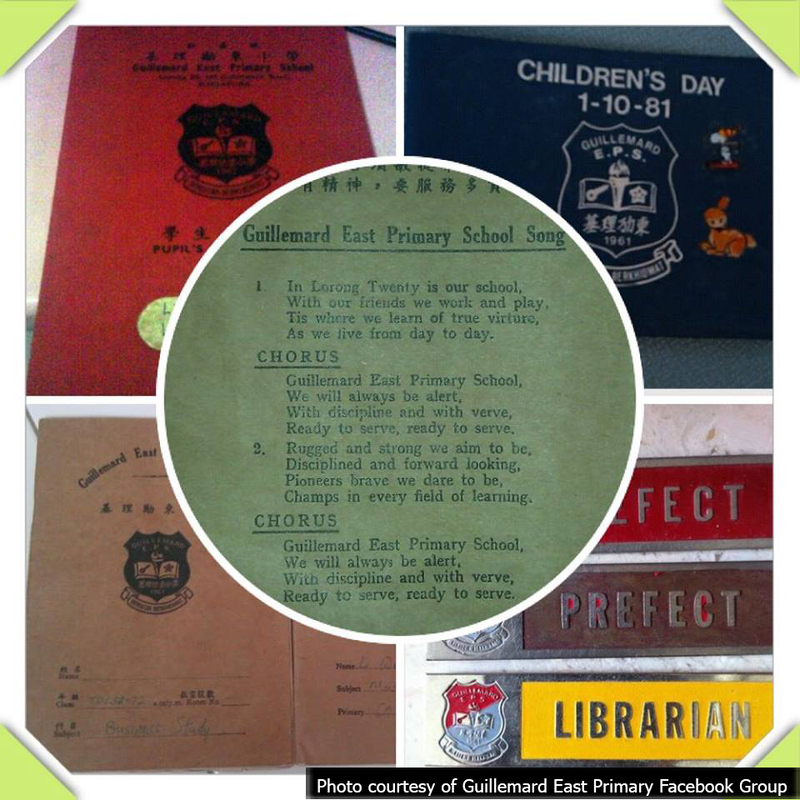 However, Guillemard Primary also suffered from the same fate some years later. 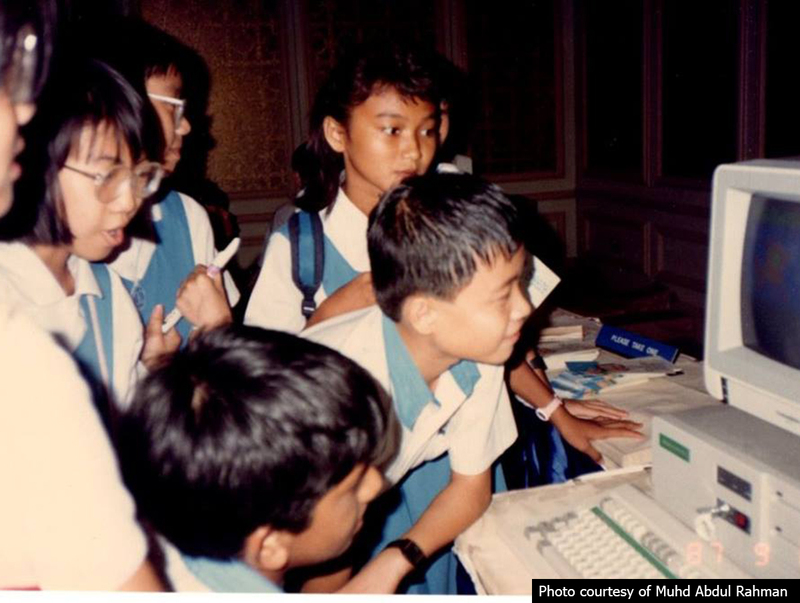 While we’re at it, allow me to also give a special mention to affiliated schools like Kallang Primary (previously known as Kallang Integrated Primary School, closed in 1987) and Guillemard West Primary in the region. Sadly, none of these schools exists today. 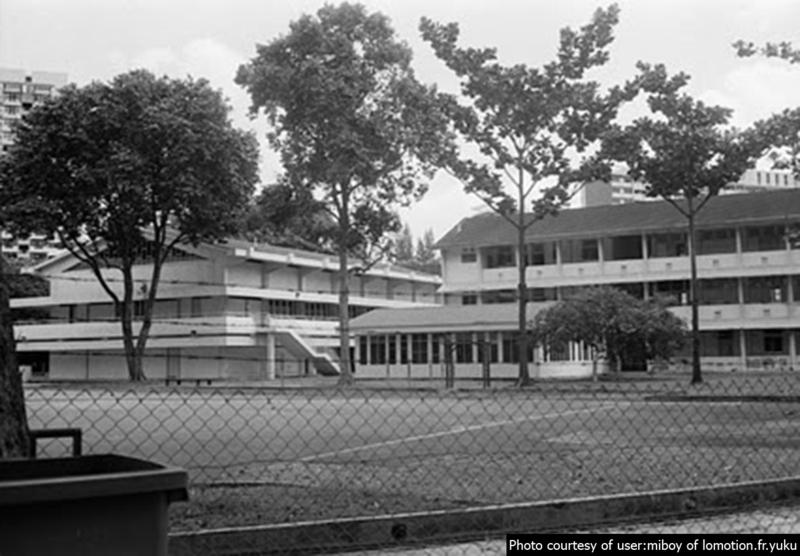 Bedok Girls’ and Bedok Boys’ were built in 1952 and located along Bedok Road in the middle of a ridge. Each of them is a single-storey building with 14 classrooms. They shared a field and a canteen which was on top a flight of stairs. Students who attended both schools live in villages in that area. 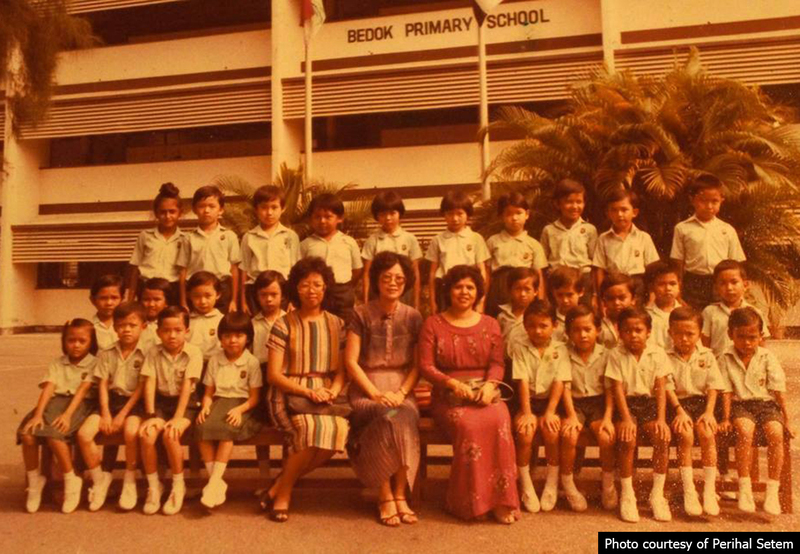 Bedok Primary, on the other hand, was founded in the early 1960s. However due to its falling enrolment, all 3 schools mentioned were merged to form a new co-ed school. 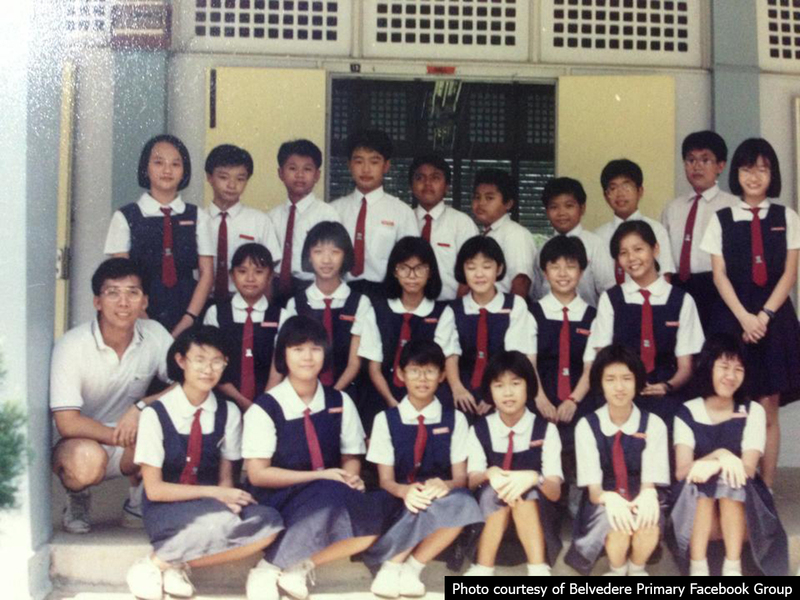 Bedok Primary has quite a number of famous alumni though, such as Vikram Nair (MP from PAP) and Clarence Lee, a renowned professional make-up artist, just to name a few. 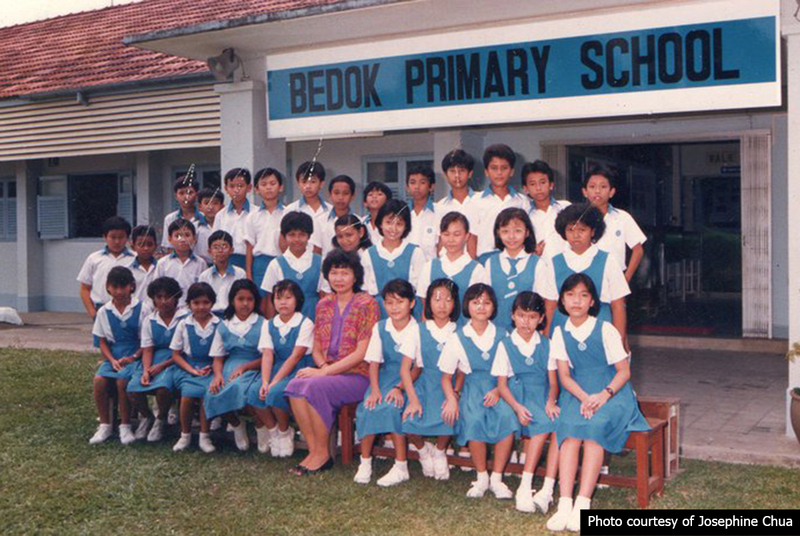 The new Bedok Primary closed in 1998 and students were transferred to Bedok View Primary (which ceased operation and students moved over to Bedok South, which became Bedok Green in the end). 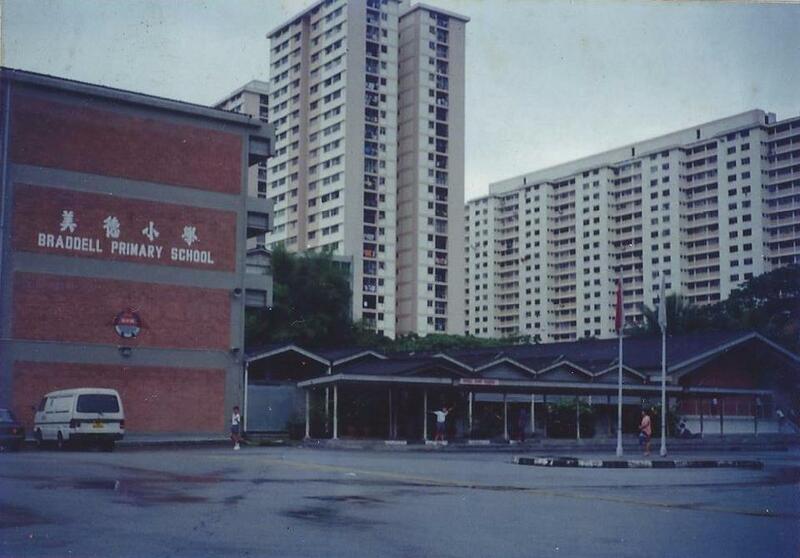 In 2003, Bedok South Secondary School took over its former site. 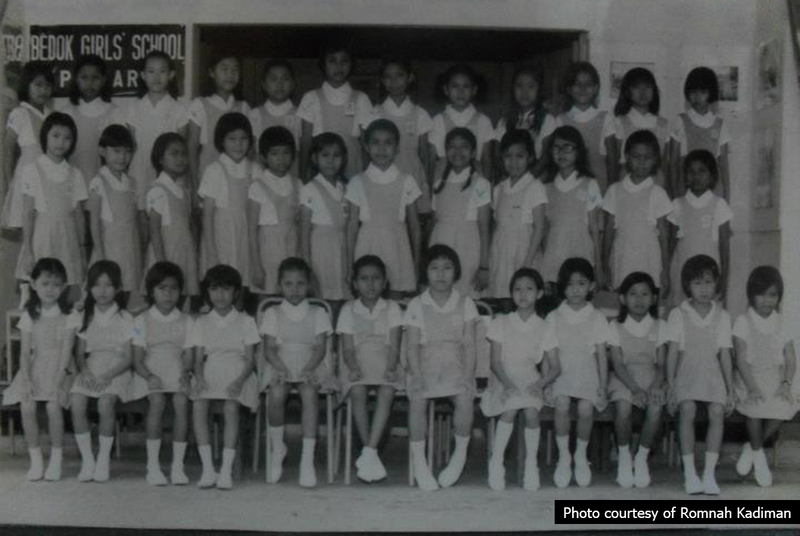 Braddell Primary started in 1976 and was also used by Mensa for its initial admission test sessions. 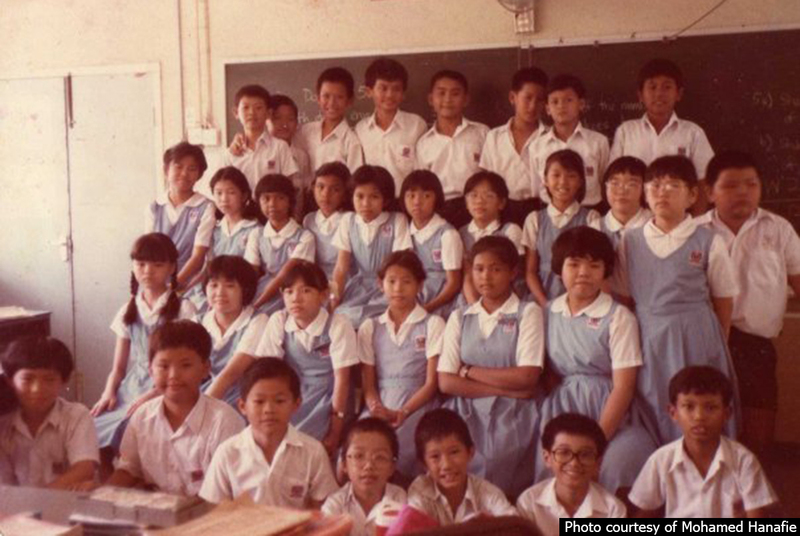 It gained media attention when one of its student, seven-year-old Wong Chong Kum, was kidnapped by a man and a woman in January 1985 at the school (see source 4-6) who sought a random of S$30,000. All principals had to undergo an anti-kidnap briefing because of this. 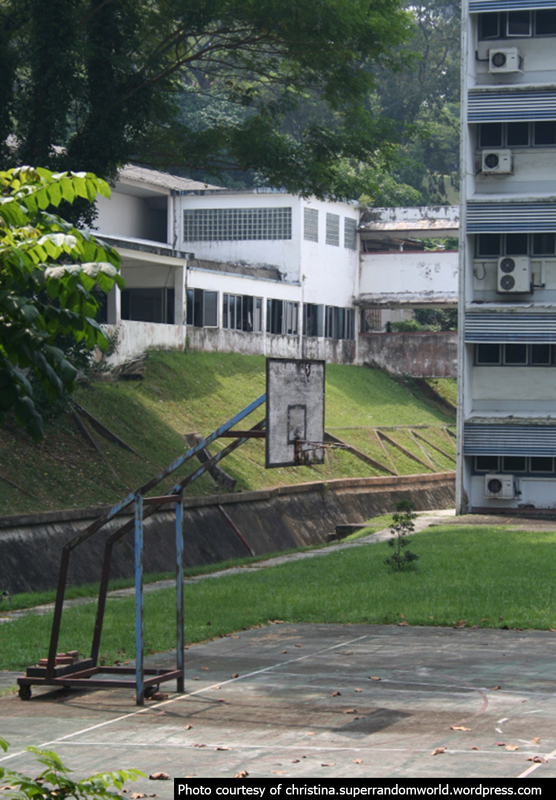 The school building was demolished in 2011, about 9 years after the merge for Marymount Centre, which shifted from Thomson Road due to the construction of the North-South Expressway. 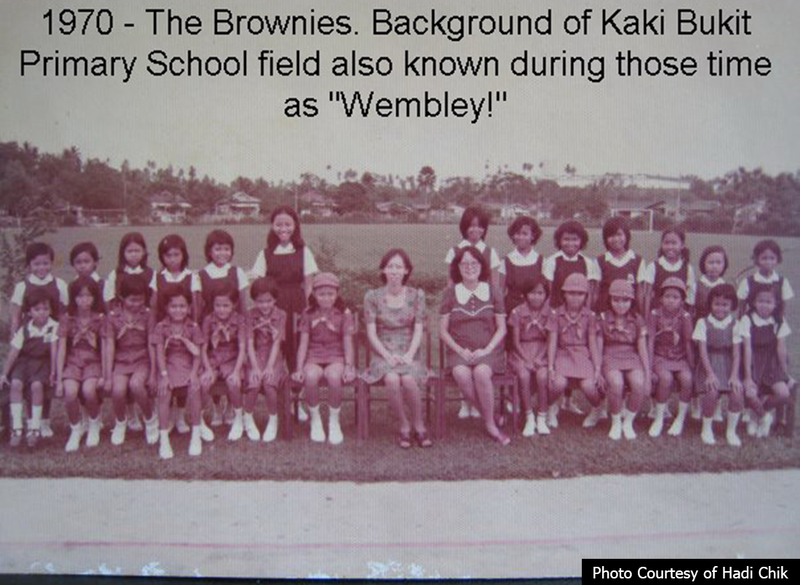 Westlake Primary had its first batch in 1977 and used to be surrounded by 2 neighbouring schools – Westlake Secondary and Braddell Secondary (read below). 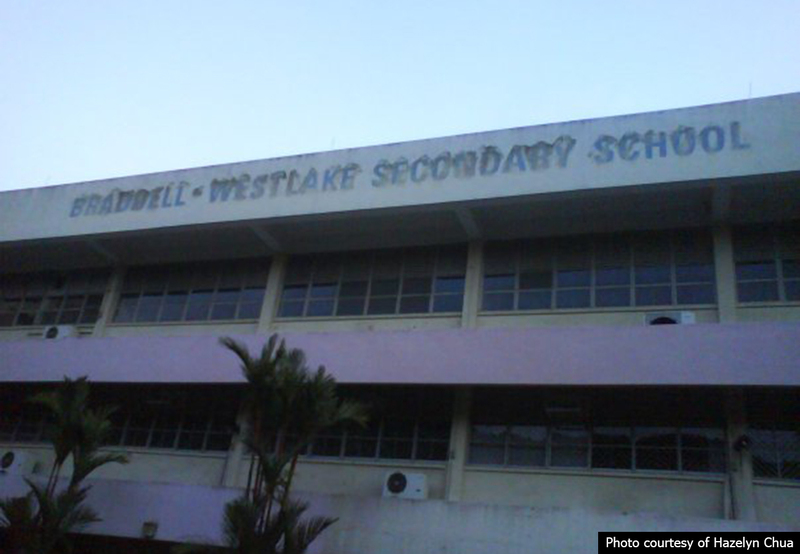 The premises of Westlake Primary and Secondary were used to film the 2002 movie “I Not Stupid”. 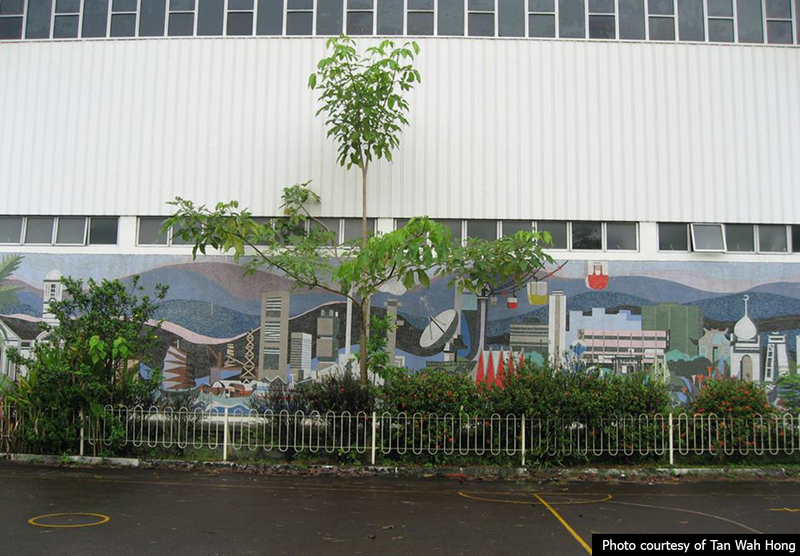 There is also a mosaic mural in Westlake Primary that depicts the Singapore of the mid-1970s and the early 1980s (see picture below) and it’s probably still there. 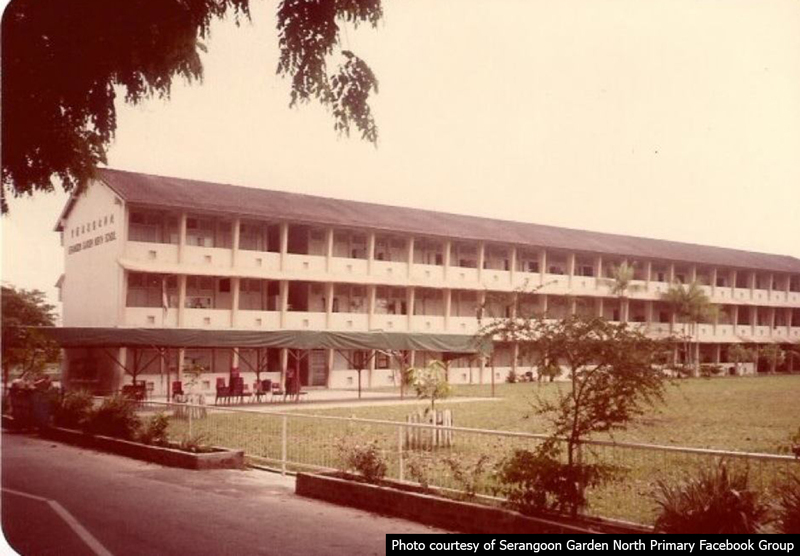 San Shan School, established in 1929, used to be a Chinese-medium school at Sophia Road but was relocated to Toa Payoh and renamed to San Shan Primary in 1982. 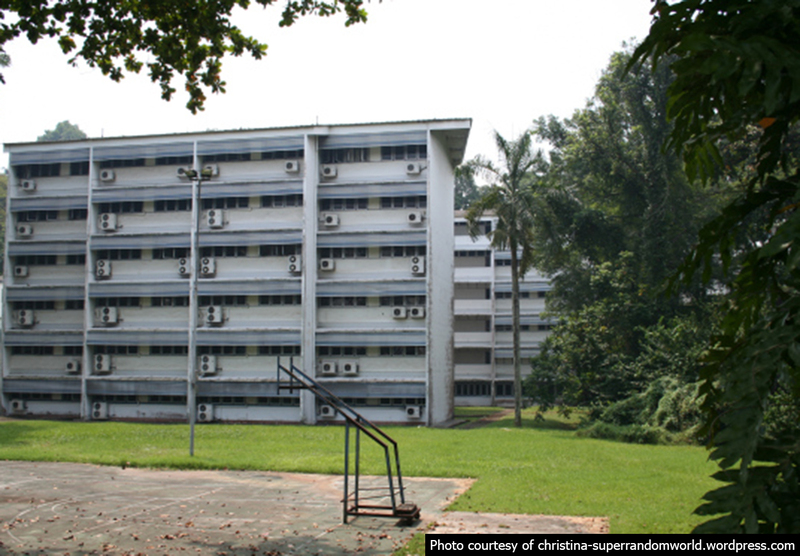 The old building, still around today, used to be a holding site for Methodist Girls’ School for a short period and one of NAFA’s campuses. 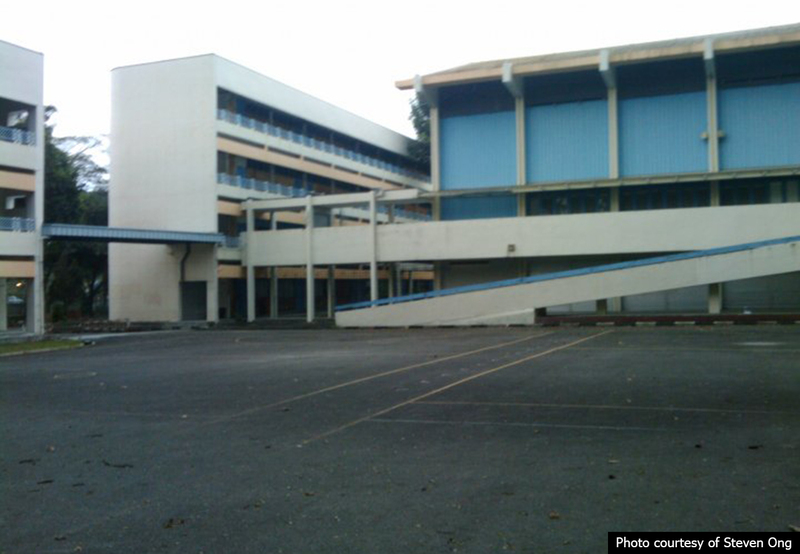 The new school building at Toa Payoh had already been torn down for Beatty Secondary. 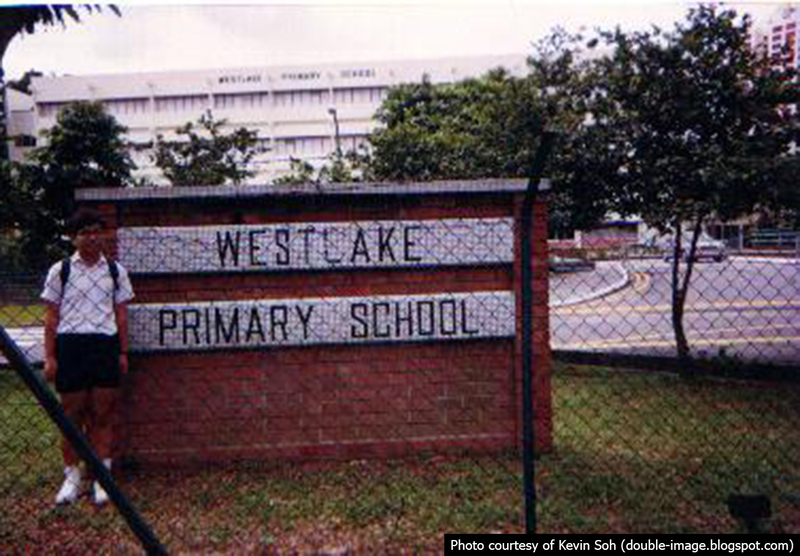 Braddell and Westlake Secondary were founded in 1981 and 1978 respectively. In order to boost falling enrolment, both schools were merged but their premises were retained and utilised, thus making them known for being one of the few secondary schools to occupy two separate campuses. Its enrolment continued to decline, leading to its official closure in 2005 and remaining students and staff were transferred to Guangyang Secondary School. 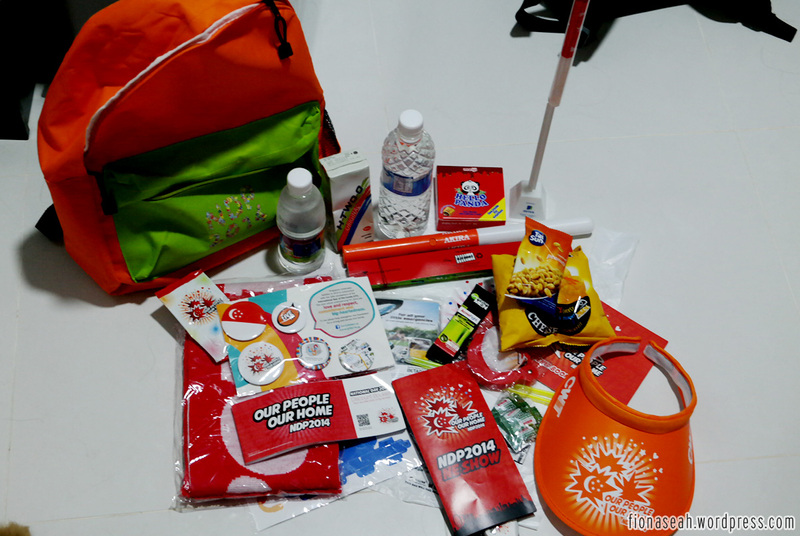 Since 2012, the area has been earmarked for the shift of Raffles Girls’ Secondary. To combine two schools that were quite distant from each other.. this was certainly a very unusual merge. 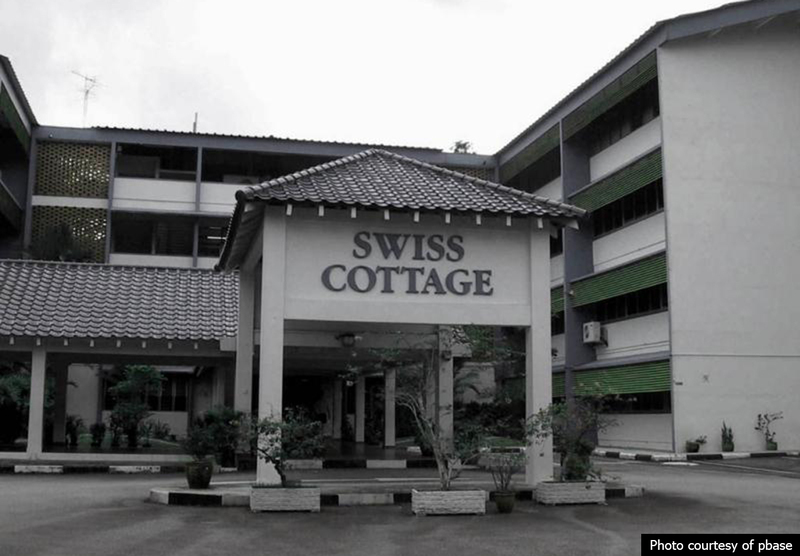 If you ask me, it seemed like an attempt to rid the less-popular Swiss Cottage from the plot of land populated by famous schools such as SCGS, Raffles Girls’ Primary and ACS Primary.. but of course, that’s just my opinion. MOE has a reason for everything they do, right? Swiss Cottage Primary was, no doubt, a school which lacked publicity. Before my “research” for the purpose of this entry, I had never heard of this school despite its presence since the 1960s. Swiss Cottage SECONDARY yes, but not the primary version of it (which could be because Bukit Batok was my place of residence for 23 years and everyone there knows that Swiss Cottage Sec is the best secondary school in the neighbourhood). 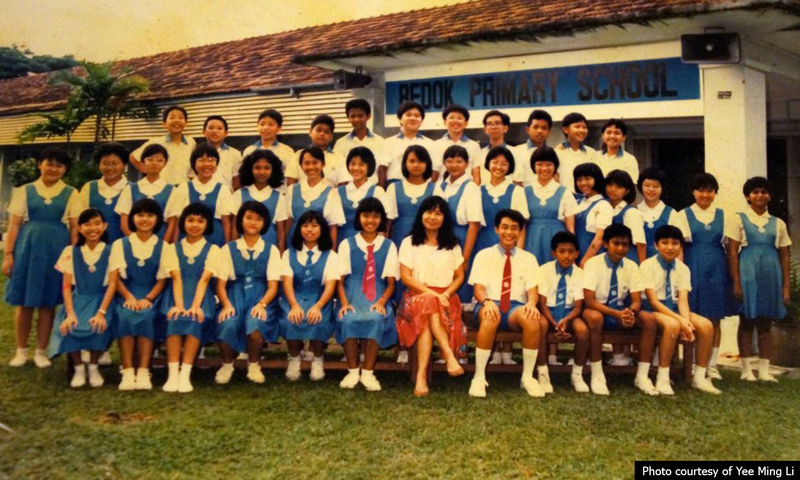 The school’s last enrolment was 710, paling in comparison with Moulmein Primary’s 1030 in 2001, which was one of the factors that led to the cessation of the school in name. 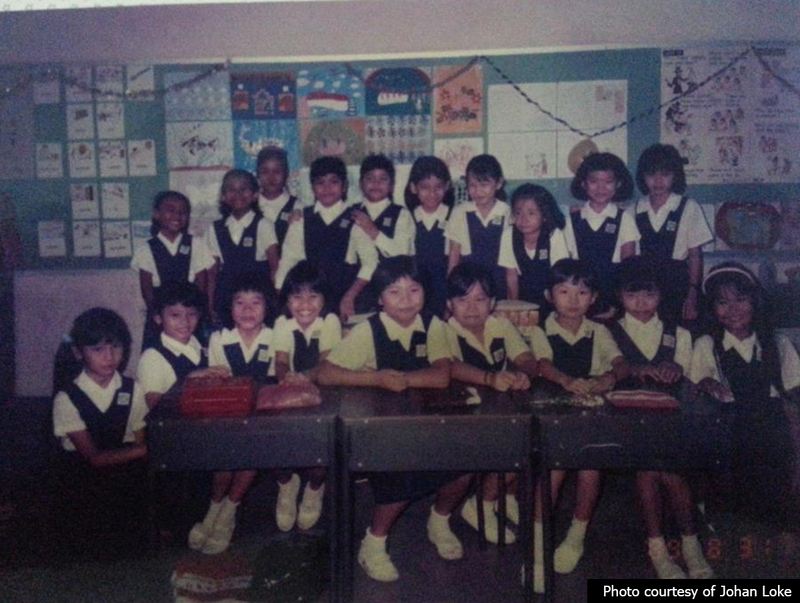 I knew about Moulmein Primary though, thanks to the TV drama “Moulmein High” on Channel 5 in the early 2000s. 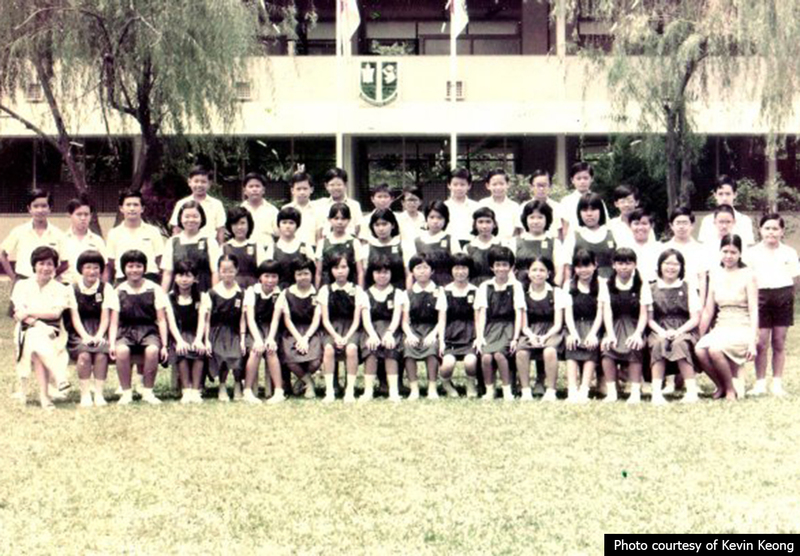 Trivia aside, Moulmein Primary was formed by the merger of Griffiths School when it first closed (Now Griffiths Primary School) and Balestier Girls’ School in 1983. Subsequently, it also absorbed Kim Keat Primary. 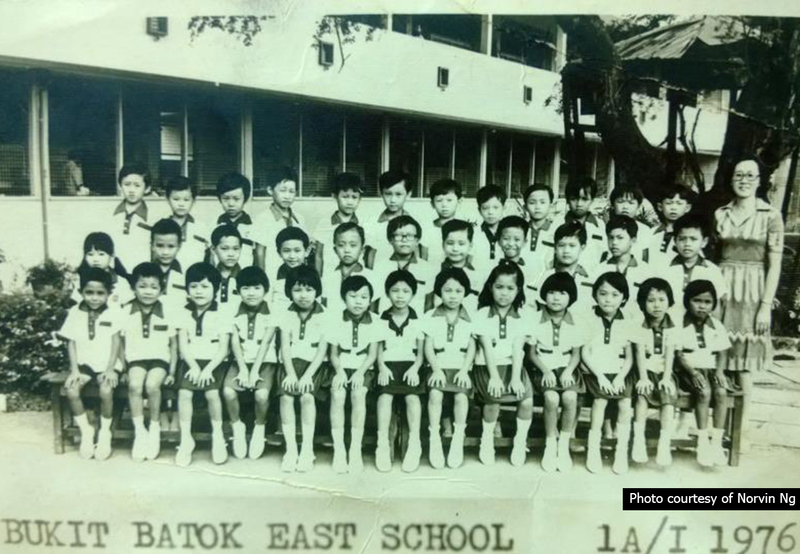 Bukit Batok East was probably founded in 1955 (reference from some MOE correspondence sheet with restricted access) but I’m clueless about the history of Bukit Batok West (not very popular I guess) except for the fact that the land is now occupied by German European School. 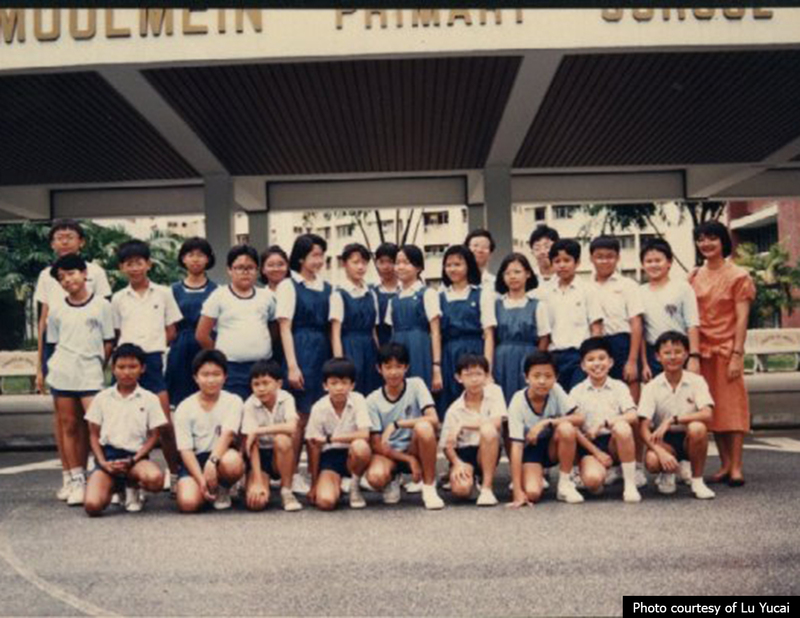 Clementi North Primary and Clementi Town Primary were established in 1980. 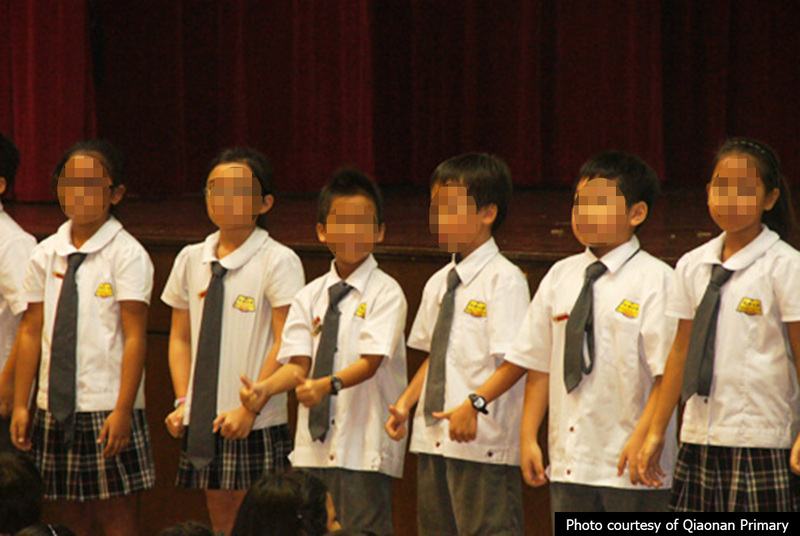 Probably due to competition from neighbouring schools such as Nan Hua Primary and Pei Tong Primary, they saw their enrolment dwindling and were eventually made to merge. 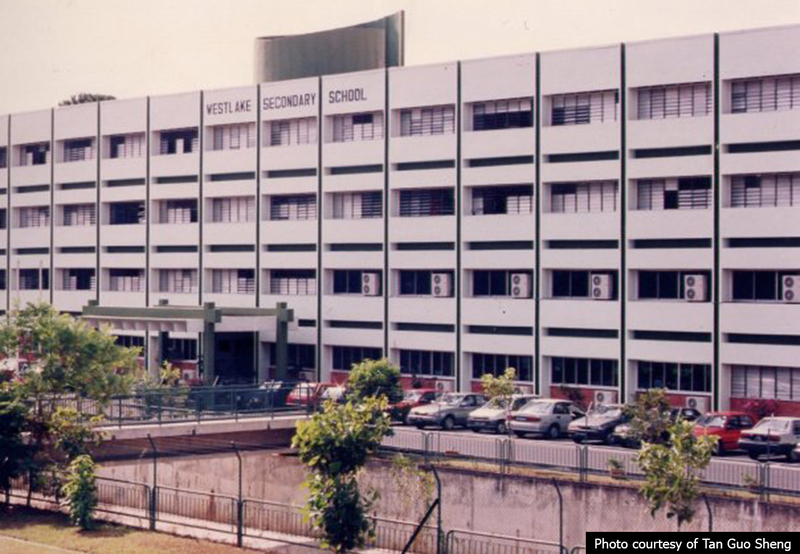 To accommodate the expansion from the merge, a new school building was built on the former site of Clementi Town Primary School. 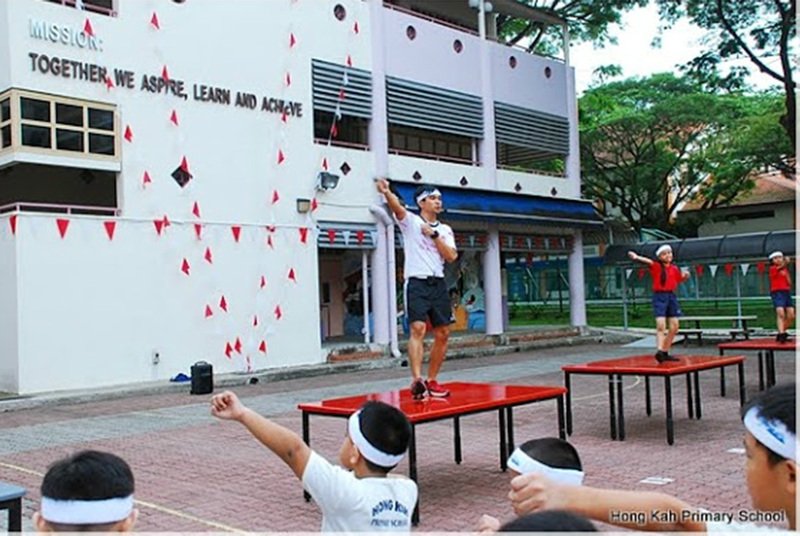 While the construction took place, students from both schools occupied Clementi North Primary premises. The school was founded in 1977 and used to be at Queenstown area. 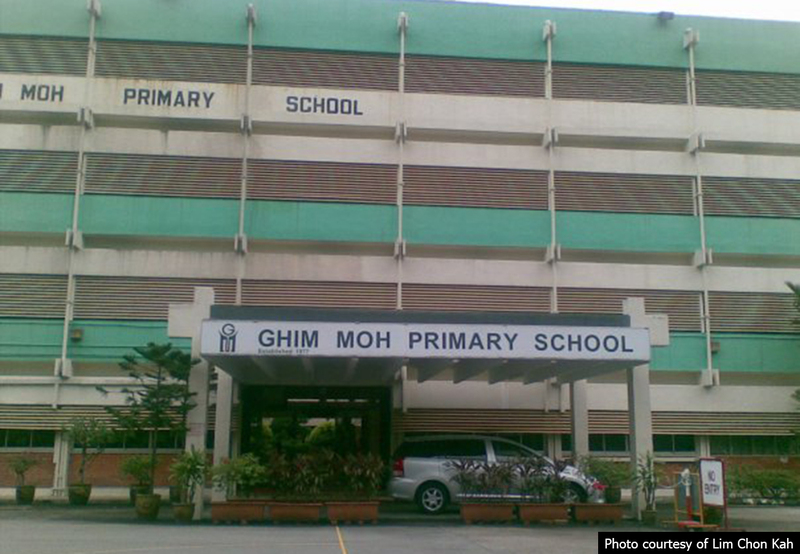 The site of Ghim Moh Primary has now been converted to Singapore Chinese Language Centre. 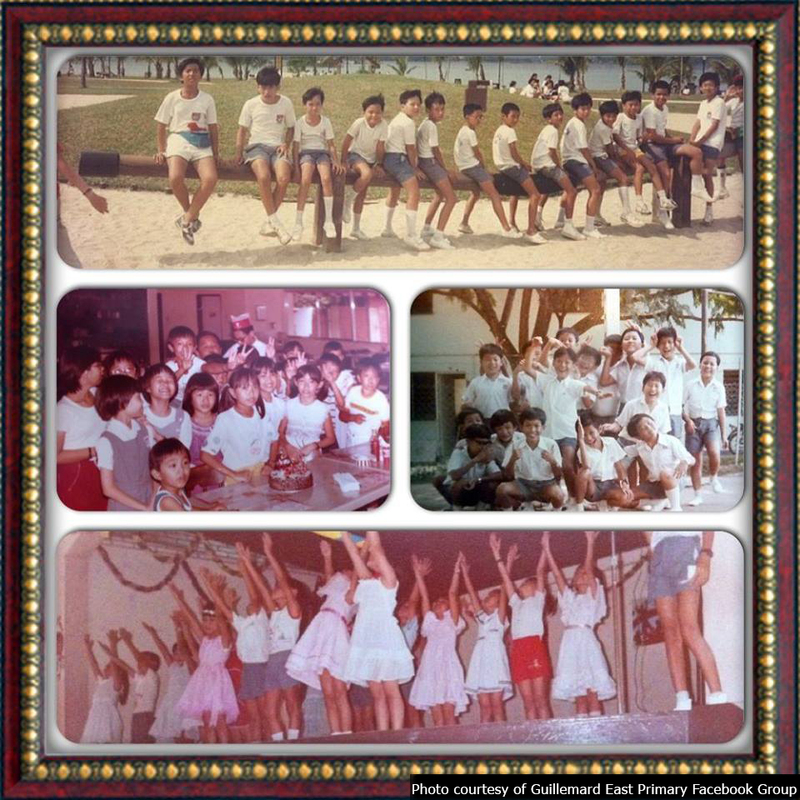 Jin Tai Secondary was established in 1982 and judging from the pictures posted by ex-student on the Facebook group, I can say that the school was adept at sports especially soccer. 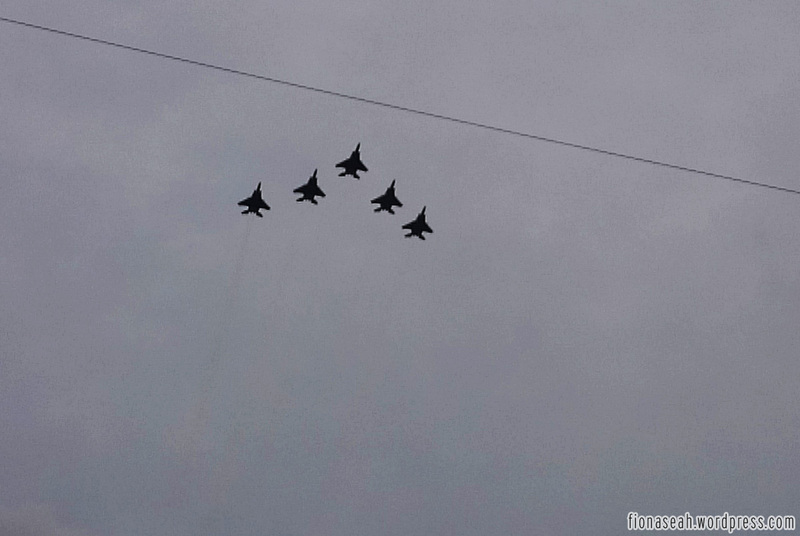 Unfortunately, it wasn’t widely known for its achievements but instead for an infamous incident in 1999 where a mock attack was staged as part of a Total Defence Day exercise. 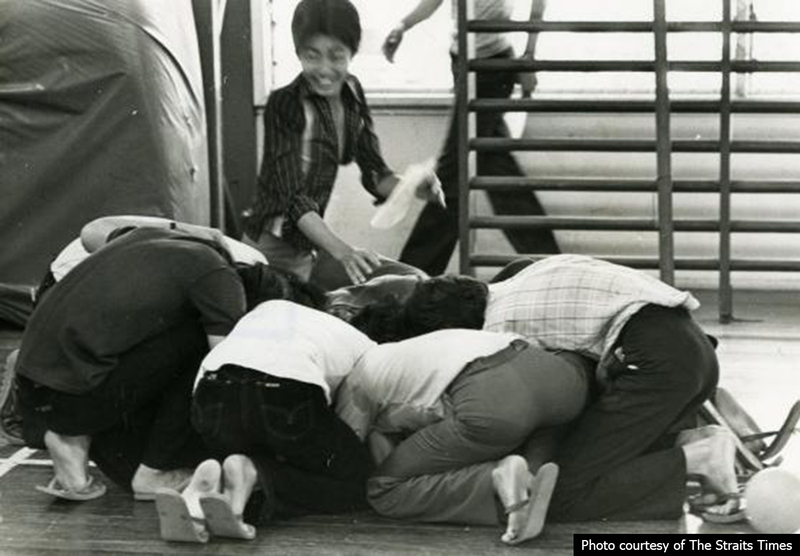 The mock attack, conducted by eight student-officers aged between 16 and 18 in the National Cadet Corps (NCC) to simulate the Japanese Occupation of Singapore and teach students the importance of psychological defence, turned real and fourteen students had to be treated for injuries with 3 warded (source 4). 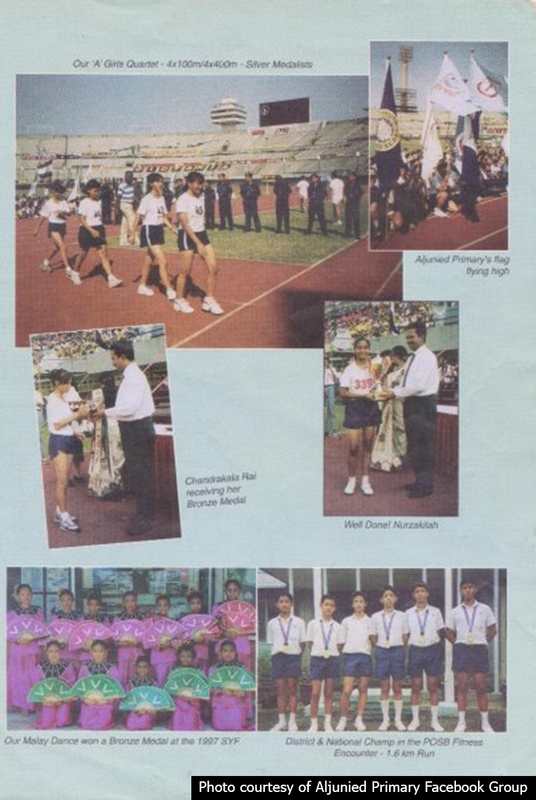 Jin Tai was officially opened 1984 and like Jin Tai Secondary, it appeared on the news many times for its outstanding achievement in sports. However both remarkable schools bearing the same name are no longer existent. 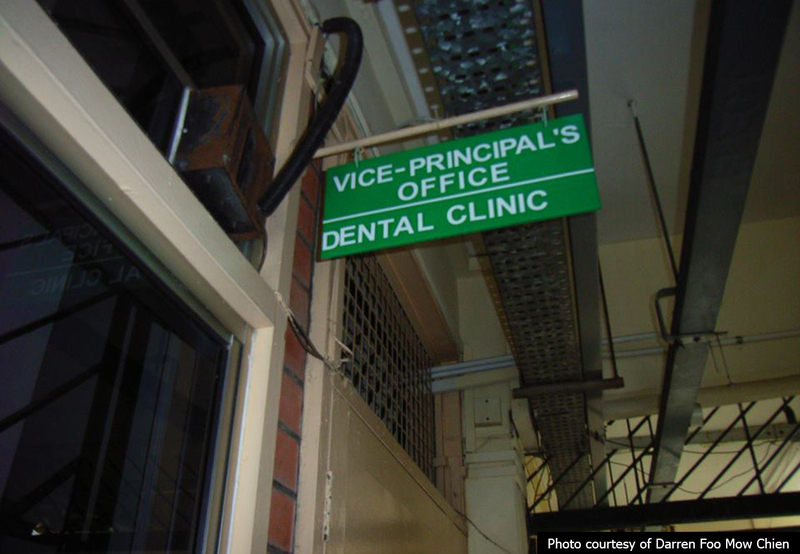 It was the second school absorbed by Qifa Primary – first was Jubilee Primary when it ceased operations in 1996. Jin Tai was also involved in the high profile 2004 murder case of eight-year-old Huang Na as the deceased was enrolled in that school. Sidetrack a bit, oh gosh.. if Huang Na is still alive, she’d be 18 today can you believe it!? 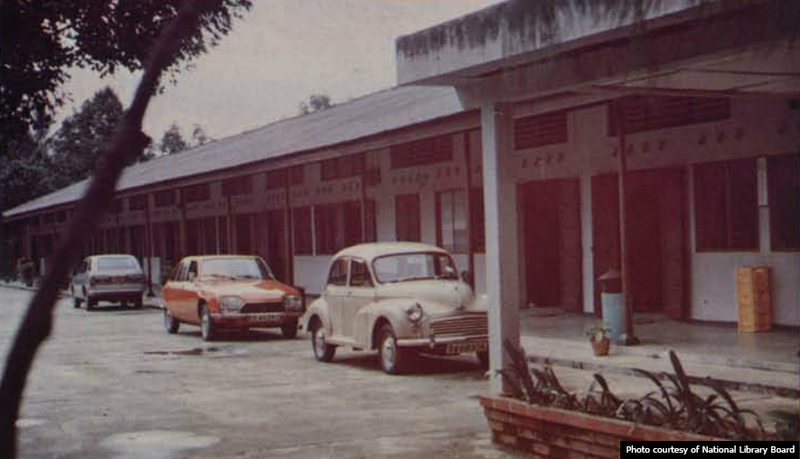 Yung An, Merlimau and Jurong Town started functioning in 1977, 1966, 1968 respectively. 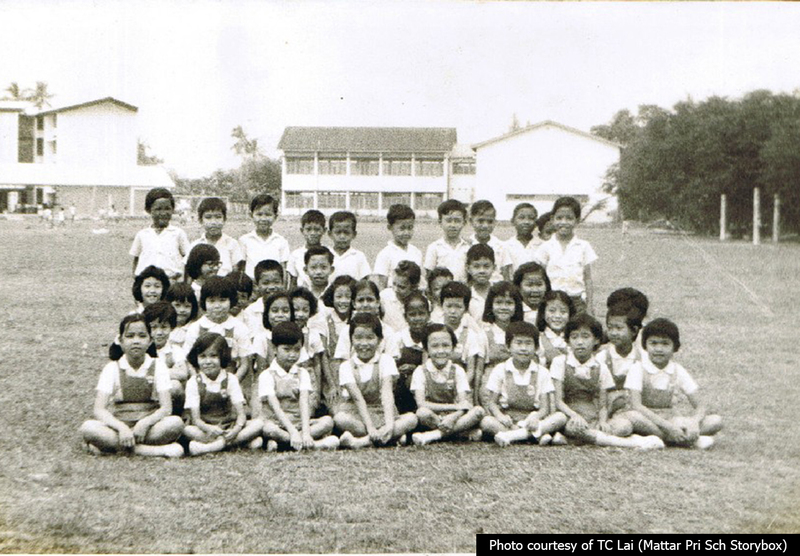 These were the first few schools in Taman Jurong for the early settlers in that estate. 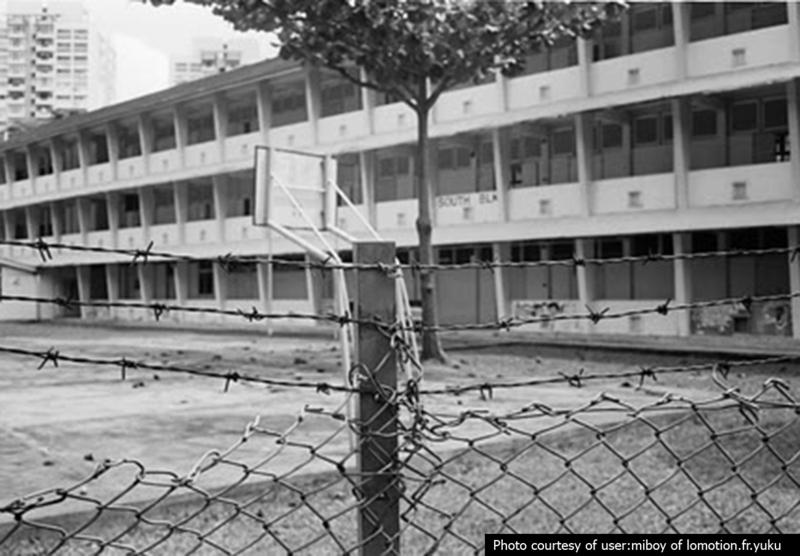 The first-mentioned was originally at Yuan Ching Road and before the school building was ready for occupation, students were housed in Boon Lay Garden Primary. 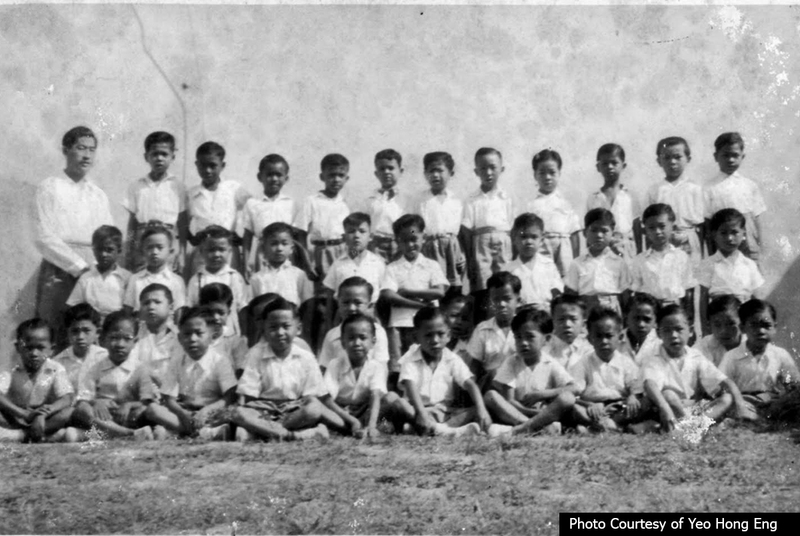 Merlimau was initially a Malay school named Pulau Merlimau Primary from Jurong Island. 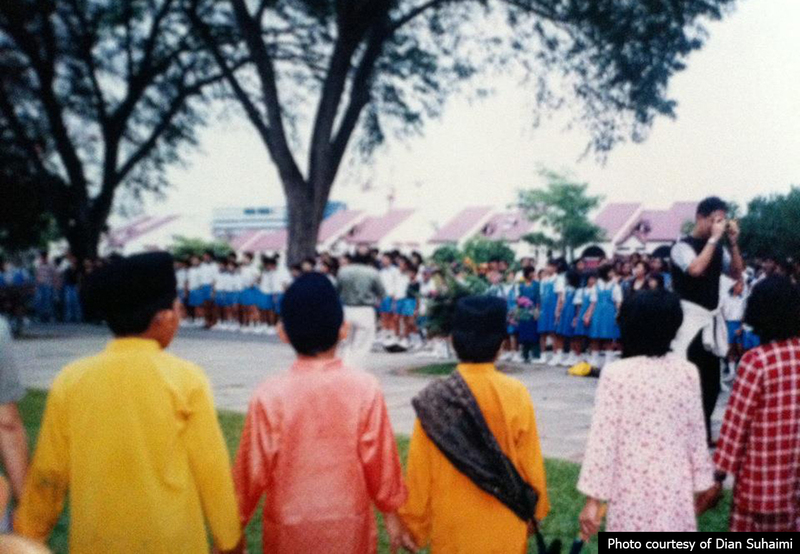 It was renamed to Merlimau Primary when it shifted to Taman Jurong and had an alumnus who was awarded the most coveted President’s scholarship in 1999. 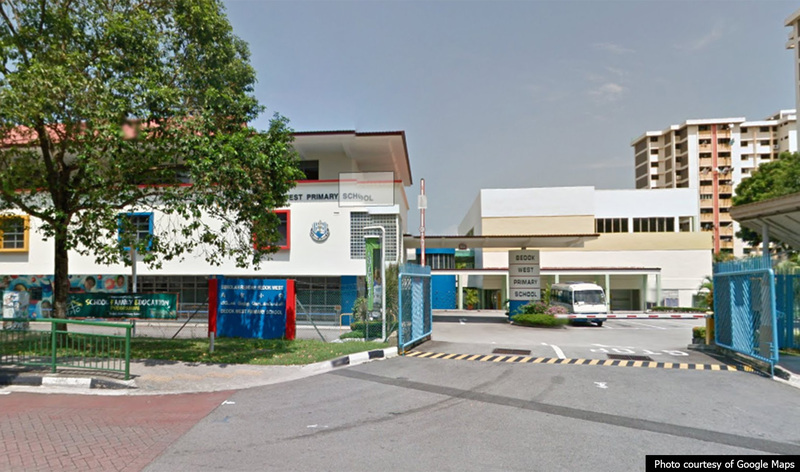 Before the merge, Yuan Ching Secondary, Yung An Primary and Merlimau Primary shared the same football field but now it has become Yuan Ching Secondary’s property… so are both neighbouring primary school buildings. 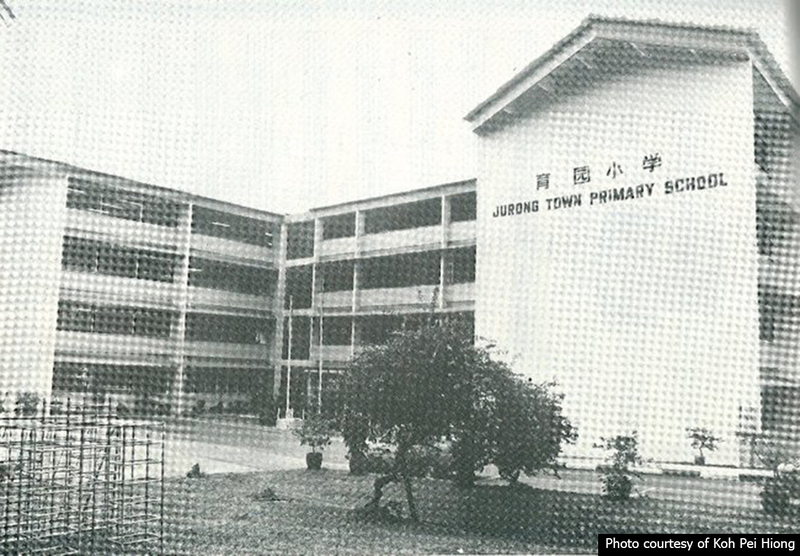 Jurong Town was a pretty popular school when it first started due to the lack of schools in the area. The demand was so great that they had to borrow classrooms from nearby secondary schools to accommodate the large number of students. However as more schools were built and completed, the demand waned. As of today, there are about 13 primary schools just in Boon Lay estate alone, some equipped with newer and better facilities. Thus it isn’t surprising to see the pioneering schools in Jurong losing out in competitive advantage. 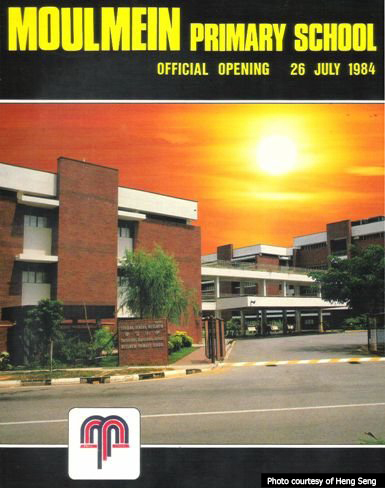 They were two of the “four original centralised institutes (CI) in Singapore and one of the pre-university centres in Singapore that offers a three-year curriculum leading to the Singapore Cambridge (UCLES) General Certificate of Education Advanced Level examination” (Wikipedia). 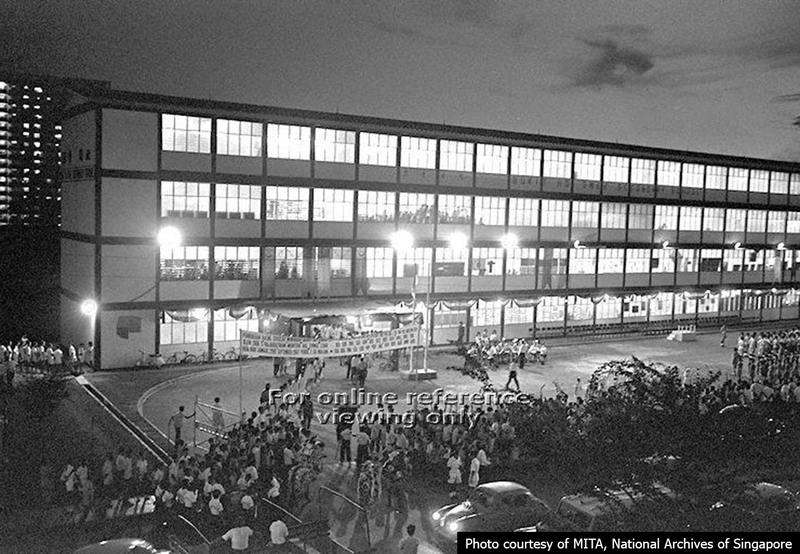 Due to dipping enrolment, they were merged to form the nation’s only centralised institute, Millenia Institute, at Bukit Batok. 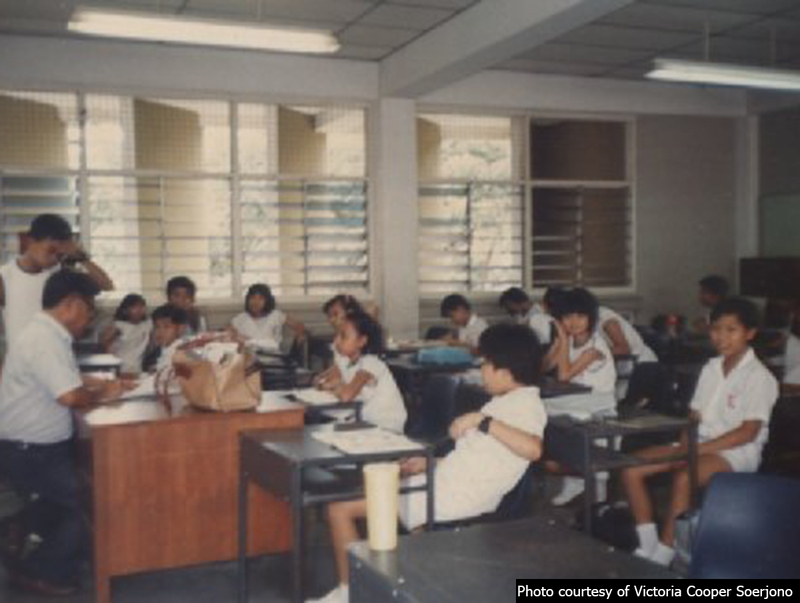 Seletar Institute started in 1988 at the old campus of Upper Thomson Secondary School (now known as North View Secondary). Similarly, Townsville was also in the same year. Like the two institutes mentioned above, they offered a three-year pre-university programme based on the students’ O-level L1R4. However they weren’t as lucky as they were closed down altogether. According to reader Adam, local host/actor Bryan Wong is an alumnus of Townsville Institute. 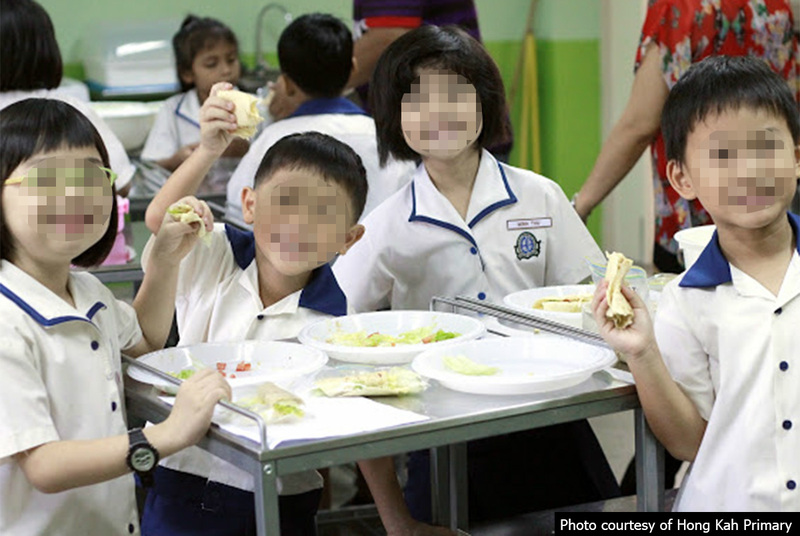 Due to the “Kampung spirit” and small cohort, many of the students ended up in a relationship with no less than 10 couples in a student population with less than 200. The school leadership force a reshuffling of the students to ensure that those in a relationship do not end up in the same class in Year Two. Due to time constraint and the impossibility to cover every single closed/merged schools in Singapore, I’ll briefly mention some of those not discussed in detail here: Bedok Town Primary, Dorset Primary (Farrer Park), Yuqun Primary, Pandan Primary (Teban Gardens), Jalan Kayu Primary, Kebun Baru Primary (Ang Mo Kio), Tanjong Rhu Boys’ School and Tanjong Rhu Girls’ School (both merged to form the now-defunct Tanjong Rhu Primary School), Chong Boon Primary and the list goes on.. and on.. and on. I’ll do a follow-up if time permits, probably in my next long break. Haha. PART 2 here! And joining the list with effect from next year will be.. 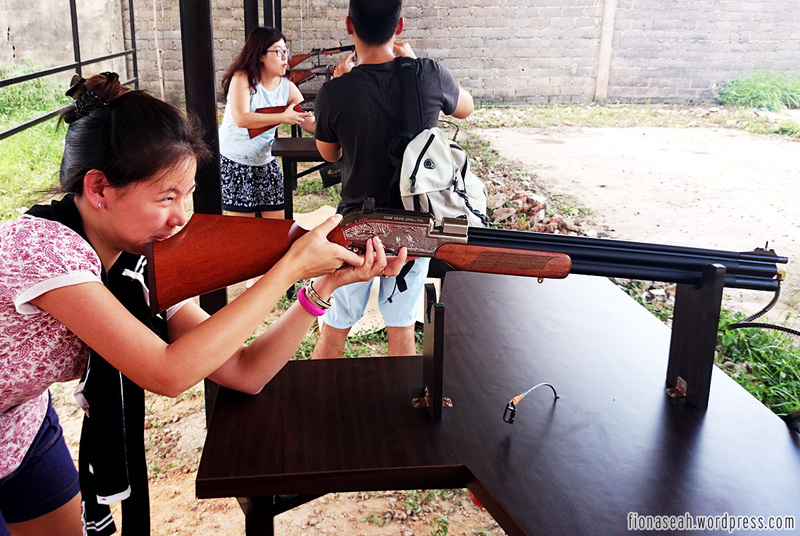 Founded by Wenzou Clan Association in 1933, it was known as Kiau Nam School and classes then were conducted in rental units in the now-defunct Lorong Koo Chye. 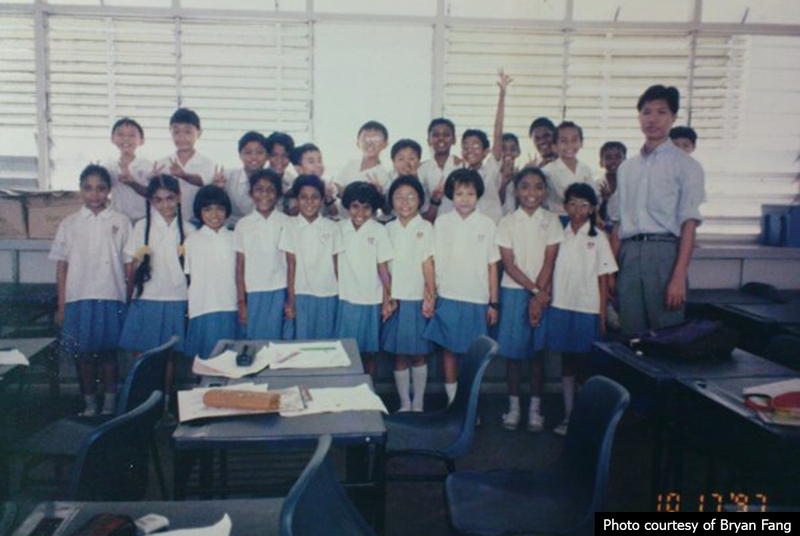 7 years later, students were schooled in a donated house (by the school director of school board) at Paya Lebar Road. Then came World War II, which saw the school closed during the mayhem until it was over. During the war, the school principal and a handful of teachers stood their ground and did not flee, hence were all executed. 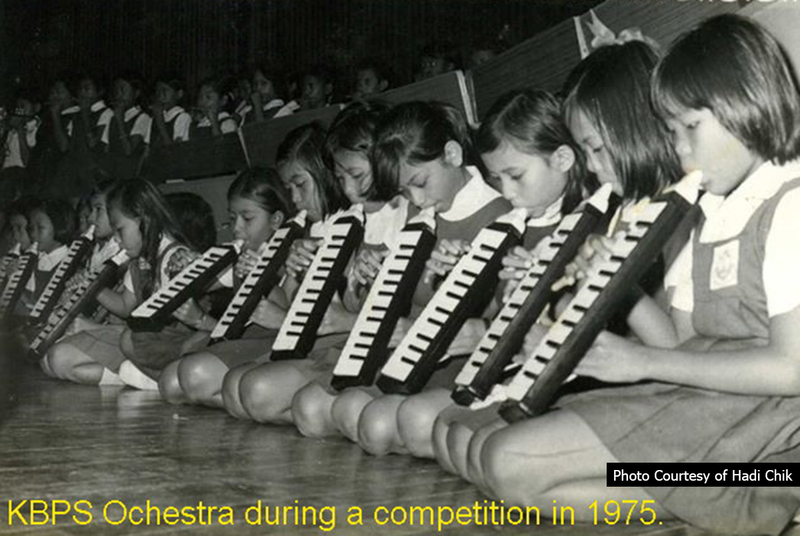 In the late 1950s, classes were also conducted in a Chinese temple to accommodate the growing numbers. And seriously, Angsana?? Couldn’t the naming committee think of something more modern? I used to live about 15 minutes walk away from the school, which started in 1994. Being a resident of Bukit Gombak for 20 over years, I’m pretty familiar with the schools in the neighbourhood. 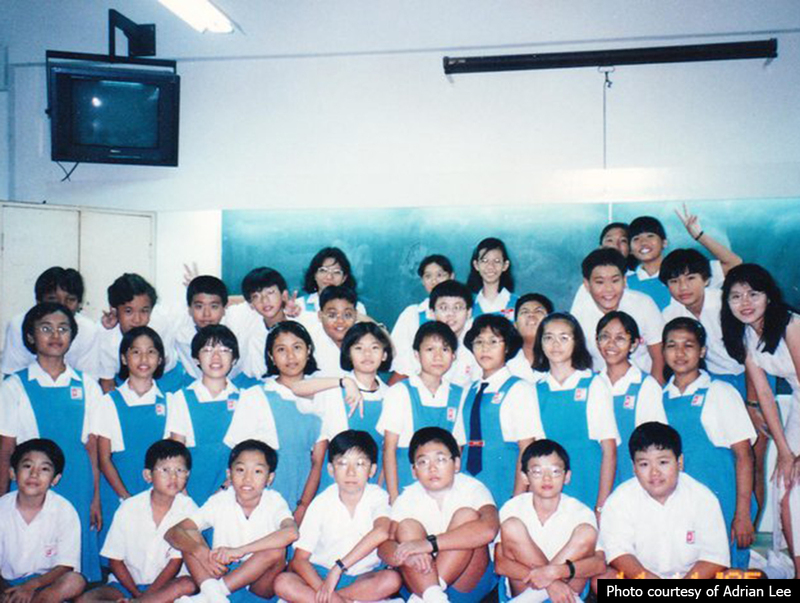 Moreover, two of my best friends were ex-students of Hong Kah Primary as well. From their account, I have to say that this absorption is inevitable. There are 4 primary schools in the small housing area of Bukit Gombak alone – St. Anthony’s (my alma mater), Lianhua, Dazhong and Hong Kah – and sad to say, Hong Kah is the least popular among all. It faces very stiff competition from neighbouring schools like St Anthony’s, the most popular in the area with oversubscription in phase 2C. According to my friends, parents only enroll their kids there as a last resort when they can’t get a spot at St. Anthony’s Some never even considered about Hong Kah Primary. With just 23 applicants for its 150 vacancies in 2014, I’m also unsure of the reason for its unpopularity. Could it be due to its less than exceptional academic performance? Nevertheless, I’m certain that it’s remote location plays a part in its closure. 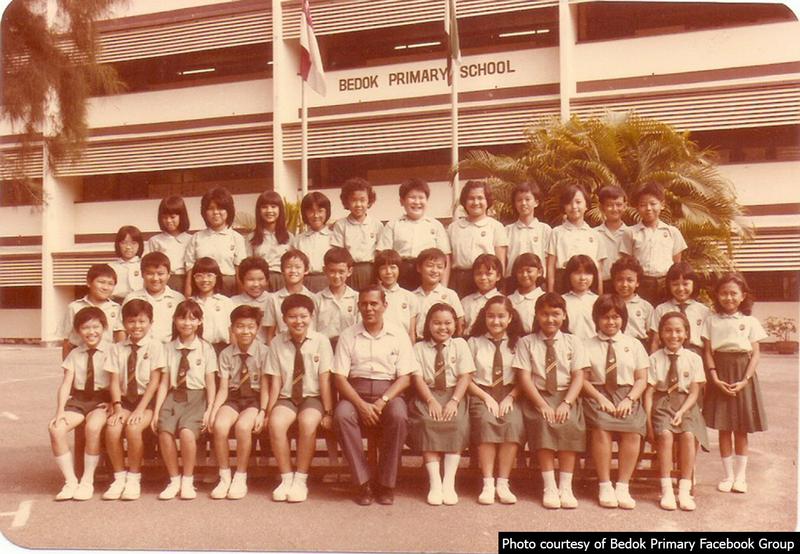 Formerly known as Kaki Bukit Primary School, it was renamed Bedok West when it shifted to 50 Bedok Reservoir in 1984. 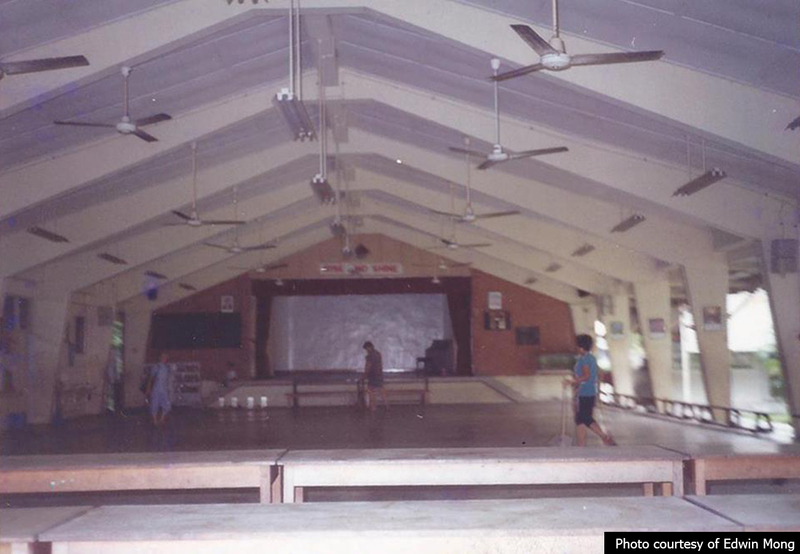 For many years since its relocation, the school functioned as a single session school until the end of 1995 when there was a demand for more places and the school had to function both sessions. Its pupil population increased and hit 1468 in 40 classes in a particular year. 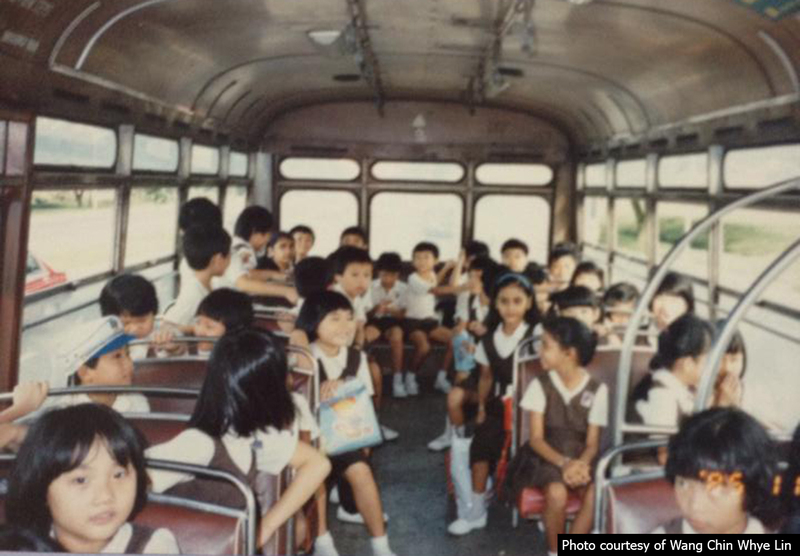 The school serves pupils living in Bedok area and the neighbouring areas such as Eunos, Tampines, Pasir Ris and Changkat Changi. Probably due to population shift, the school suffered a precipitous drop in enrolment in recent years. The last recorded population in 2013 was 600. 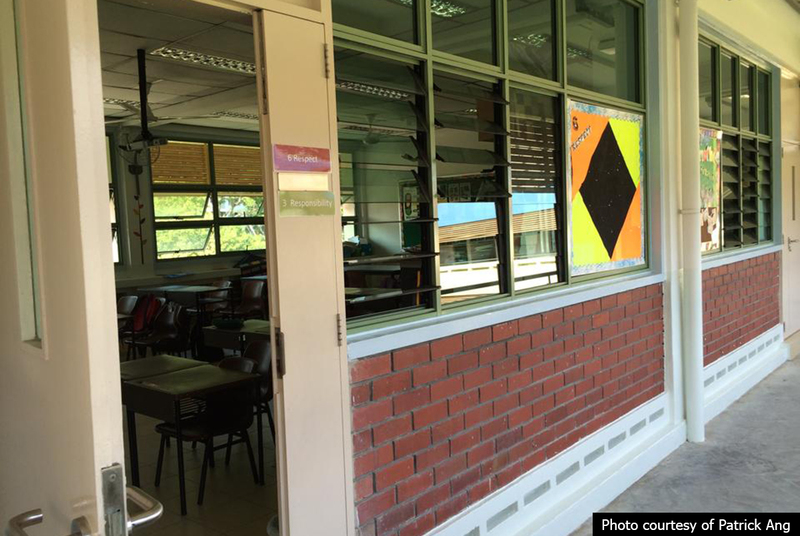 During P1 registration last year, it only had 35 pupils registered out of a possible 150. Looking at these pictures made me reminisce about the past. I’m sure kids born in and before the 90’s had a much enjoyable childhood as compared to the new generation. Have a story to share about your decommissioned school? Let me know in the comments below! I may include that in my next write-up 🙂 And as you can see, some schools mentioned above don’t come with pictures. That’s because I can’t find them online so if you have some pictures of your school, feel free to share them! 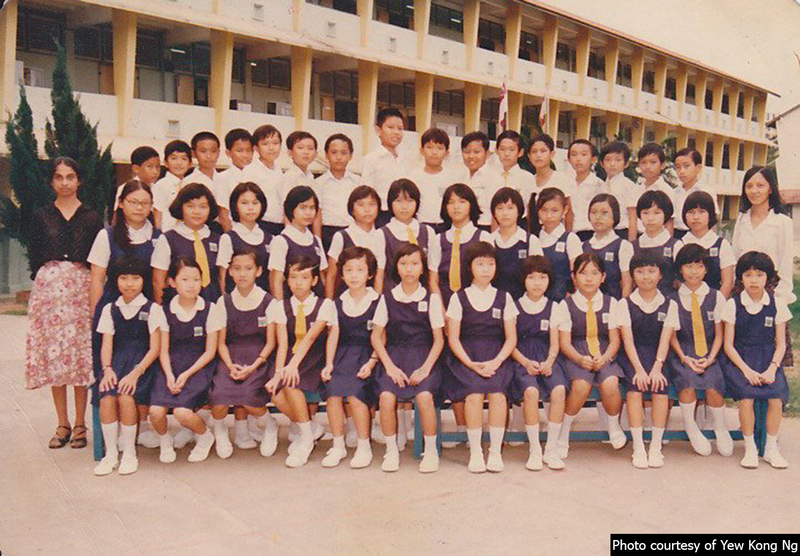 Credits go to sgschoolmemories for their very comprehensive lists of schools in mature estates which gave me a good head start in this blog entry. Special thanks to Kuek Jinhua and Andrew for providing me with additional research for Jervois Primary, Tanglin Boy’ and Girls’ Primary, Kay Siang Primary, May Primary, Boon Keng Primary and Bukit Ho Swee Primary schools.